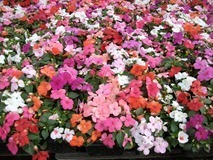 I have a little bit more time today to work on the blog. 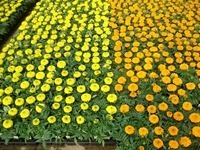 A big THANK YOU to all our customers for you allowing us to provider your stores with our color. 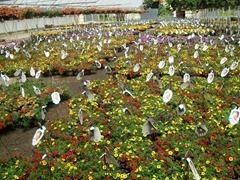 We really appreciate you and want to do the best we can to fulfill all you spring needs. 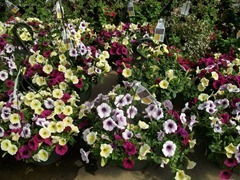 Once again this week, being able to get trucks and drivers has contributed to some problems but we have managed to work through all that. Although the last week or so has not been with out it’s challenges and one big trucking hiccup. 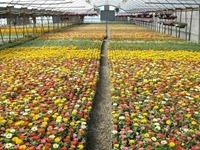 This spring our availability have been all over the place. 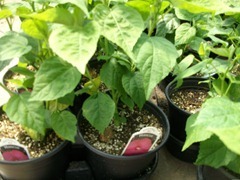 Crops have not been very cooperative in getting ready when they were supposed to. 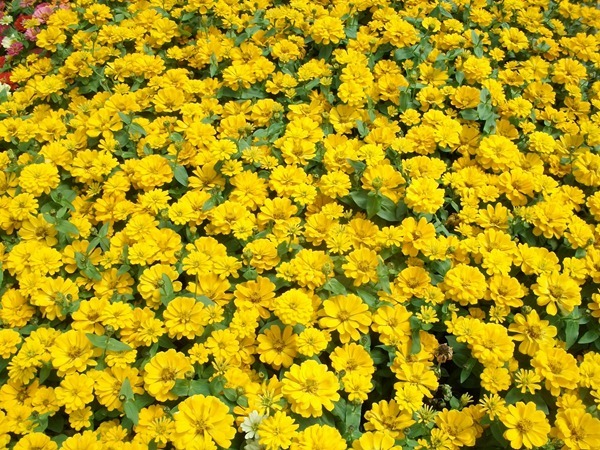 We have been about 50-50 on that. 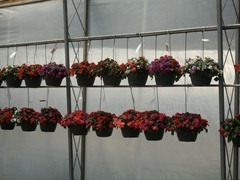 Half of them got ready on schedule and the other half were early or late or in once case both. 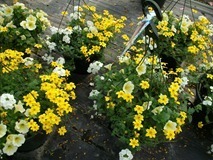 As usual, hanging baskets have been THE items this spring. 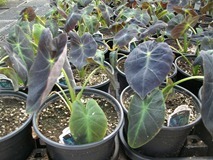 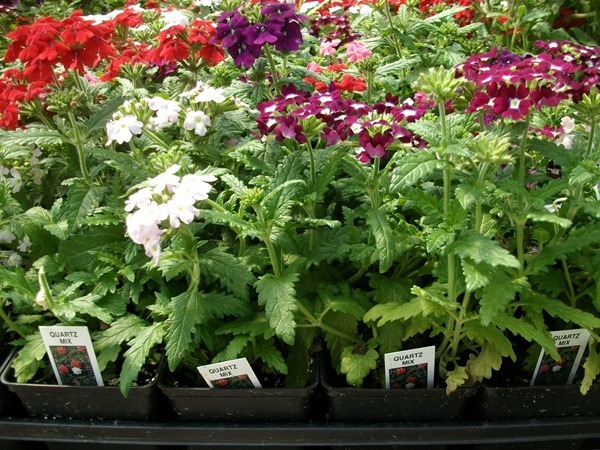 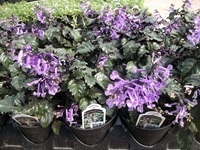 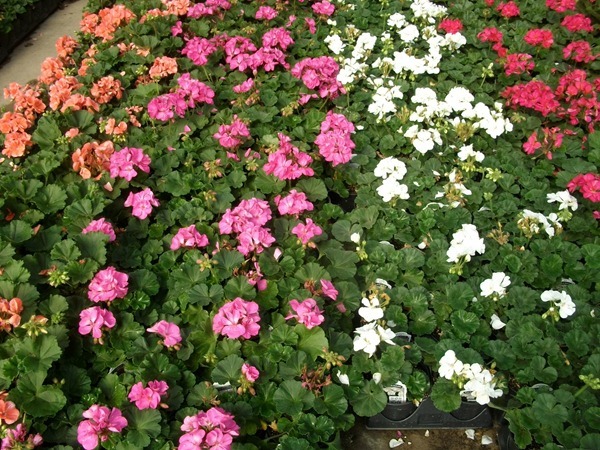 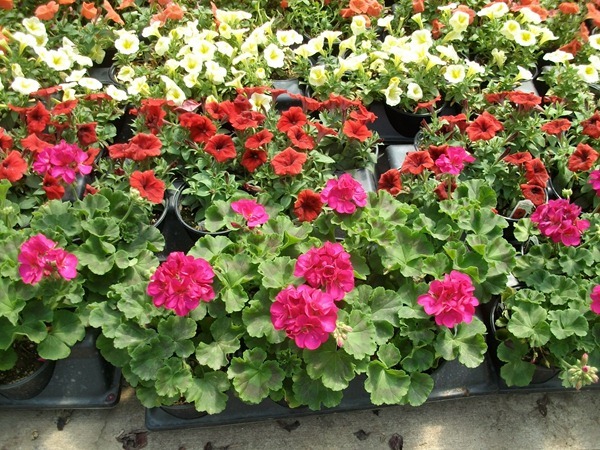 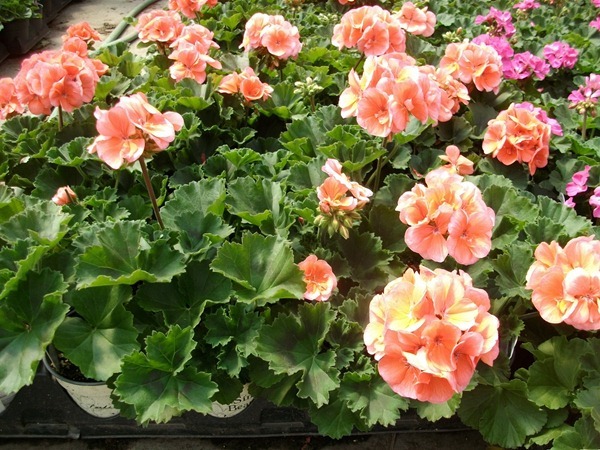 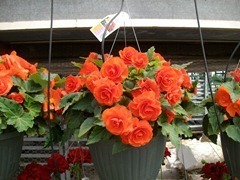 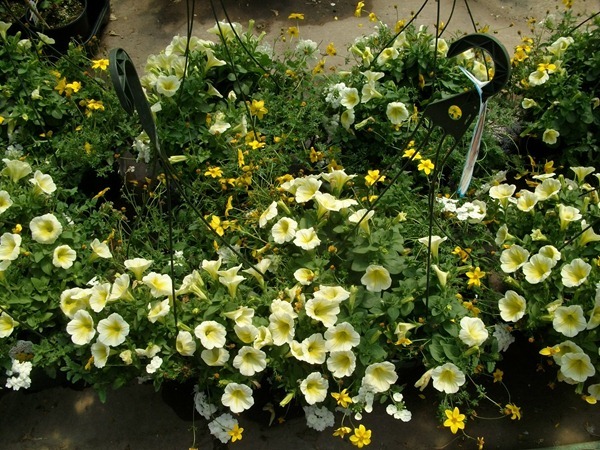 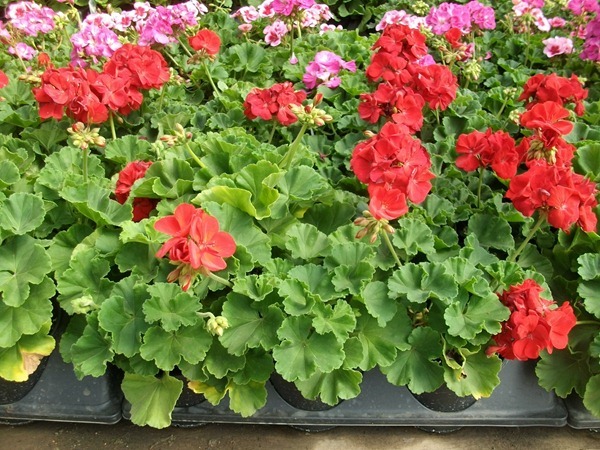 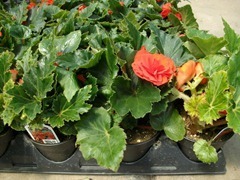 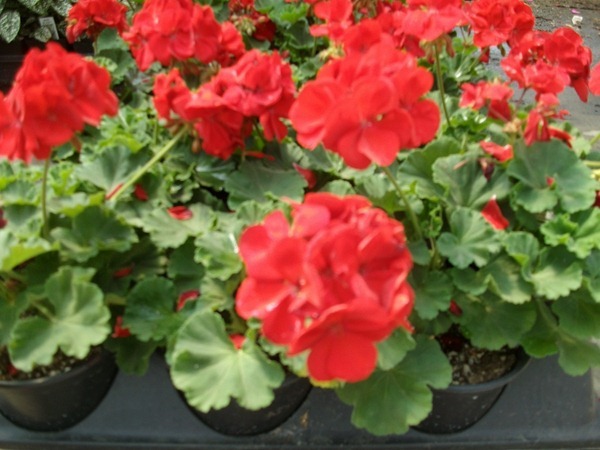 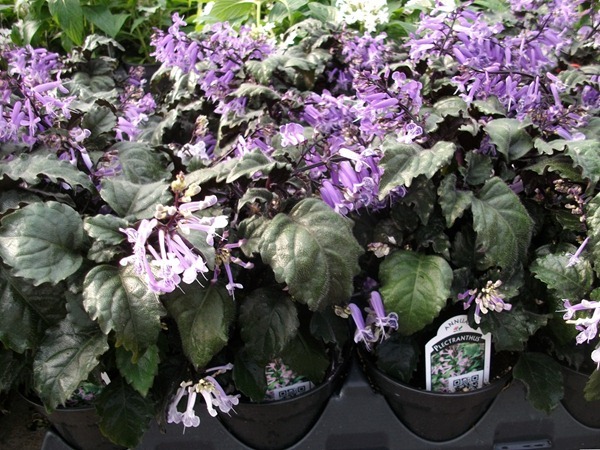 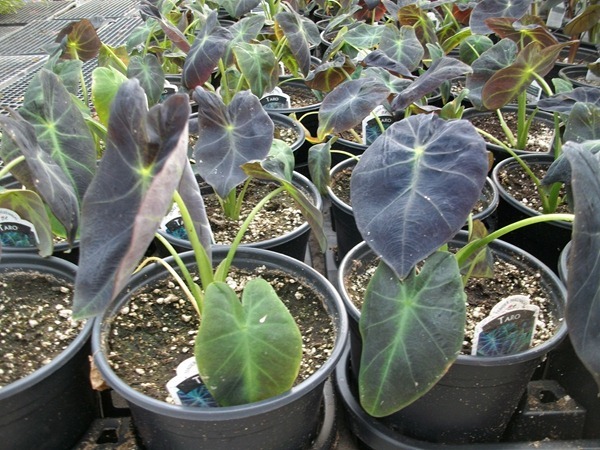 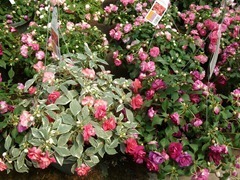 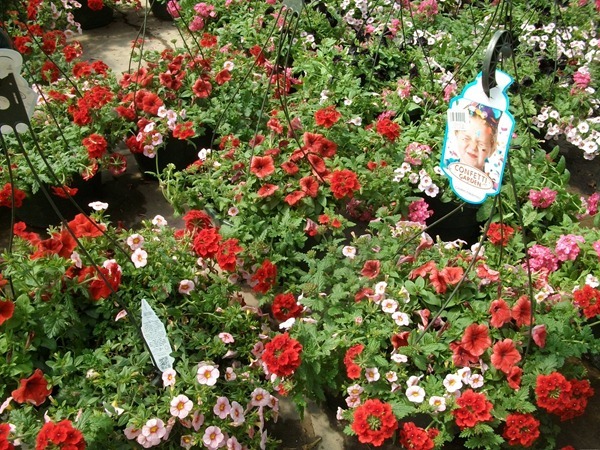 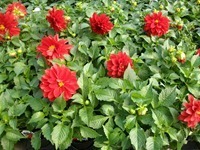 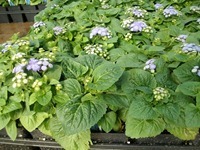 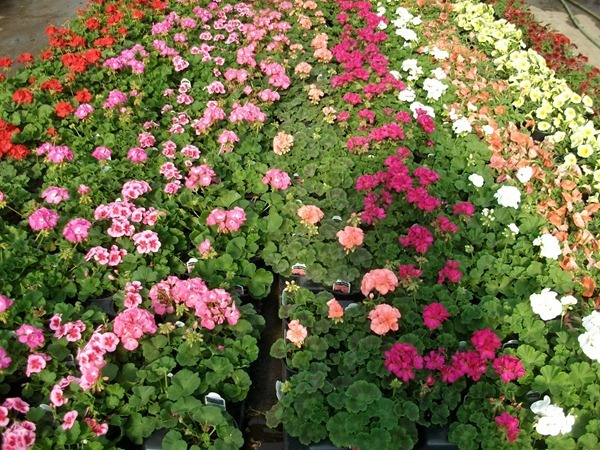 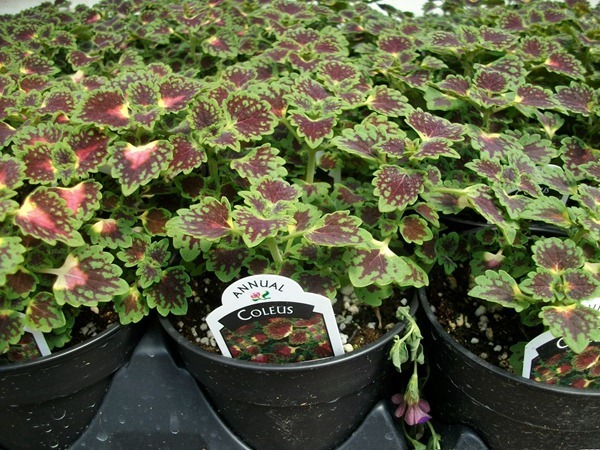 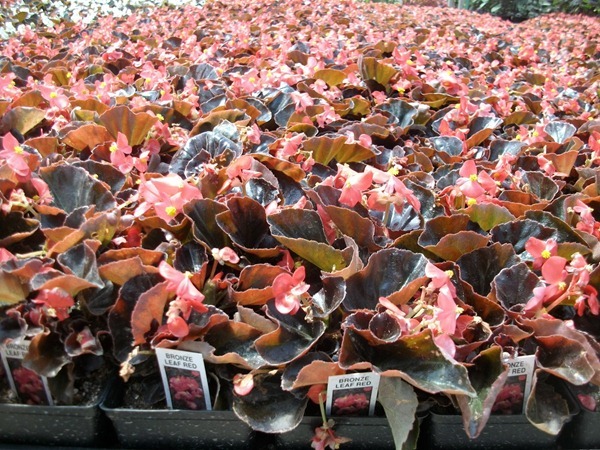 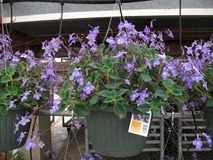 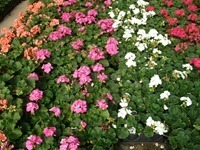 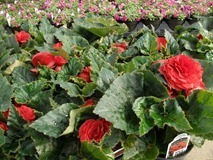 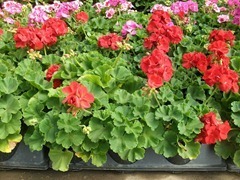 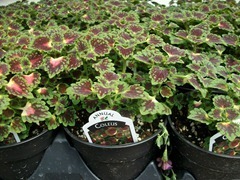 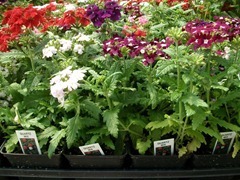 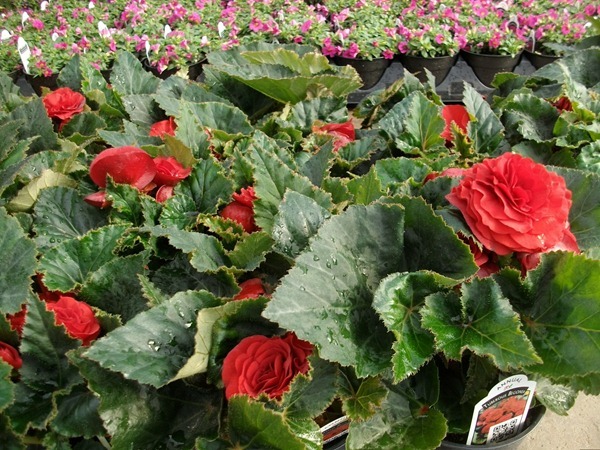 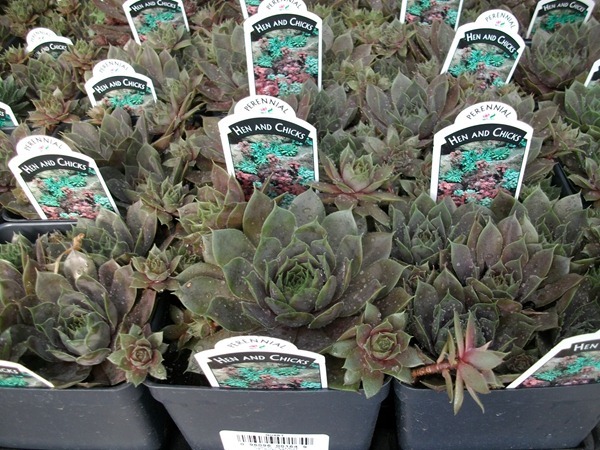 We have not been able to keep enough Calliope Dark Red Geraniums, Calibrachoas, Wave Petunias or Santa Cruz Begonias in stock. 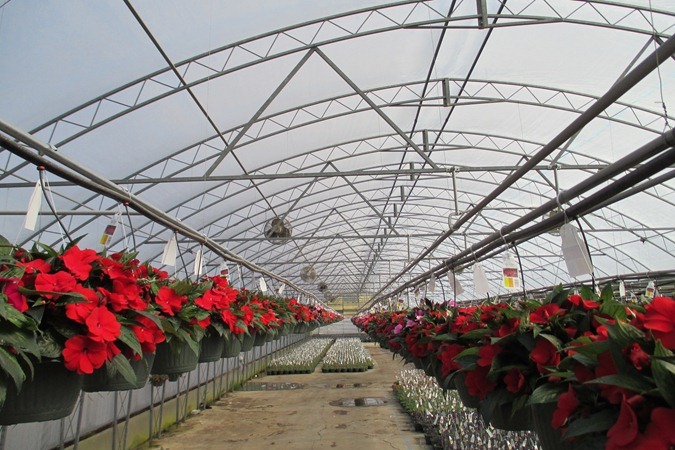 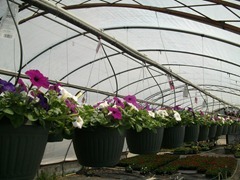 We are looking into ways to be able to increase production on those items for next spring. 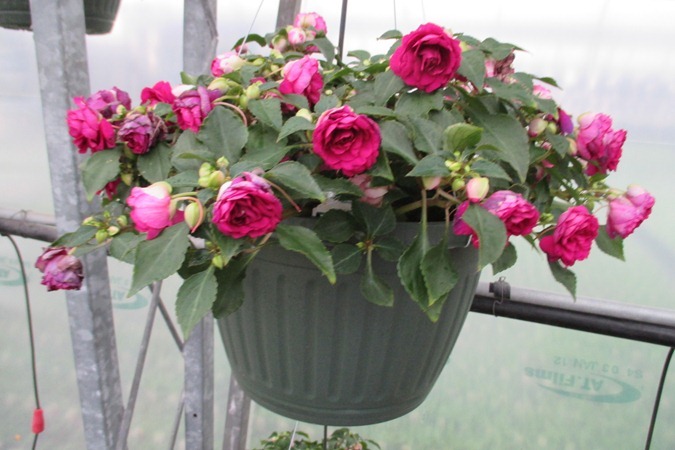 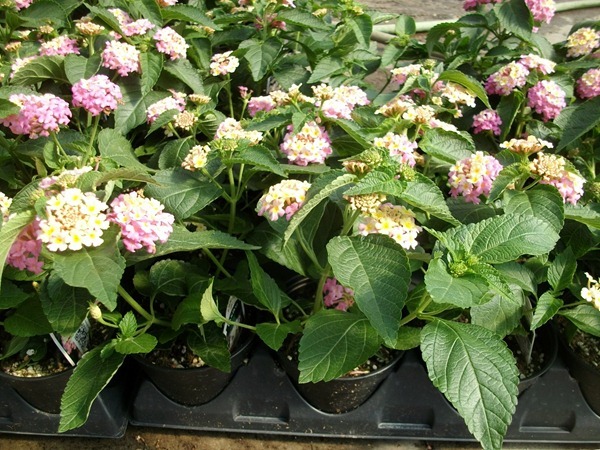 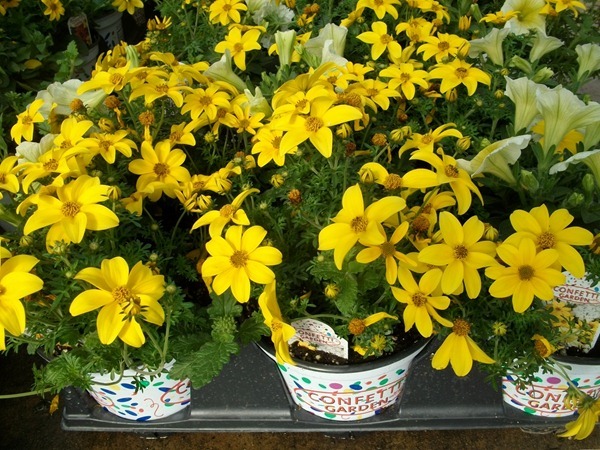 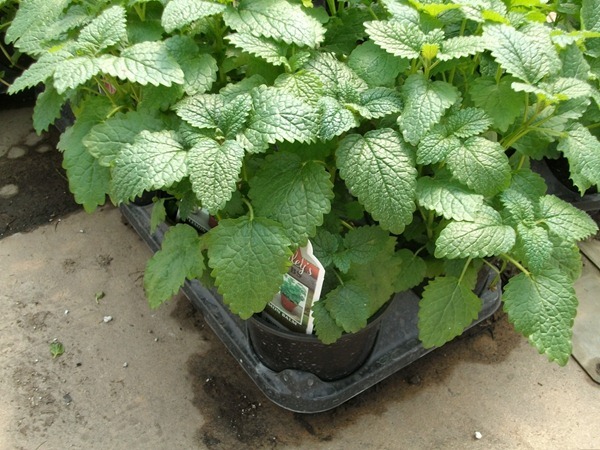 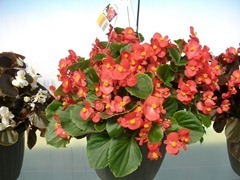 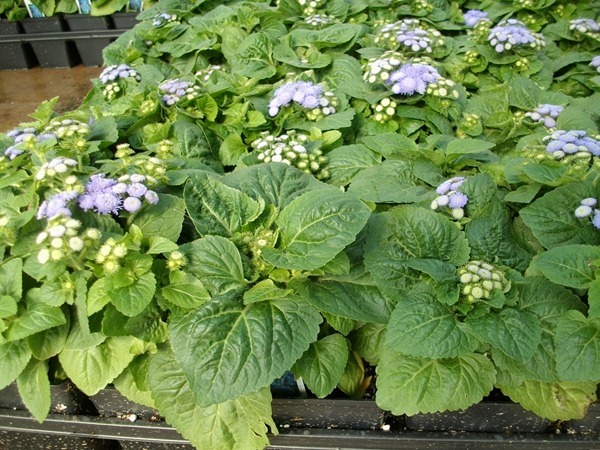 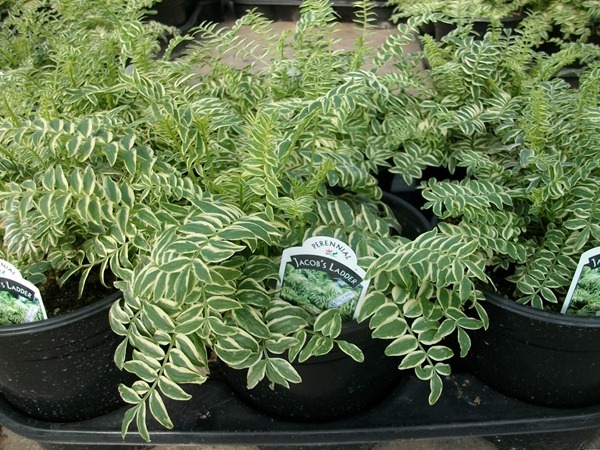 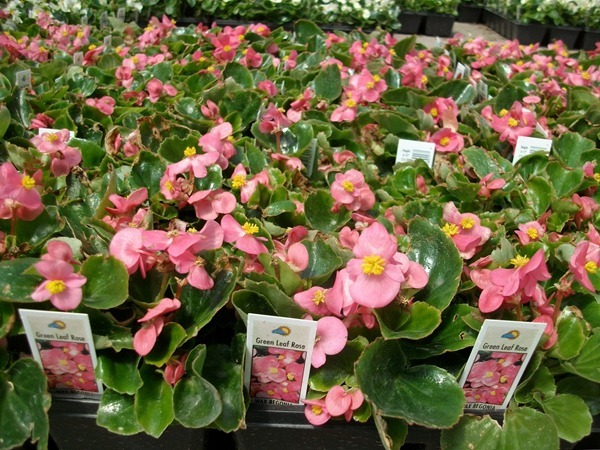 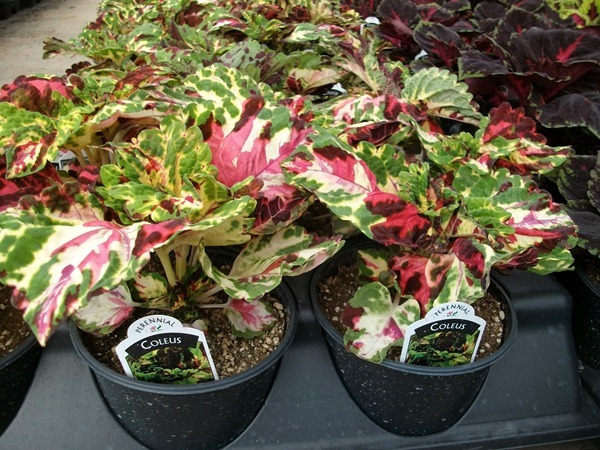 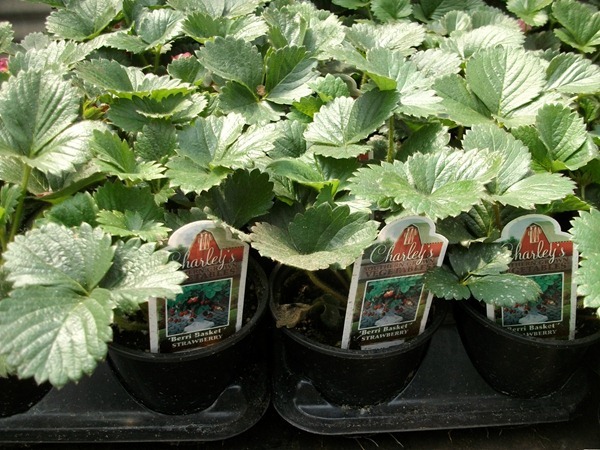 Other hot items have been the #4.5 Bliss Begonias, #4 Herbs, Succulent Bowls, Quart perennials, #12 Confetti Garden baskets and #6 Confetti Gardens. 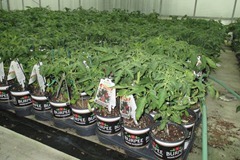 Fortunately, we will still have some of these available for the next couple of weeks plus a lot more great looking items. 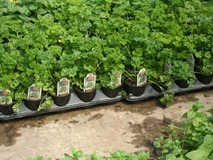 We have had to skip over partial crops and go on to the next one. 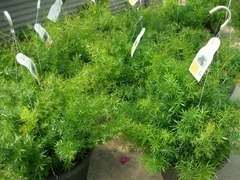 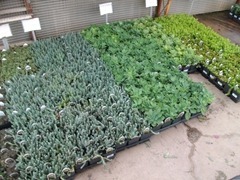 We are cutting back and trimming what we can and hope that sales keep going for at least a week or two after Mother’s Day so that we can sell what we are cutting back. 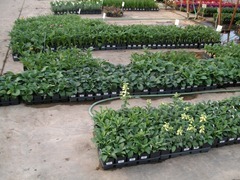 Here’s some of what we will have ready next week. 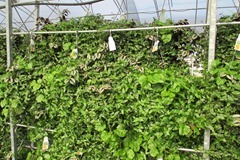 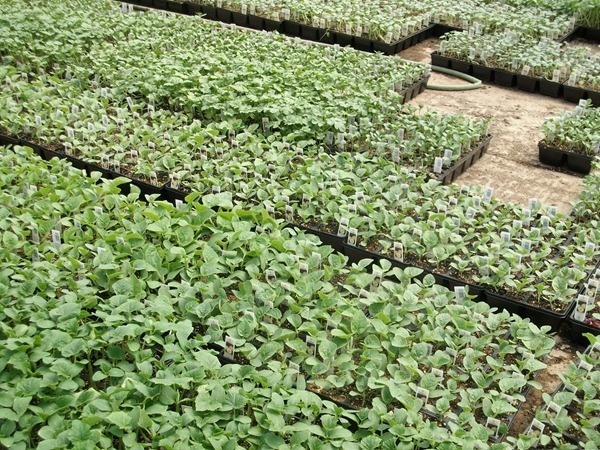 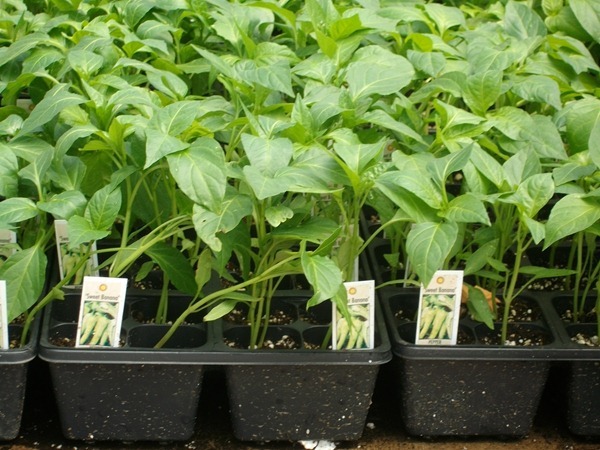 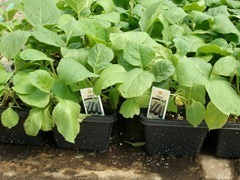 NOTE: We will have another planting of 1204 vegetables that will be ready around the middle to end of next week. 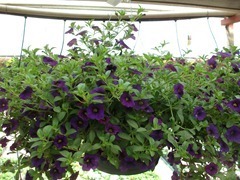 I am having a hard time getting this done. 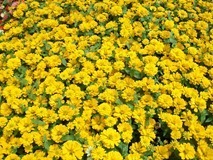 This week keeps beating me to a pulp. 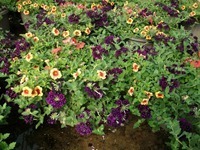 I apologize for the brevity and not having the time to rename the pictures. 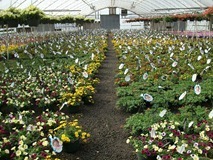 This time of year you just have to do the best you can to get it all done. 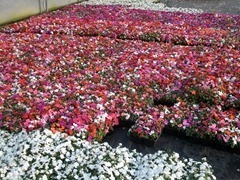 We have been busy here. Lots of overtime put in to load the trucks. 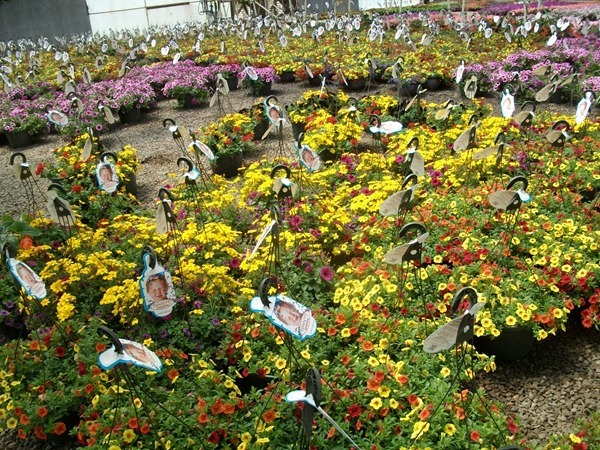 Being able to find drivers has been an ongoing issue this year. 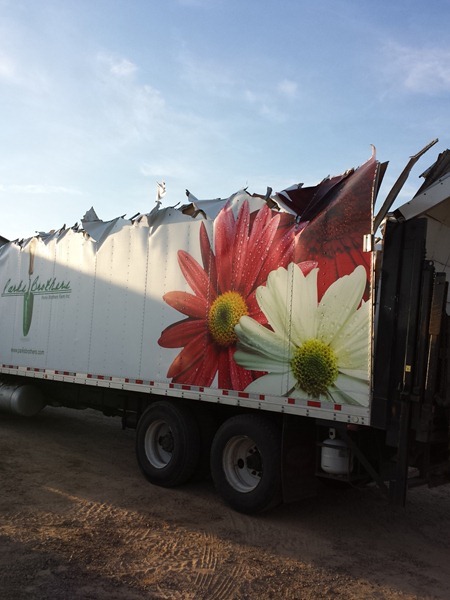 We have run ads, we use driver leasing companies, we have contracted with a trucking company to get power under our trailers and we are still barely able to get enough drivers. 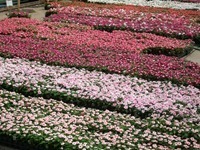 New trucking regulations and hours of service are hampering the trucking industry to move freight. The drivers who are still driving can pretty much pick and choose the loads and jobs they want. 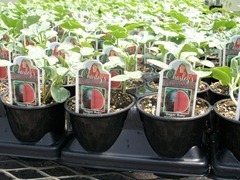 Unfortunately, we are seasonal and they is not too attractive to drivers. 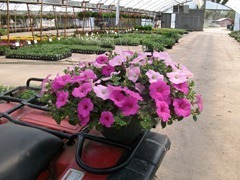 One plus is that we can get drivers home a few nights a week so the ones who want to be home a little more do like the work, but there don’t seem to be enough of them. 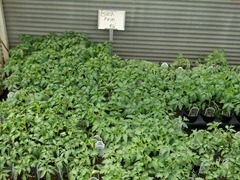 So far we have managed to keep up. There has been a couple of mishaps and we apologize it those affected your order delivery. 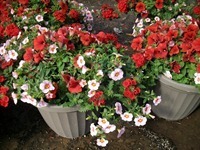 We are working hard to get this resolved and will be on top of this for as long as it takes to keep things running smoothly. On the plus side, the plants are looking great. 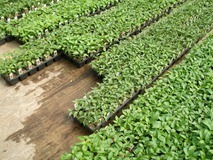 We have a lot of availability again this week despite what we have shipped out. 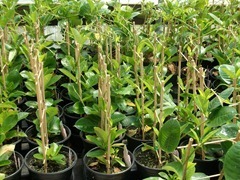 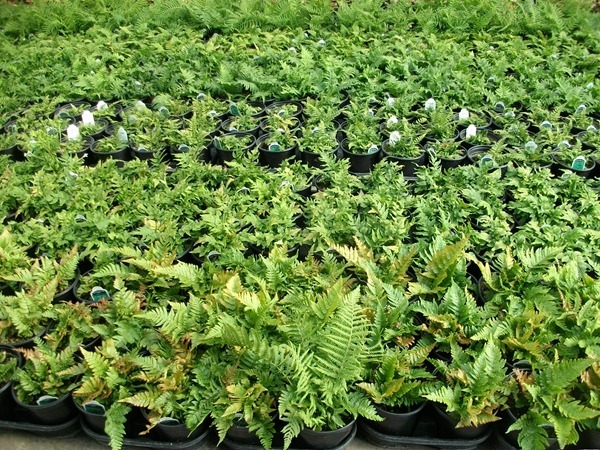 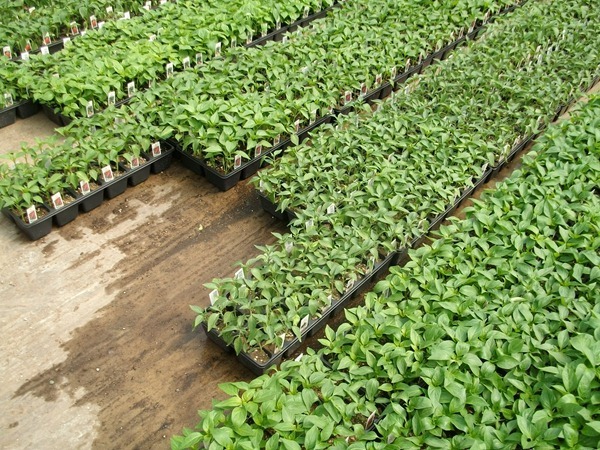 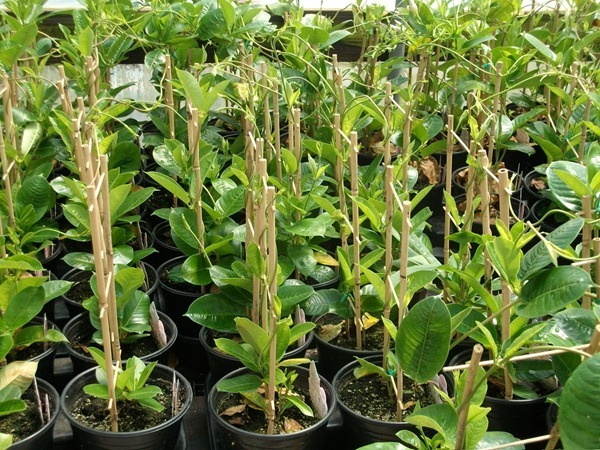 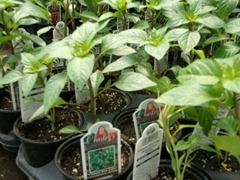 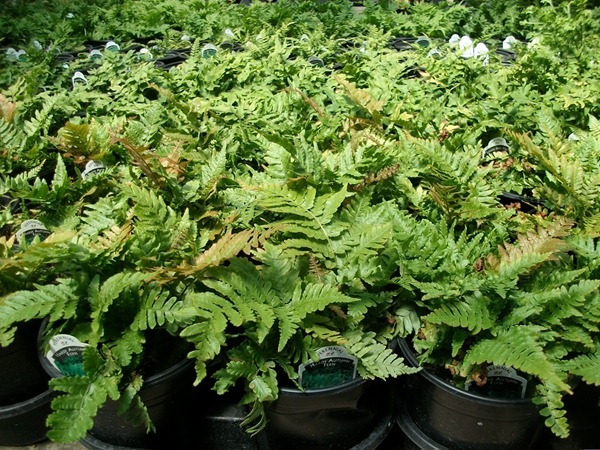 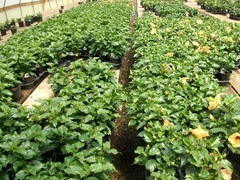 Our plantings are mostly on schedule. 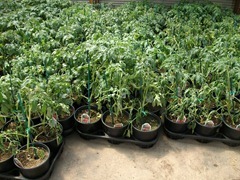 A few items are running behind and won’t be ready for another week. 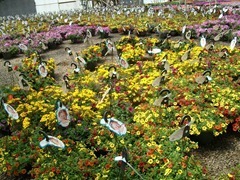 It’s funny. 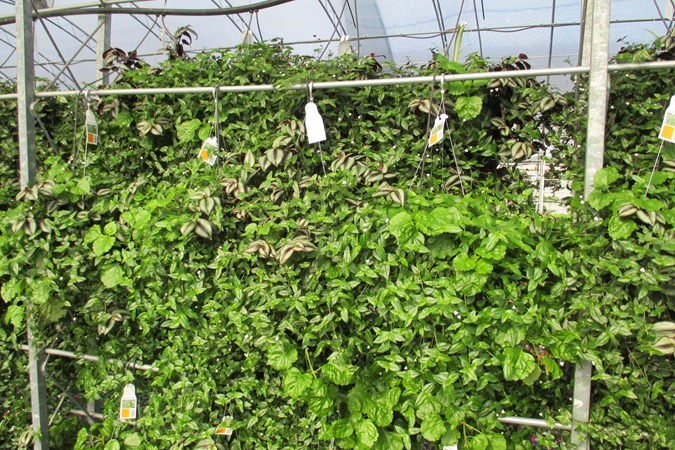 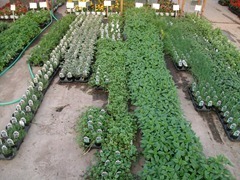 Some plants are behind while others are ahead of schedule. 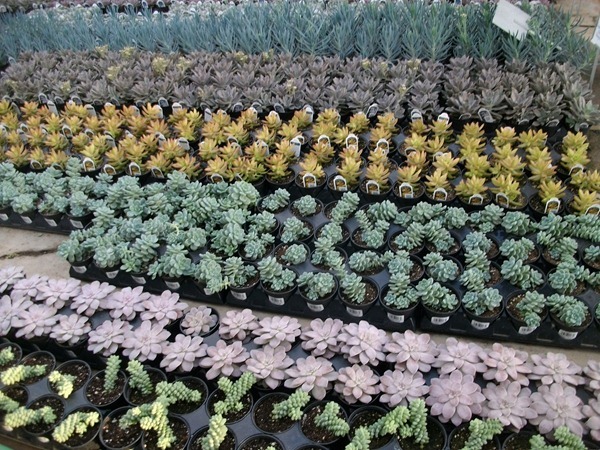 It’s been a weird year for growing. 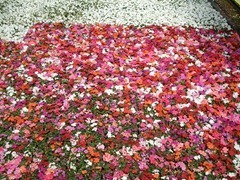 Enough of all that. 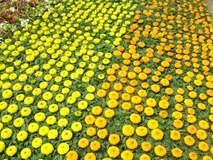 If you even read it a all. Here are the pictures. 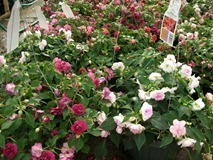 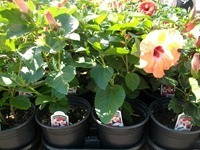 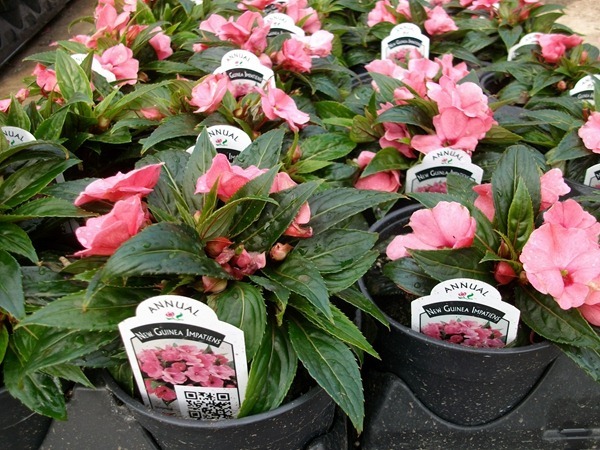 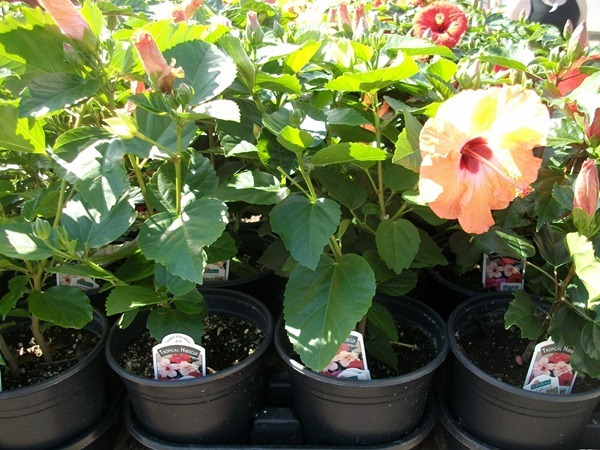 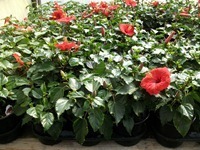 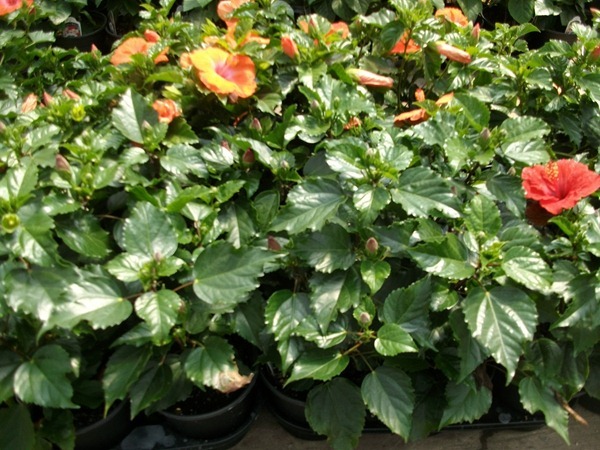 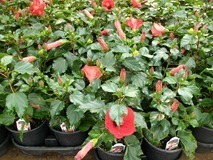 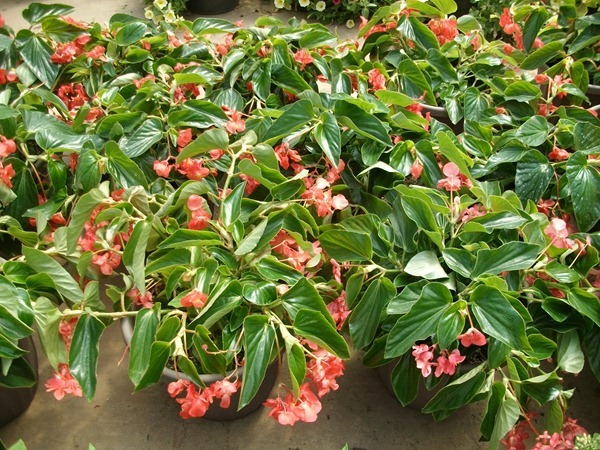 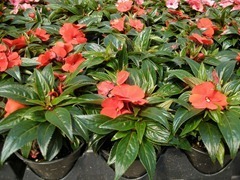 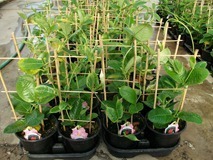 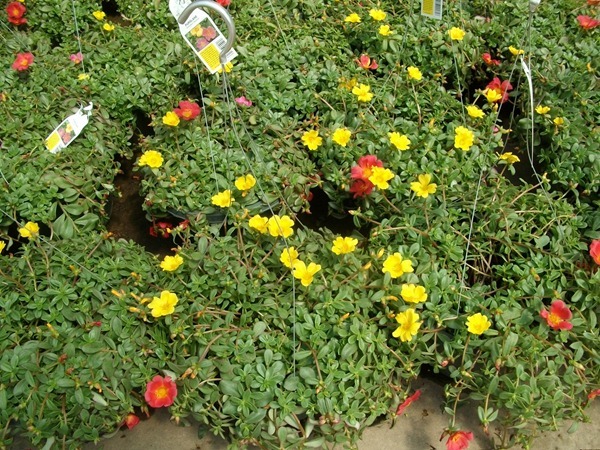 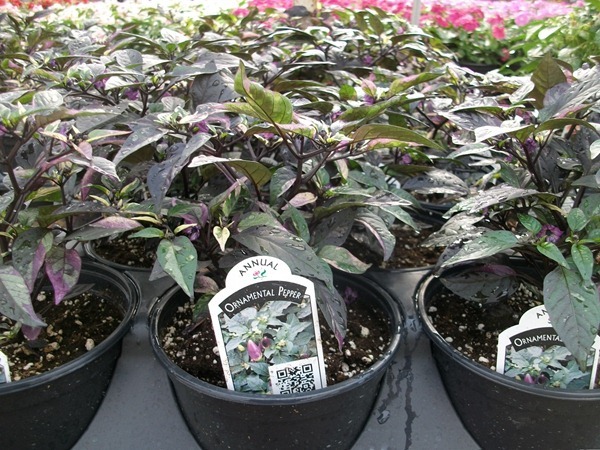 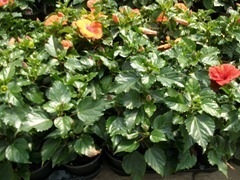 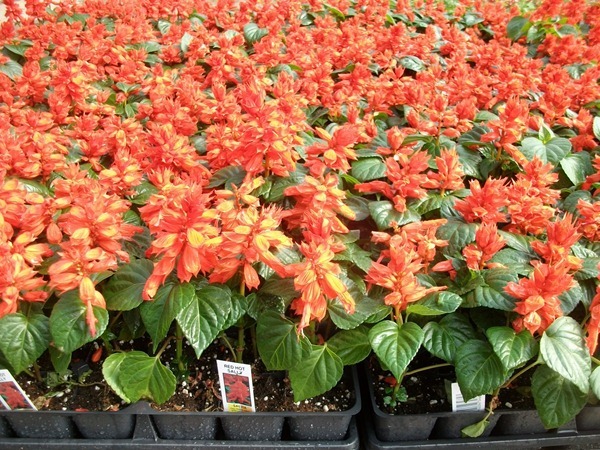 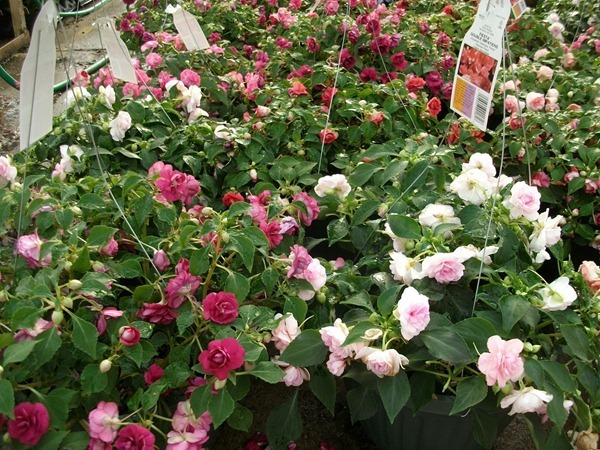 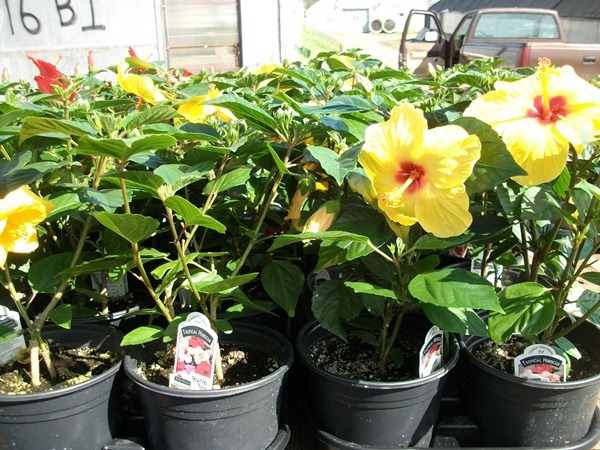 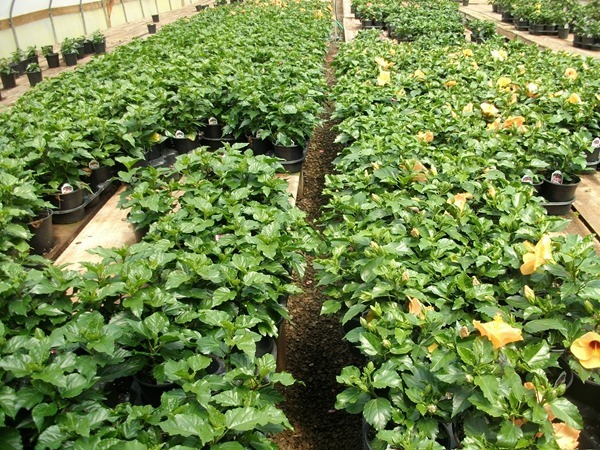 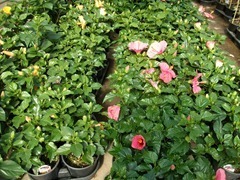 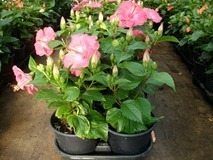 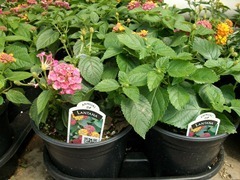 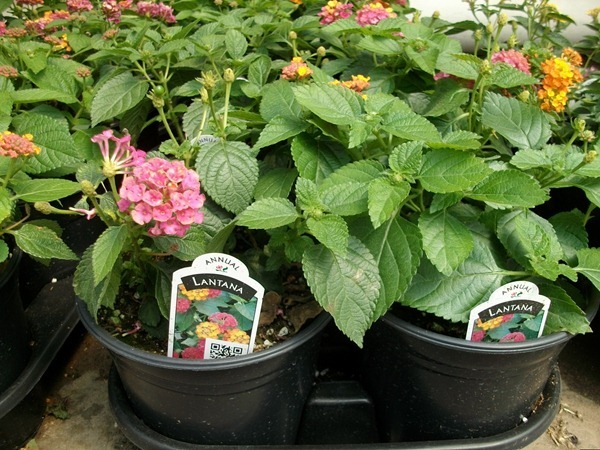 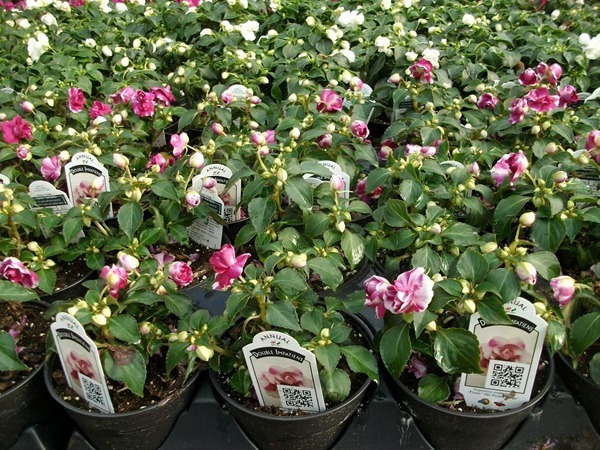 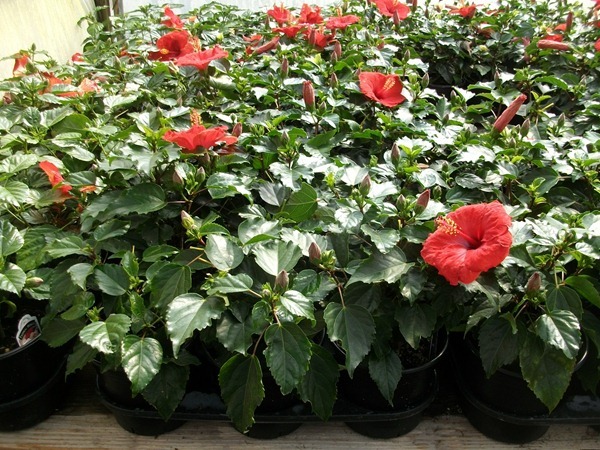 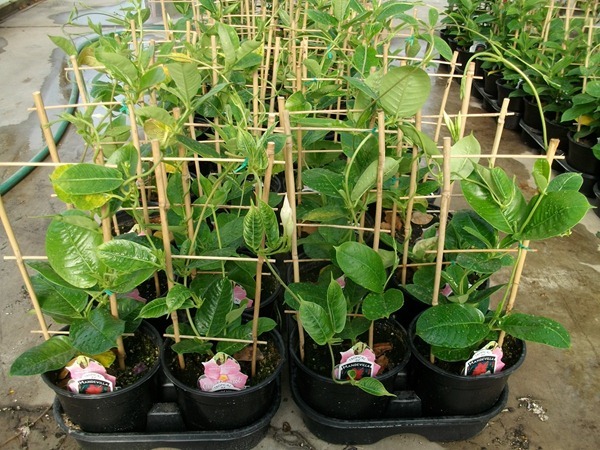 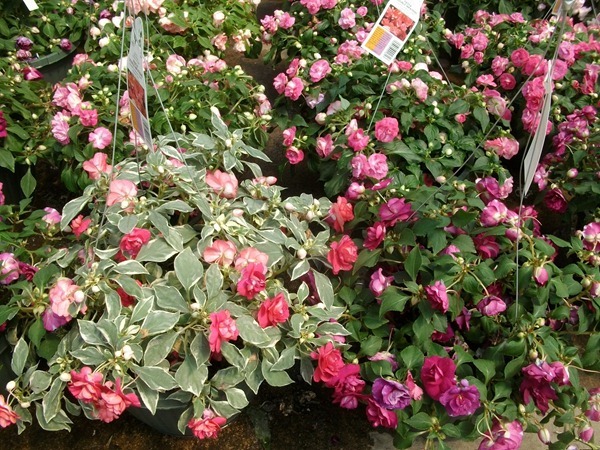 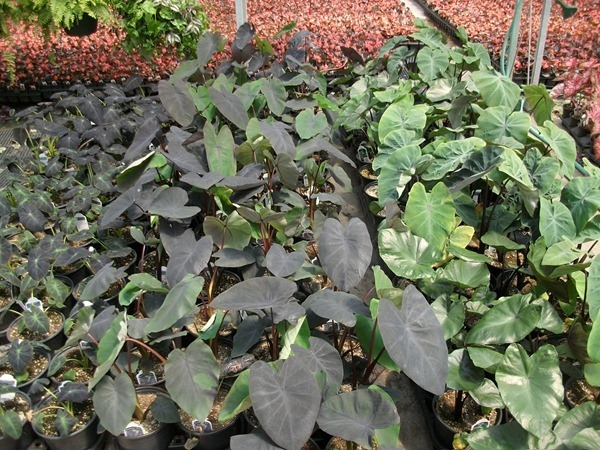 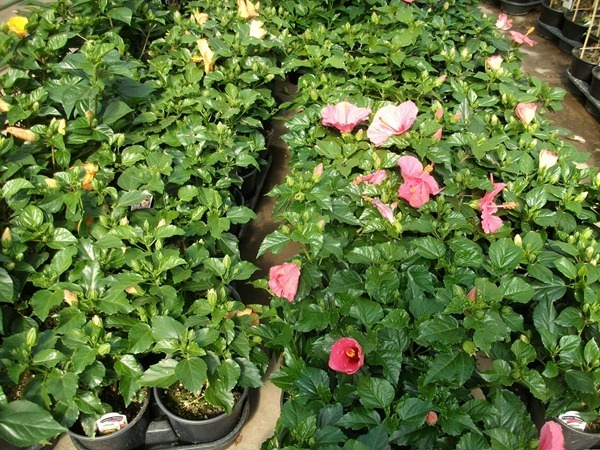 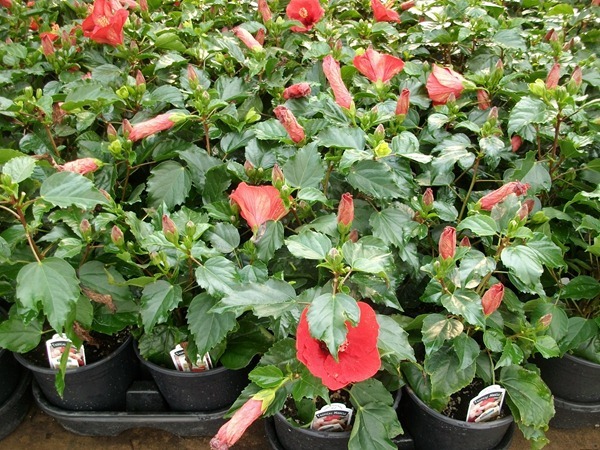 Our gallons availability jumped this week with the additions of most of the tropical hibiscus and some mandevilla. 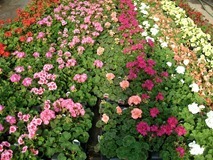 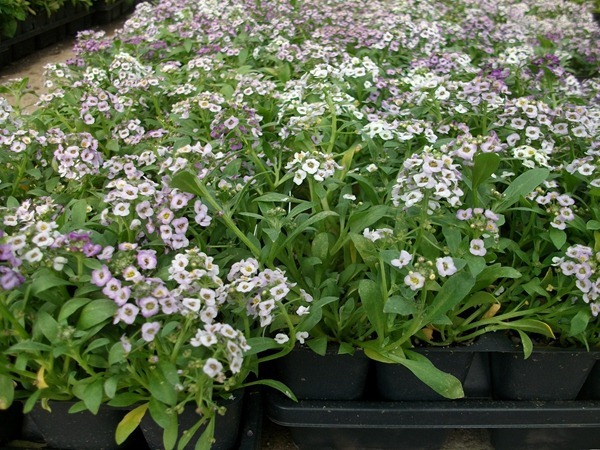 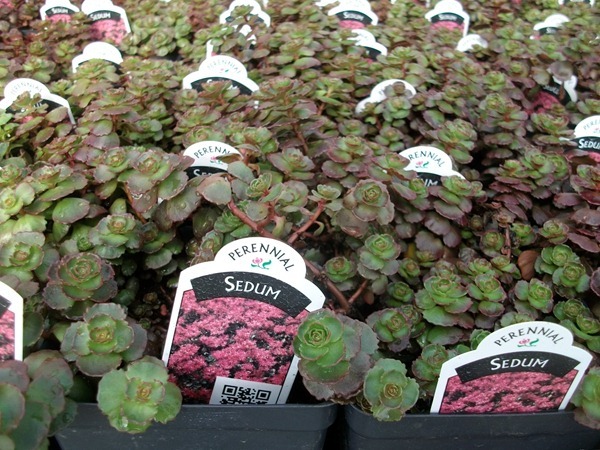 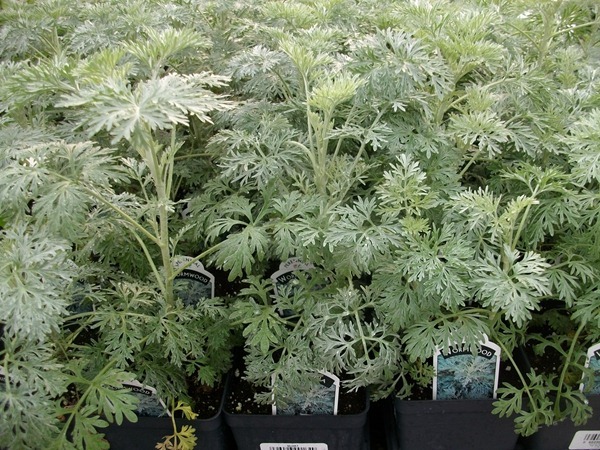 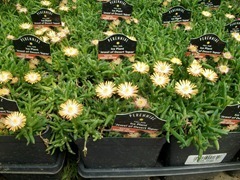 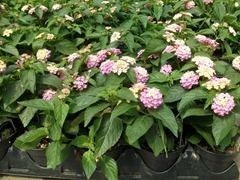 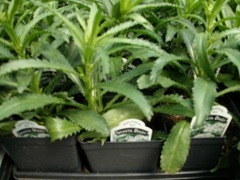 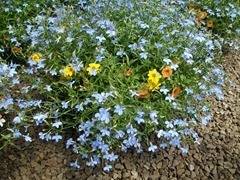 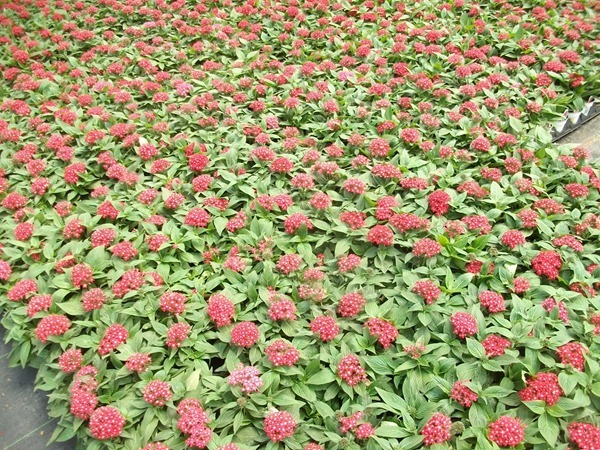 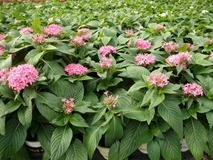 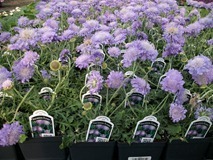 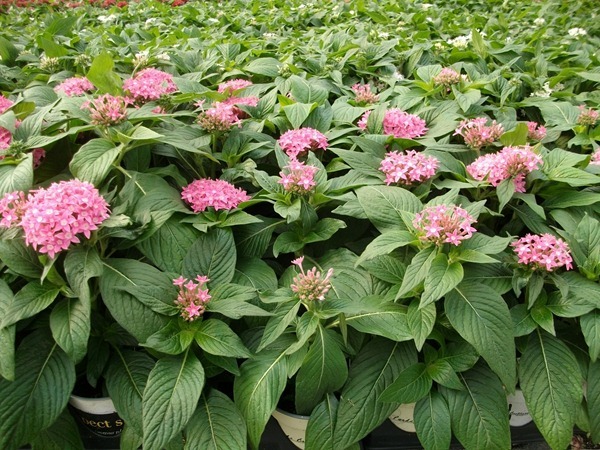 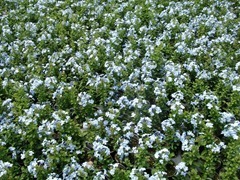 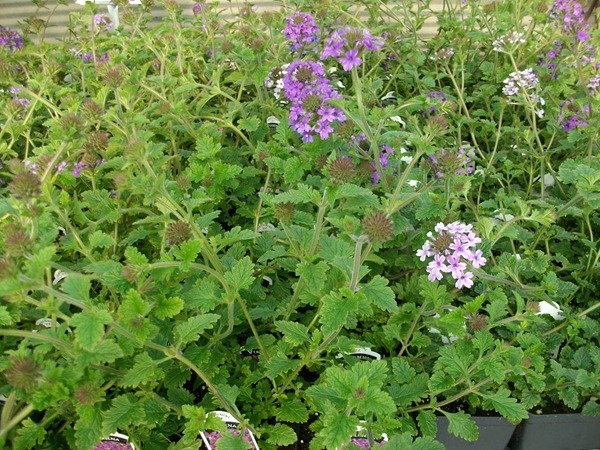 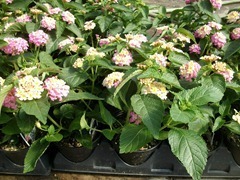 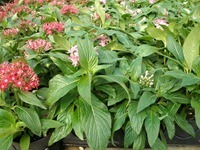 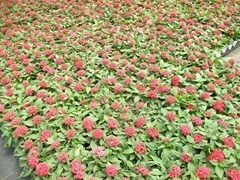 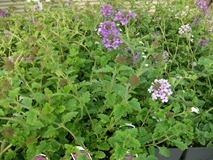 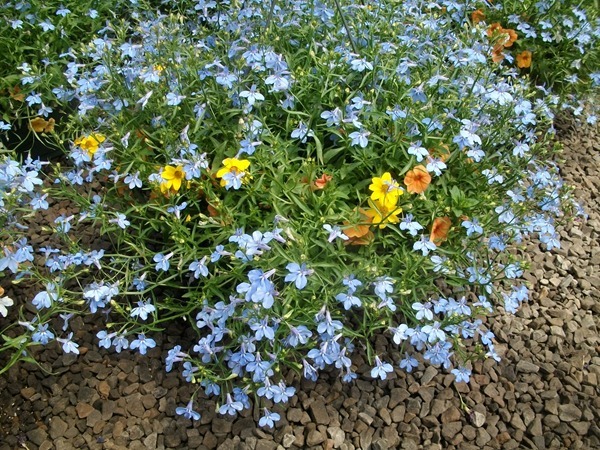 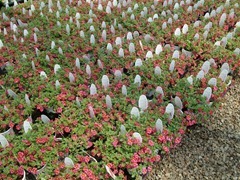 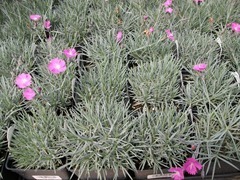 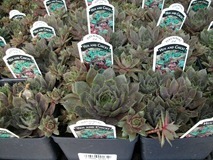 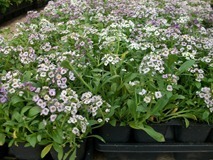 Our quart perennials continue to look excellent. 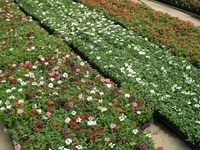 Premium annuals are prime. 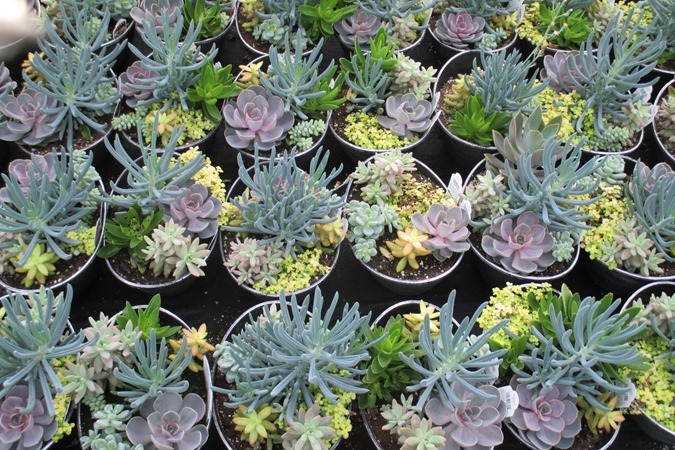 Imagine that. 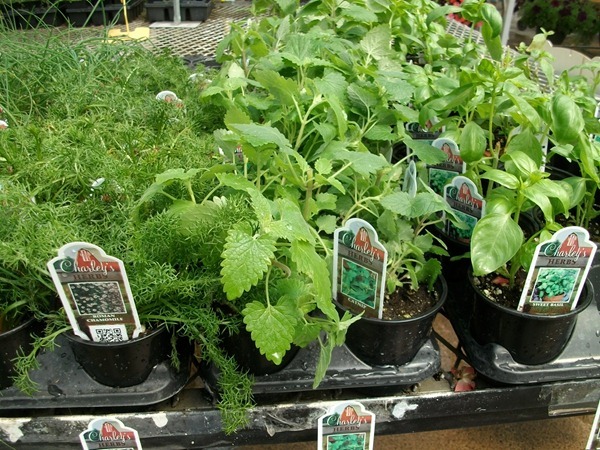 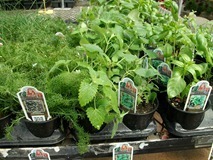 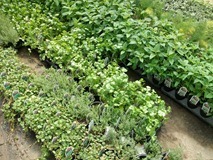 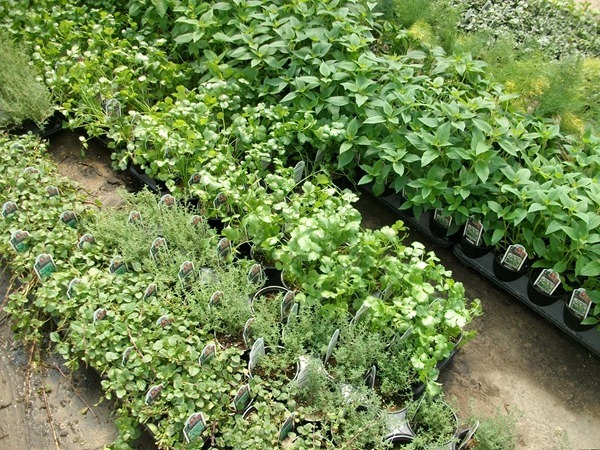 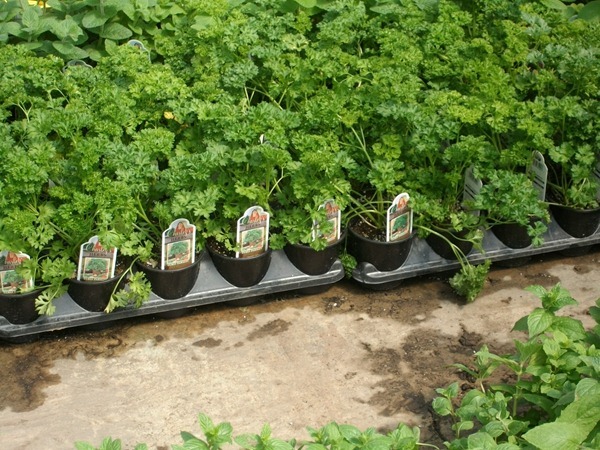 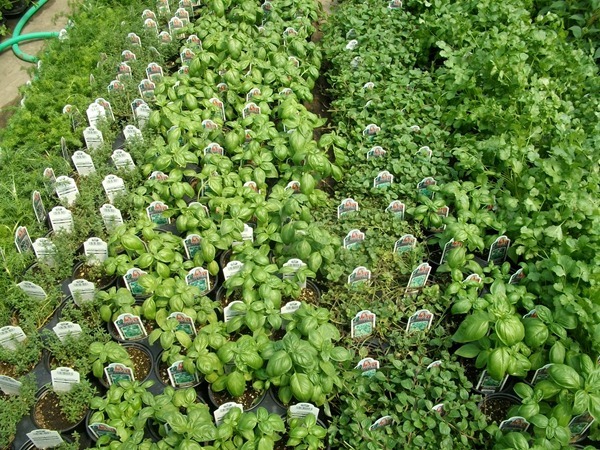 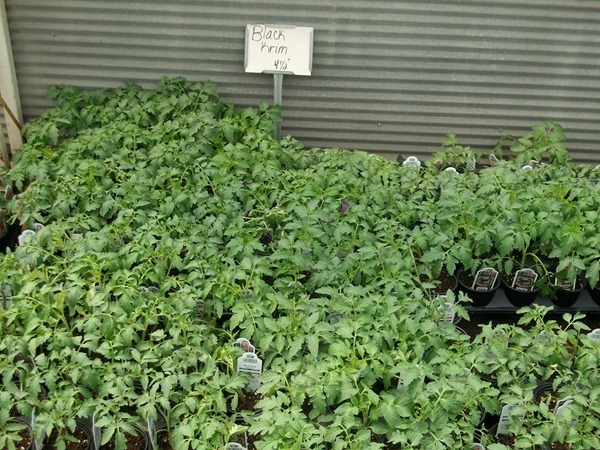 Lots of vegetables and herbs are ready to plant. The Micro Tom tomatoes in 1 gallon pots already have micro tomatoes on the plants and the vines themselves don’t get much bigger. 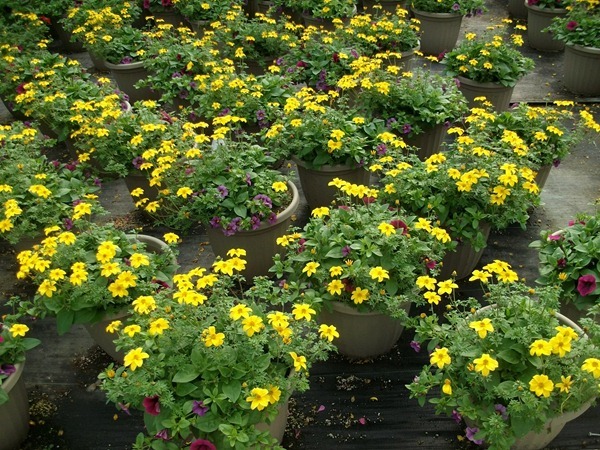 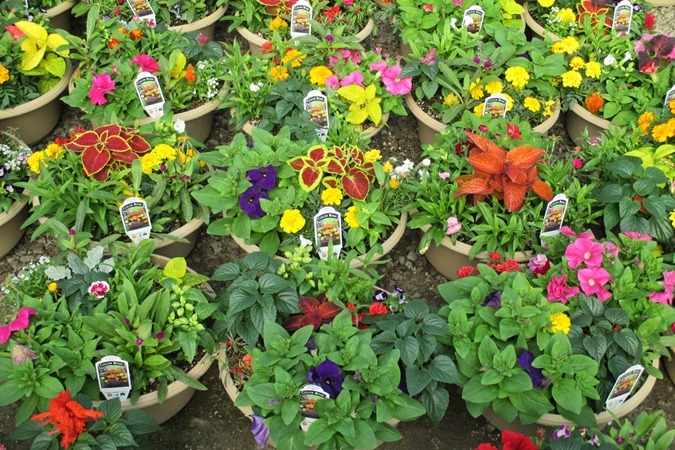 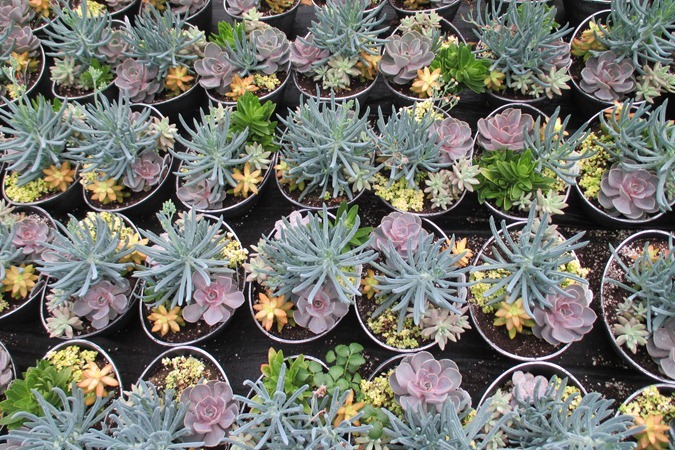 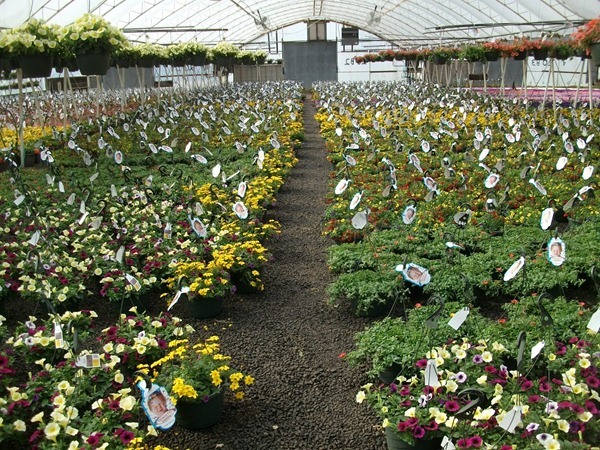 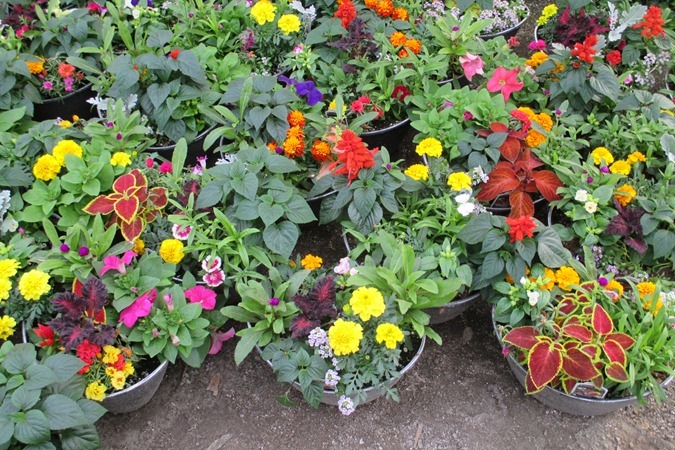 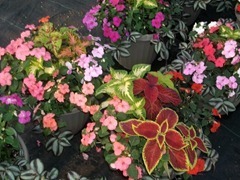 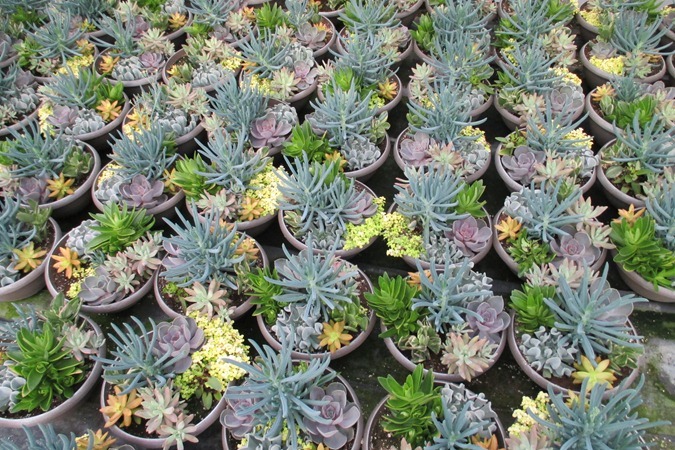 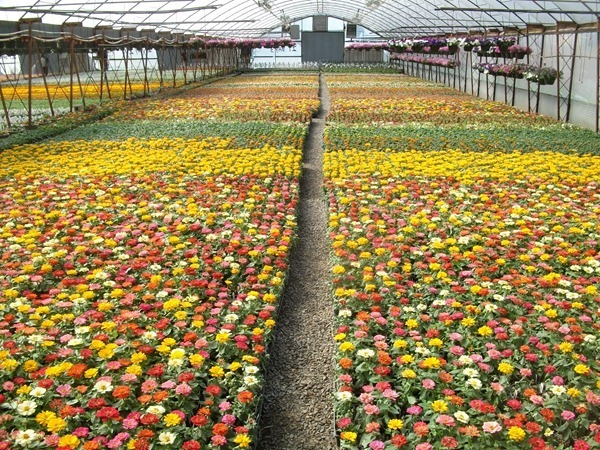 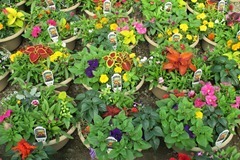 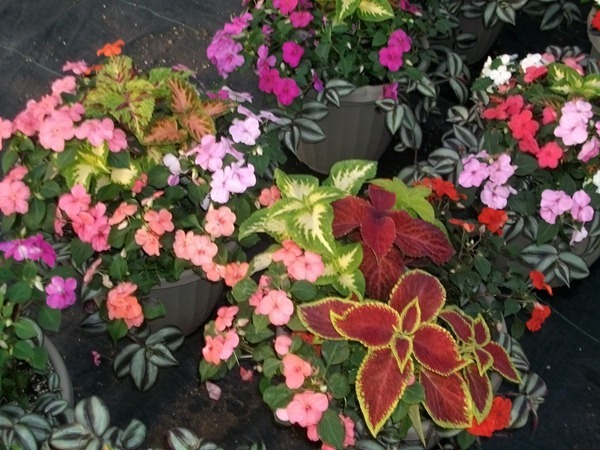 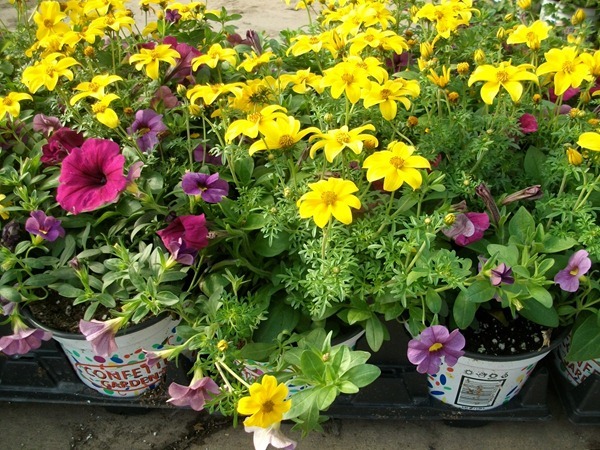 Lots of color in our #6 pots. 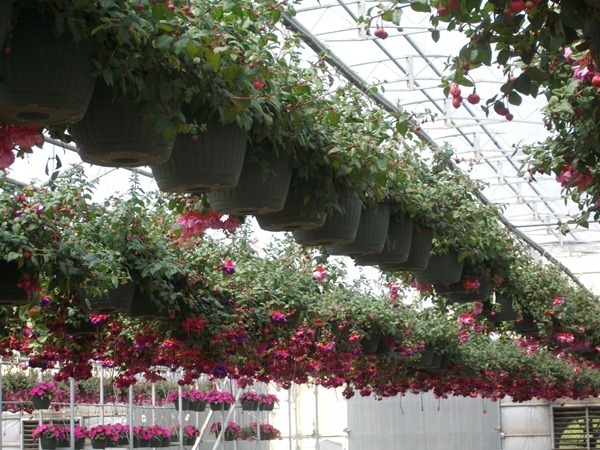 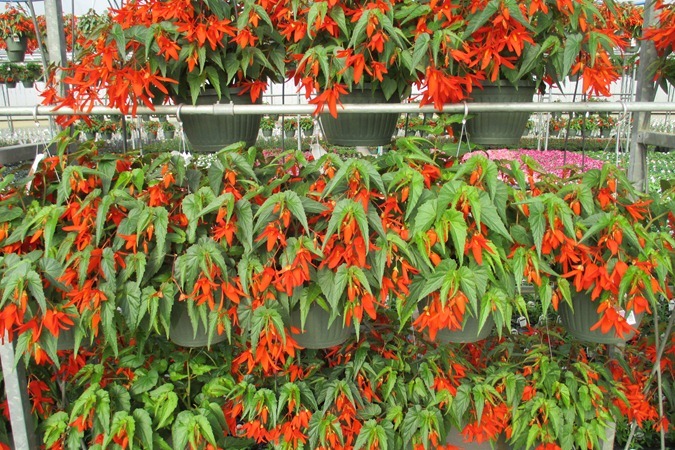 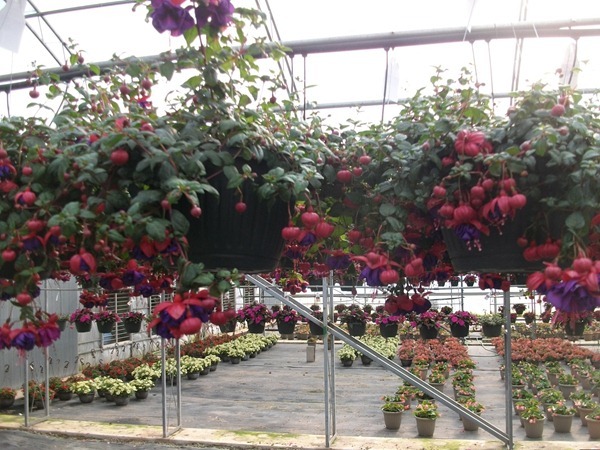 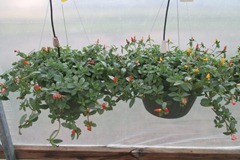 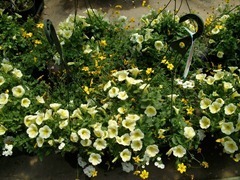 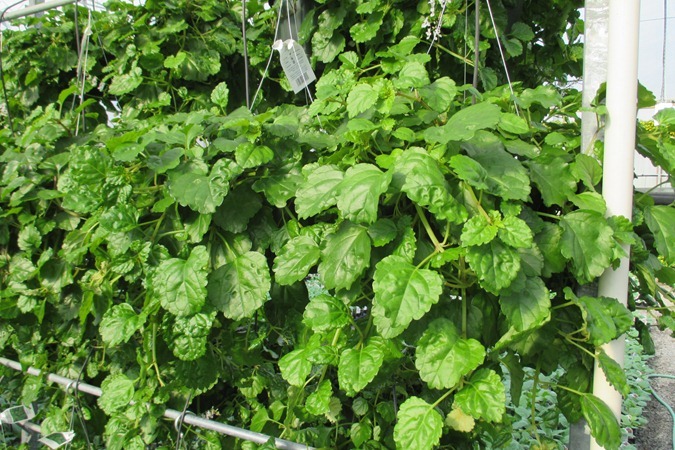 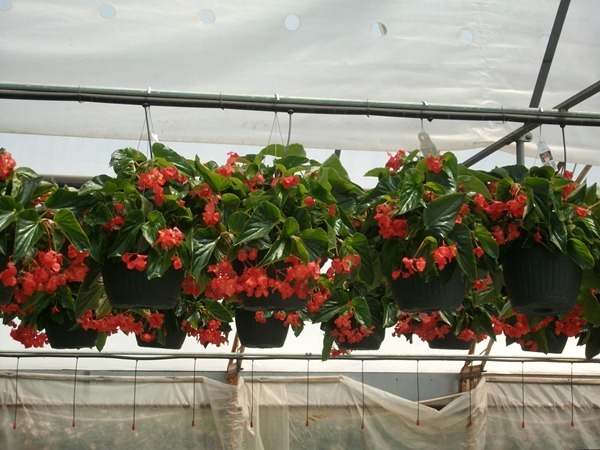 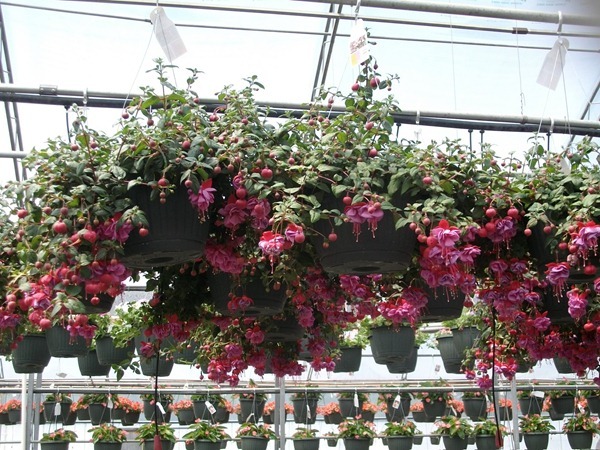 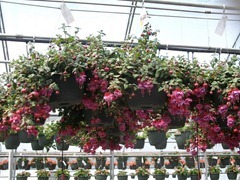 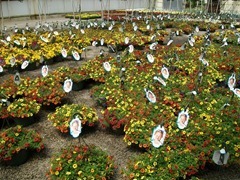 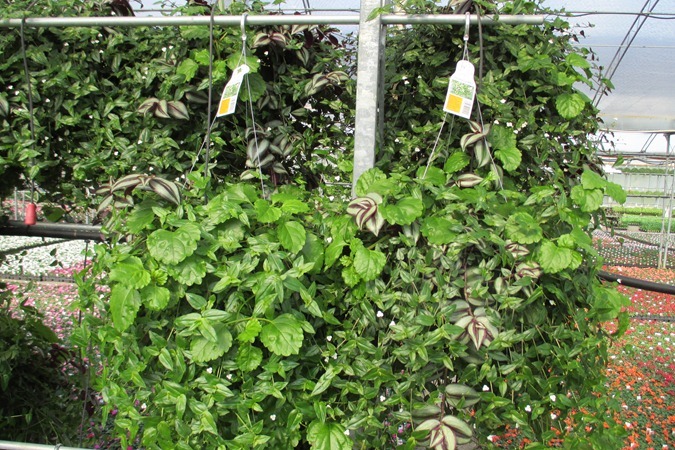 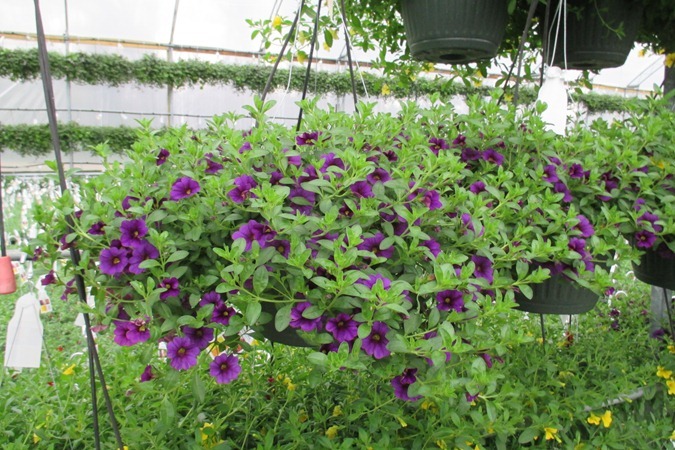 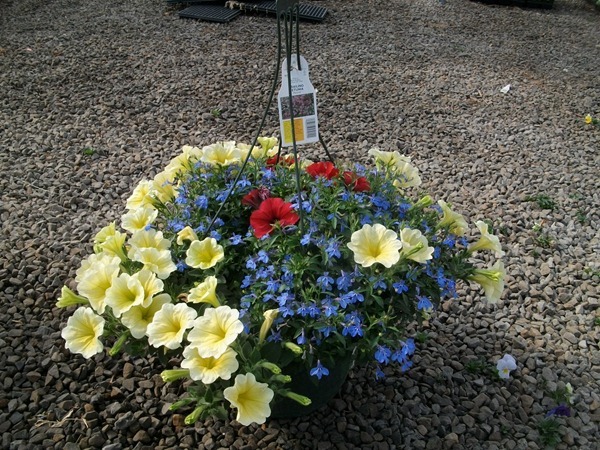 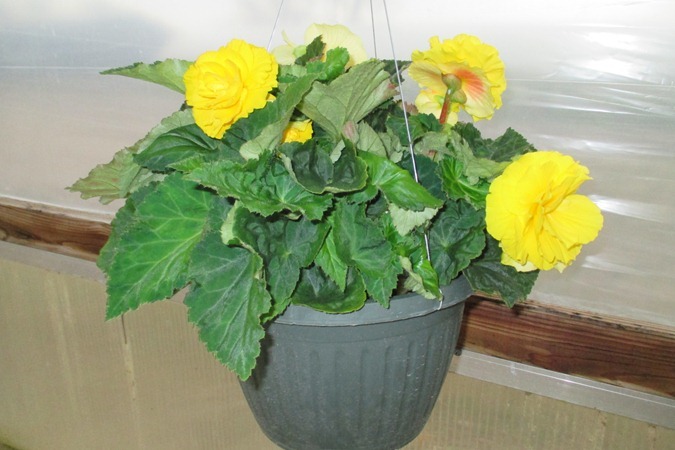 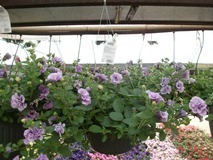 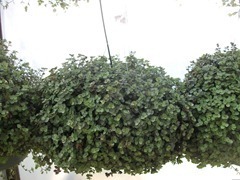 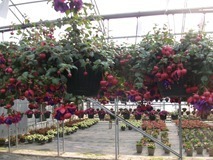 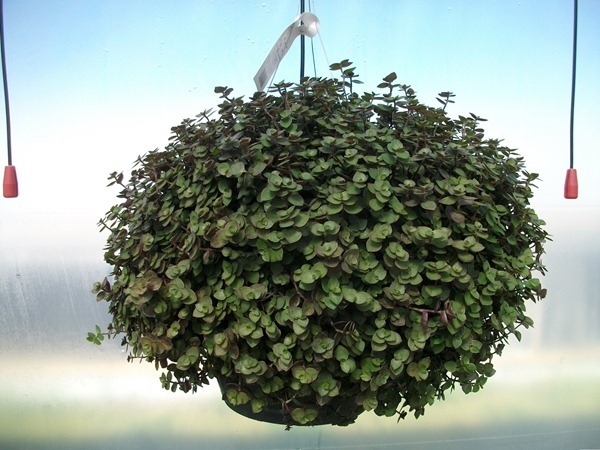 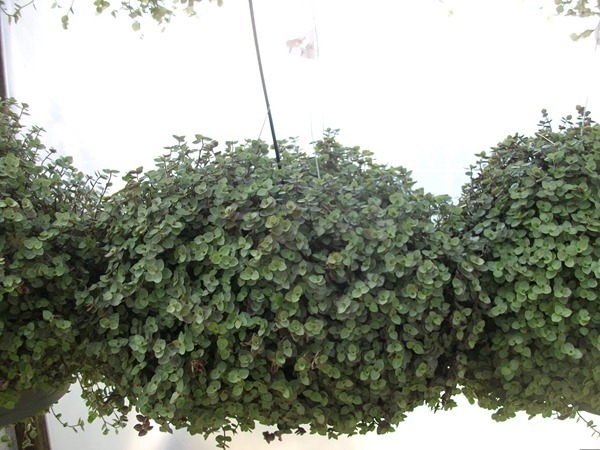 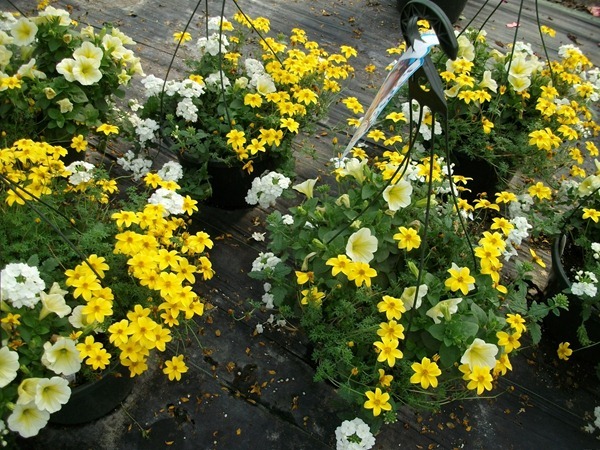 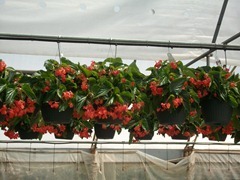 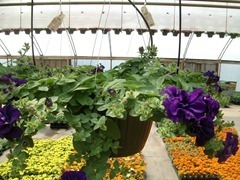 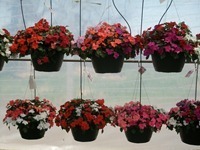 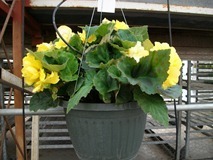 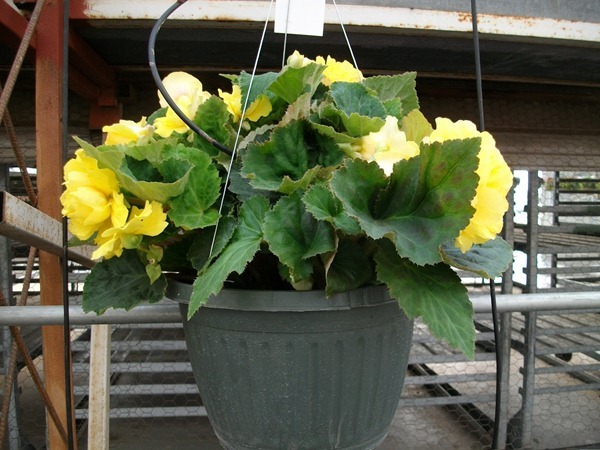 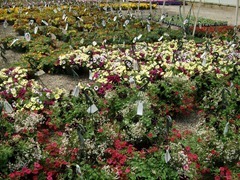 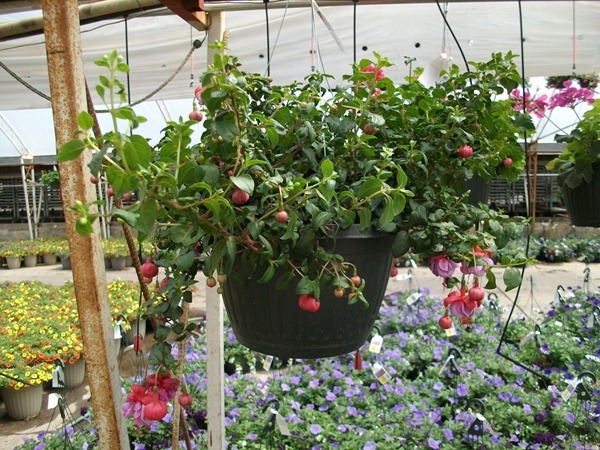 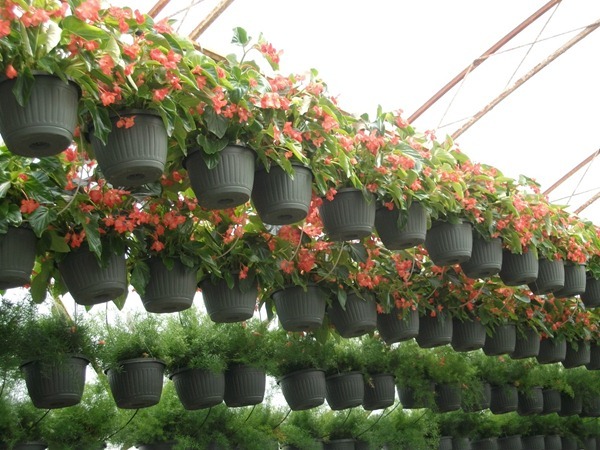 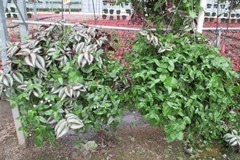 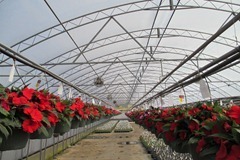 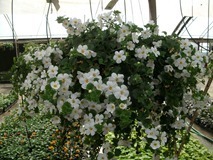 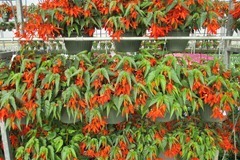 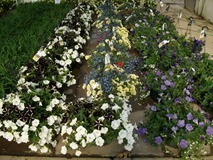 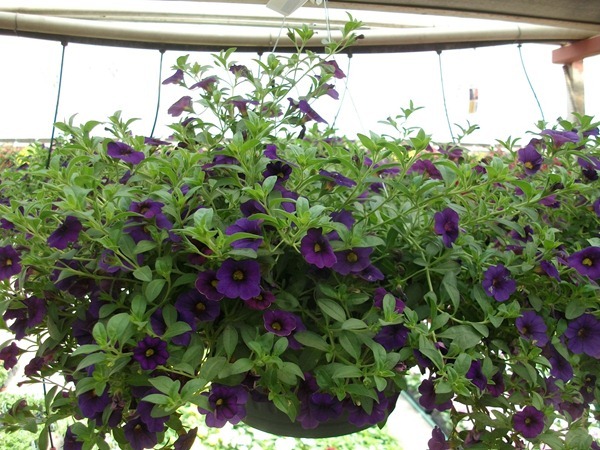 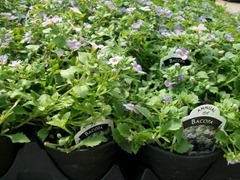 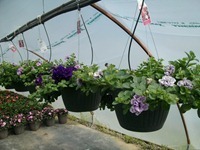 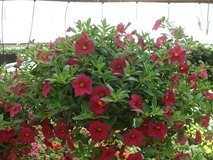 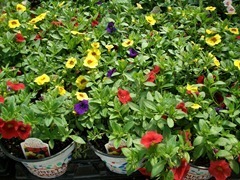 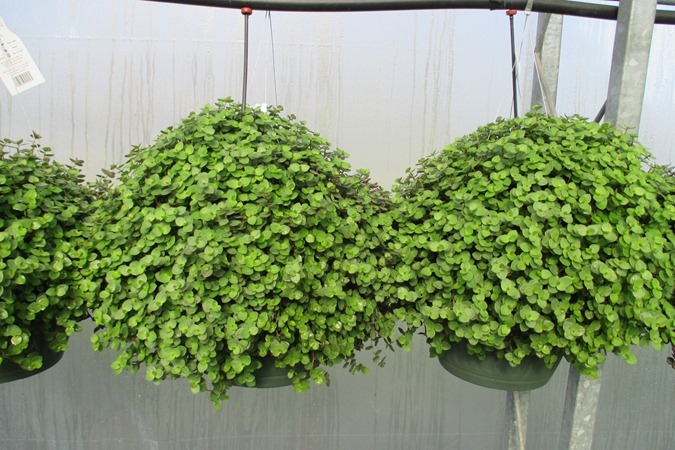 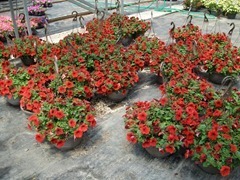 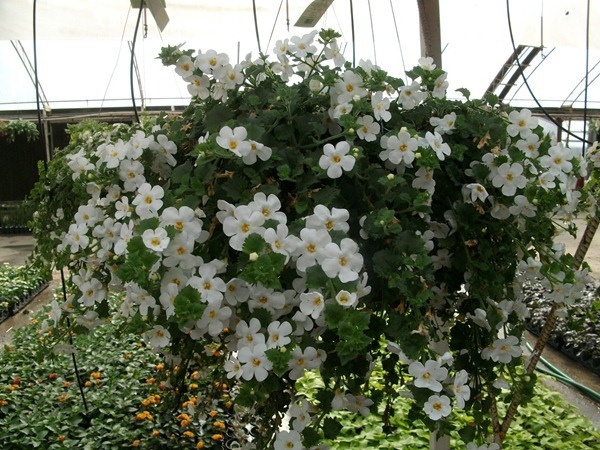 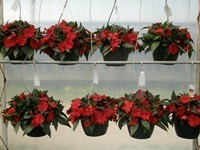 This is a sample of the hanging baskets we have hanging around. 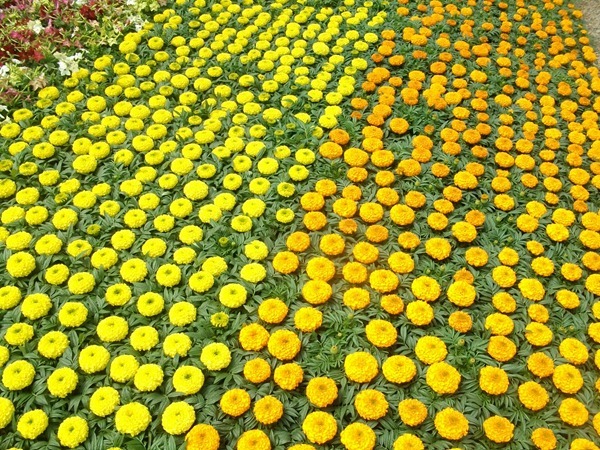 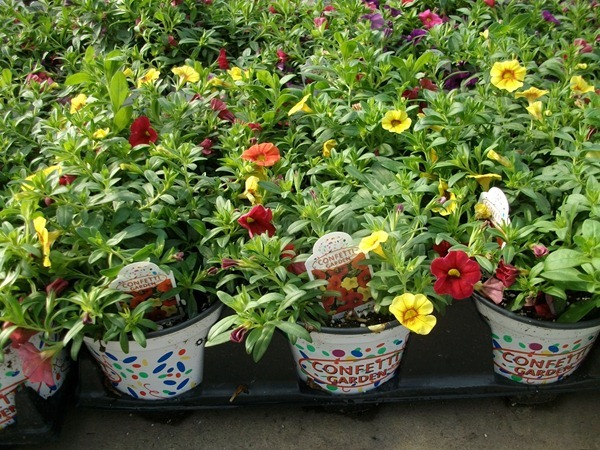 Confetti Gardens in baskets and decos are colorful. 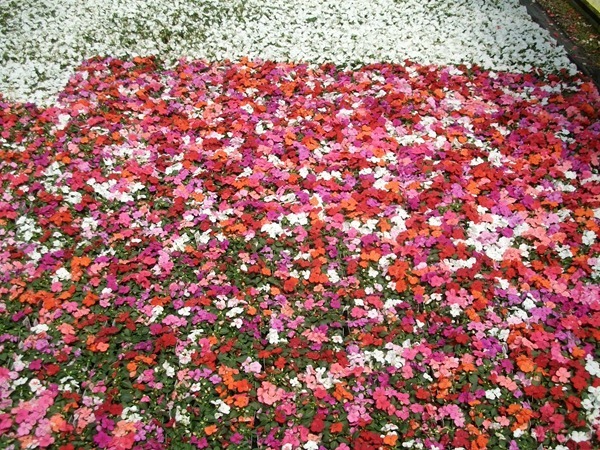 Several of the Confetti Trios have a more upright habit than trailing and therefore are not as wide but are much fuller on top. 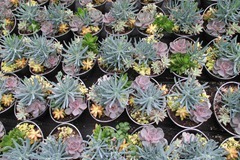 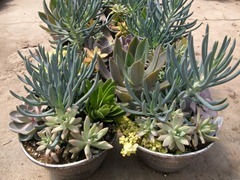 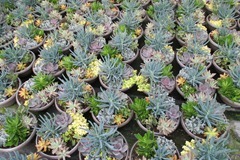 The bowls are looking great, particularly the succulent ovals. 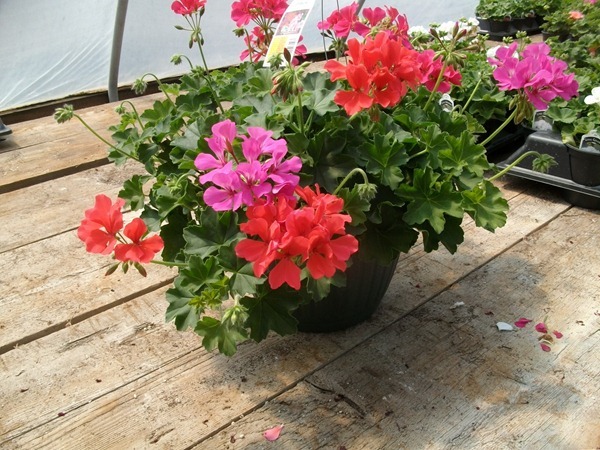 We have a good availability of great looking basic and deluxe annuals in 1801’s, 1204’s and J6’s. 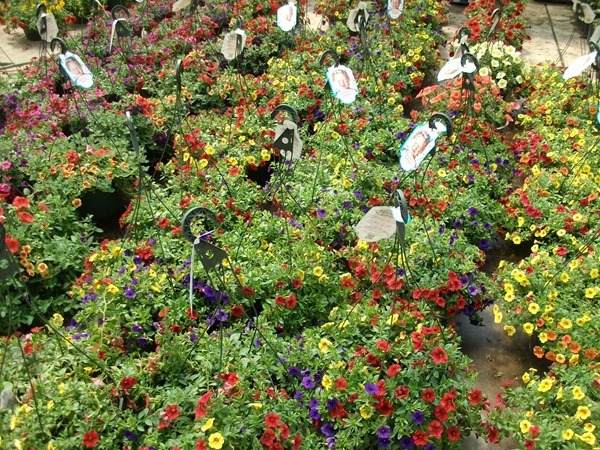 This last week has been insane around here and we aren’t even that busy yet. 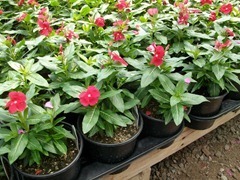 We have a lot of great looking products that are prime for your stores. 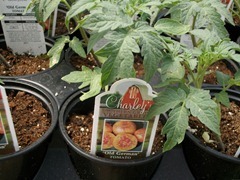 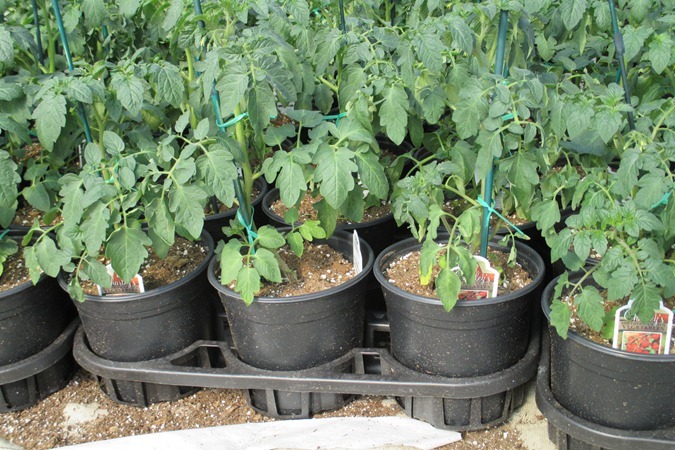 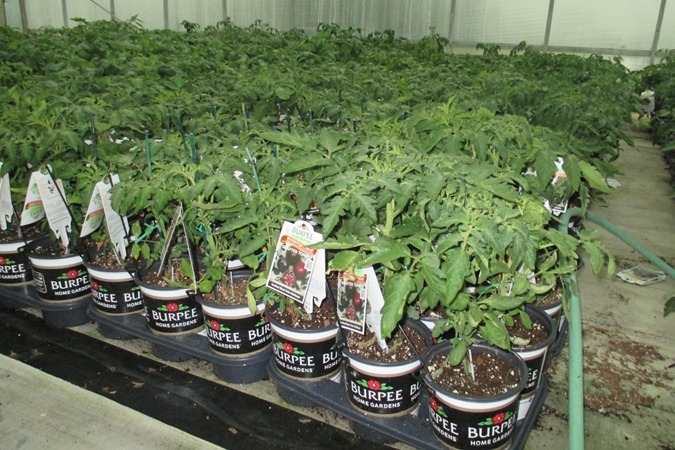 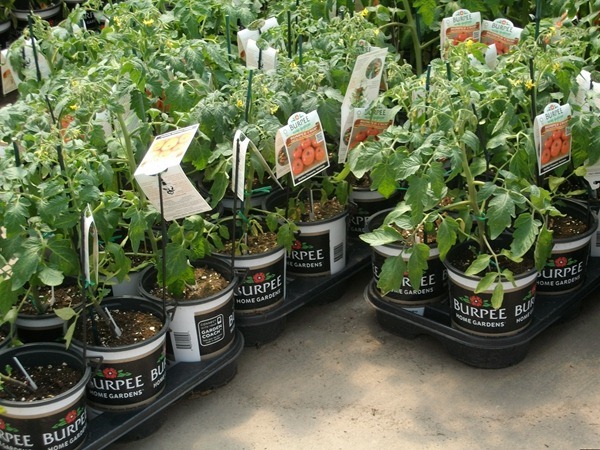 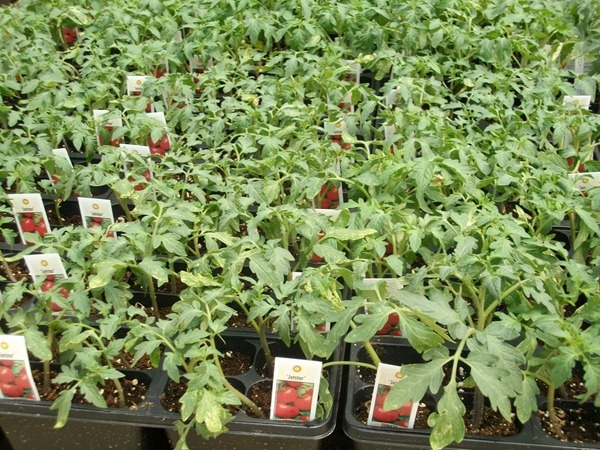 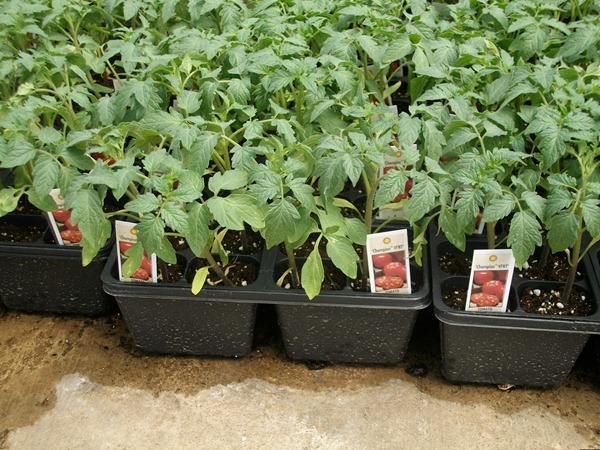 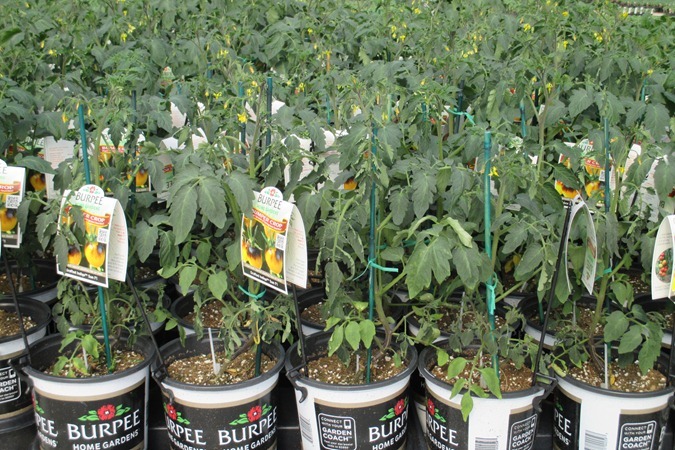 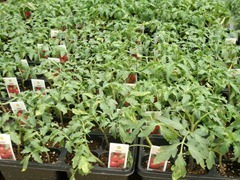 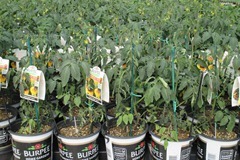 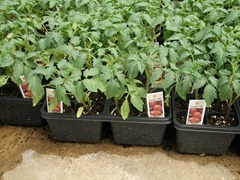 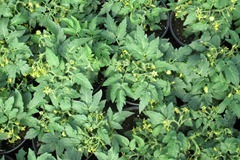 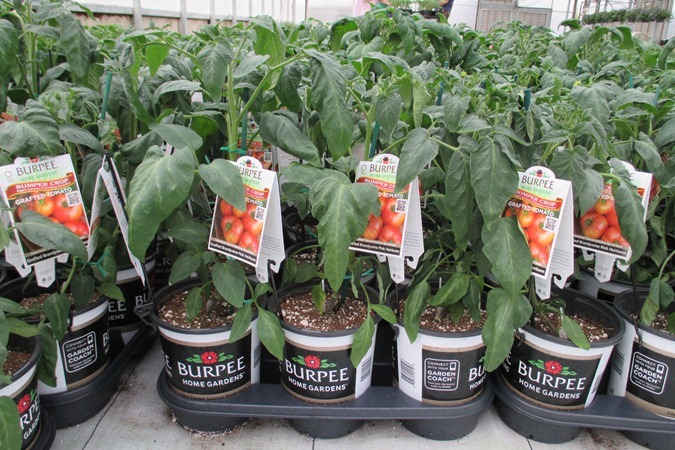 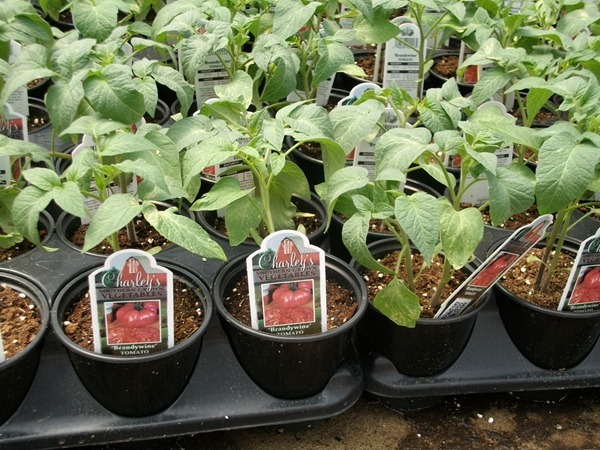 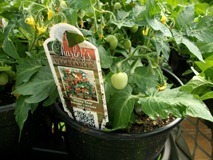 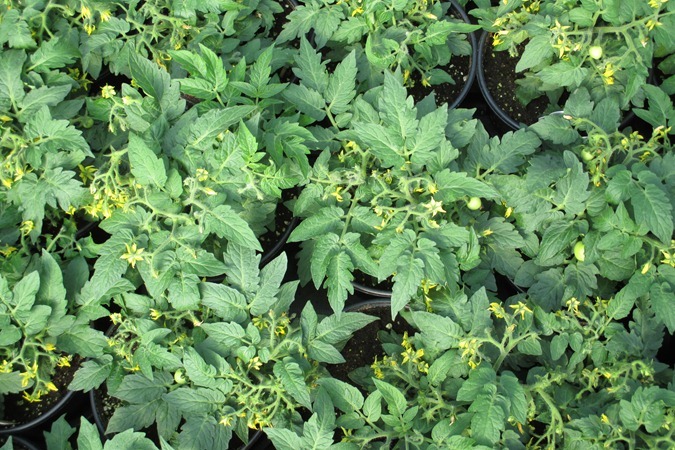 1 gallon Bumper Crop grafted tomatoes are very nice. 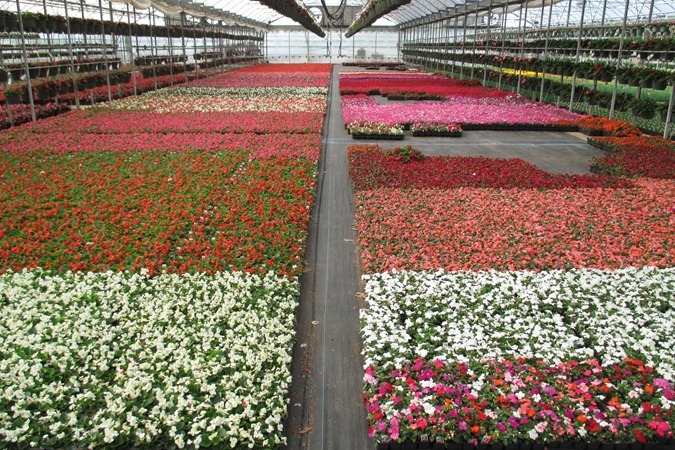 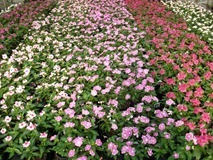 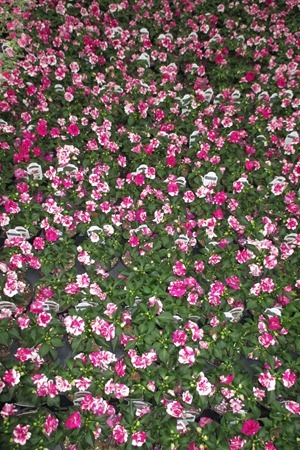 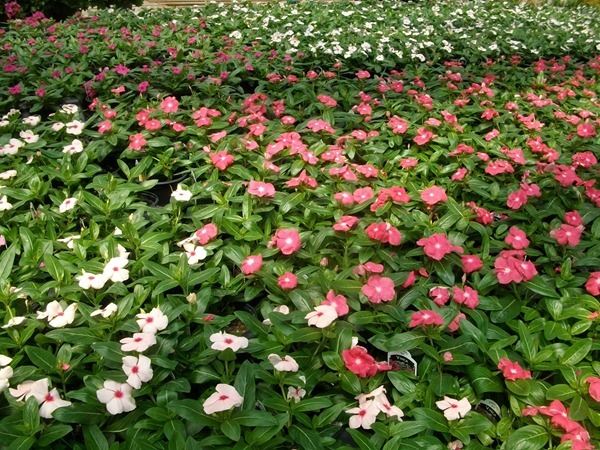 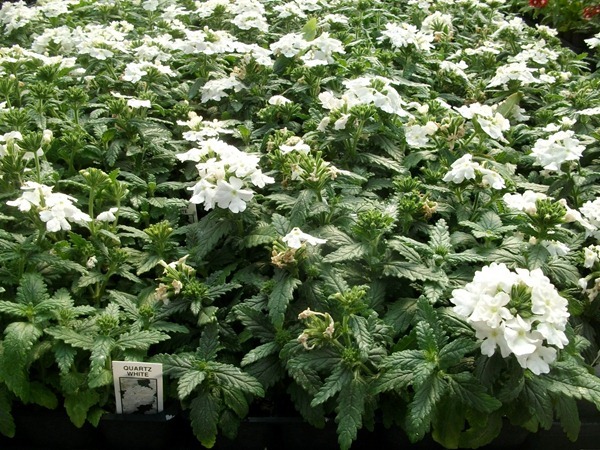 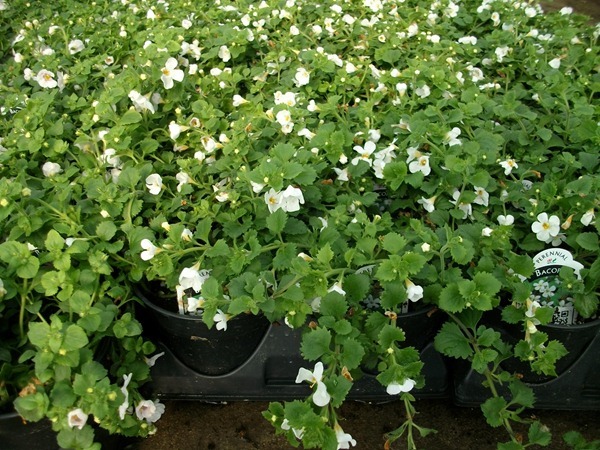 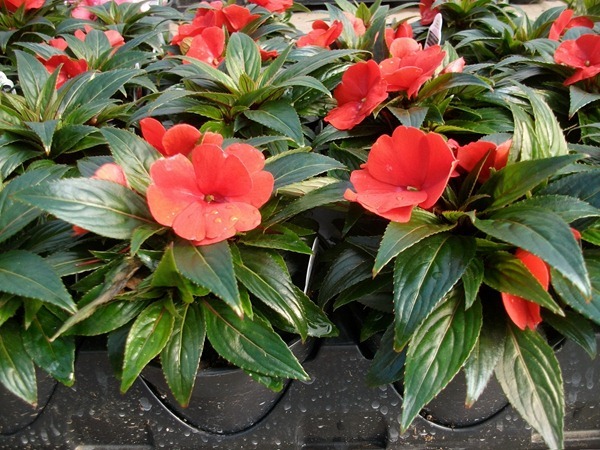 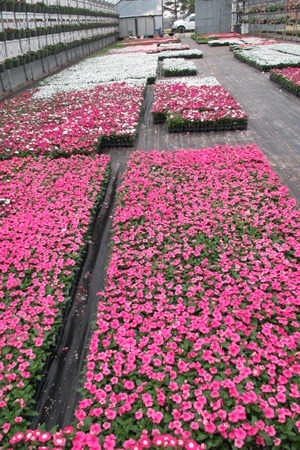 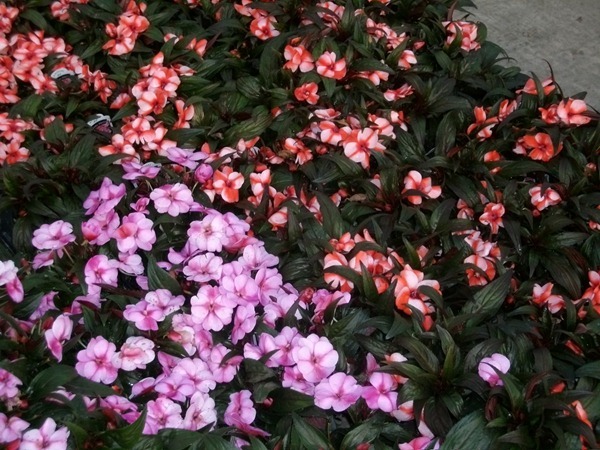 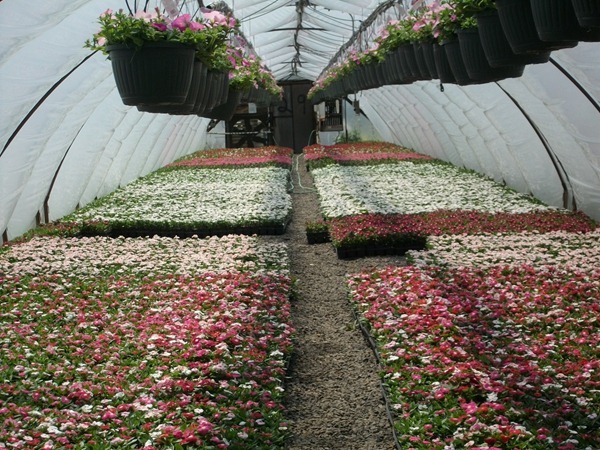 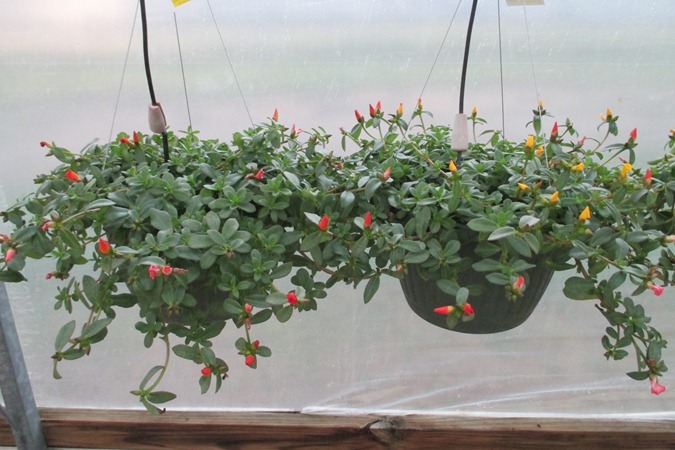 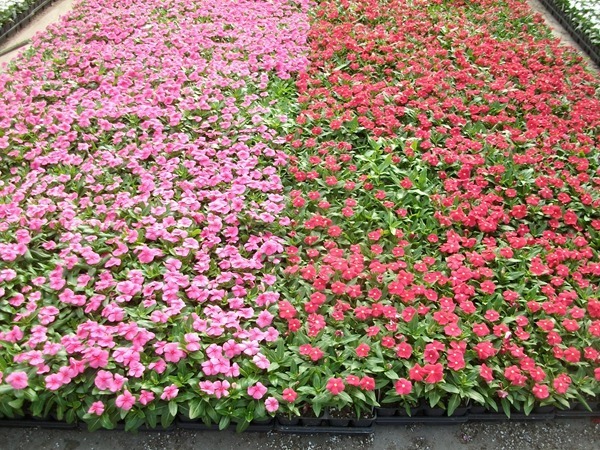 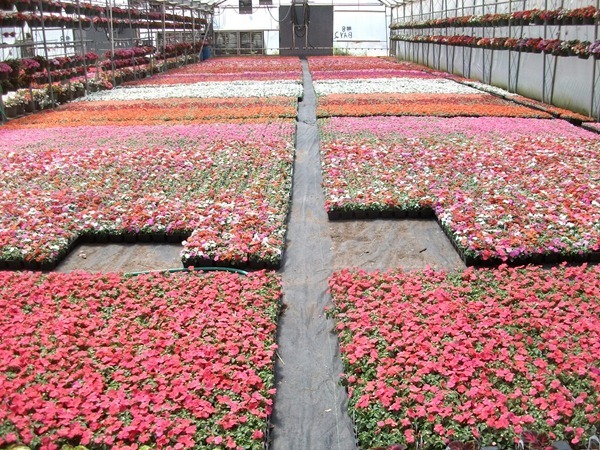 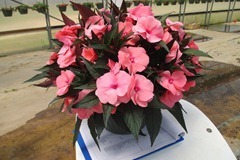 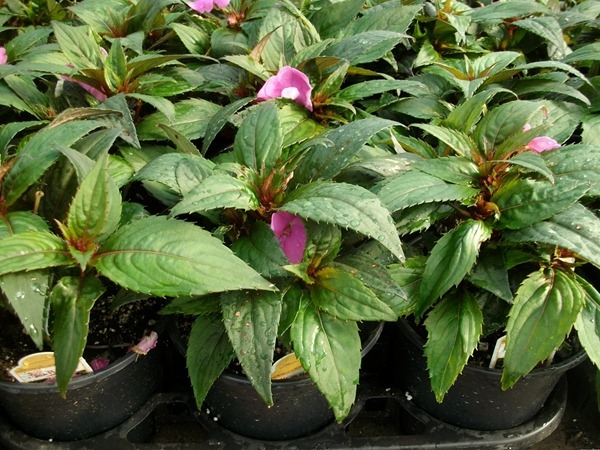 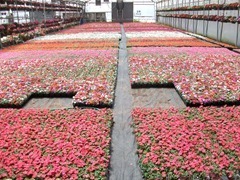 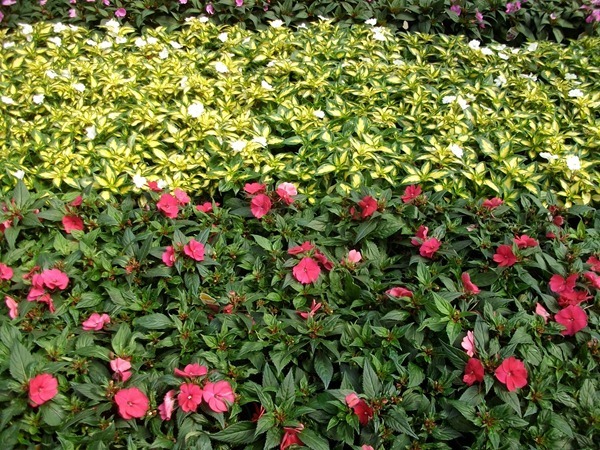 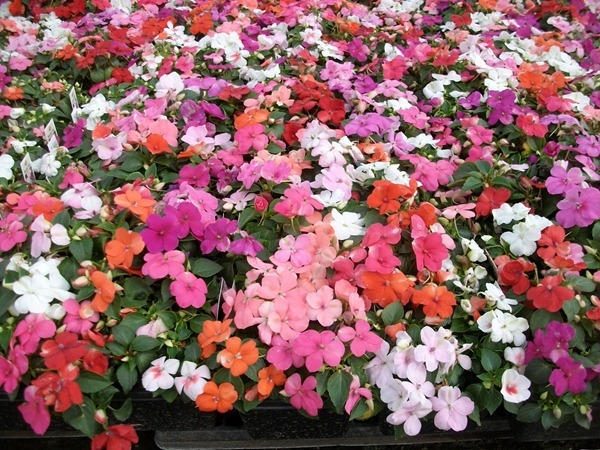 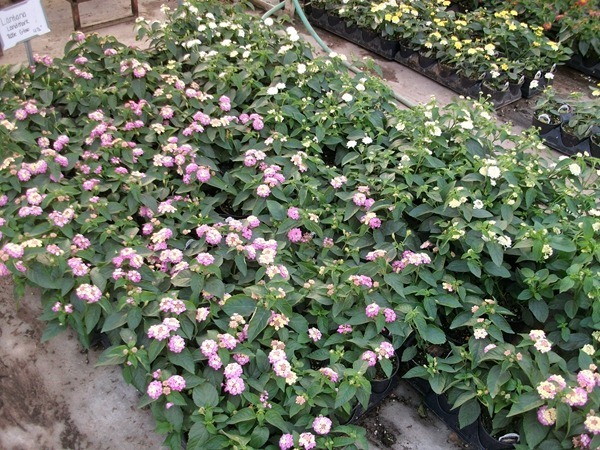 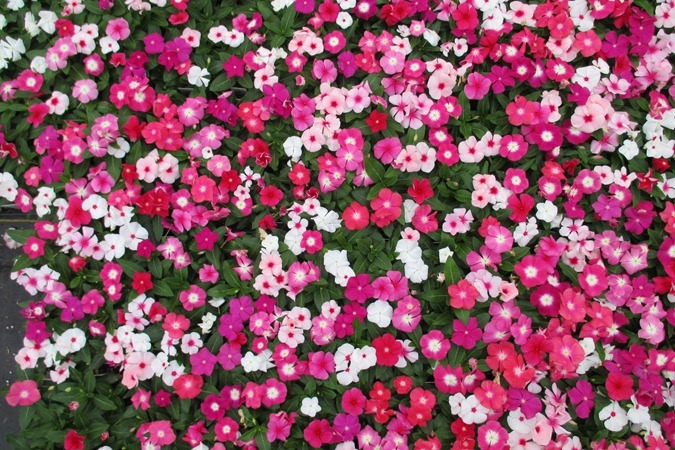 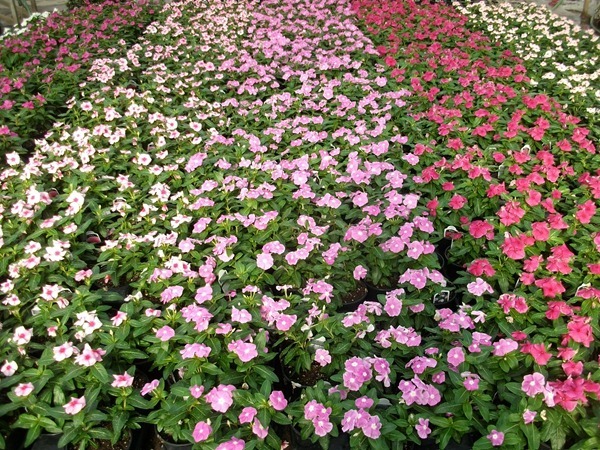 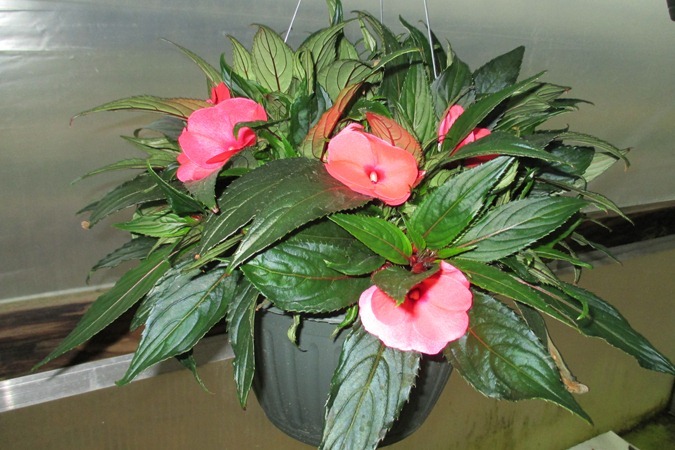 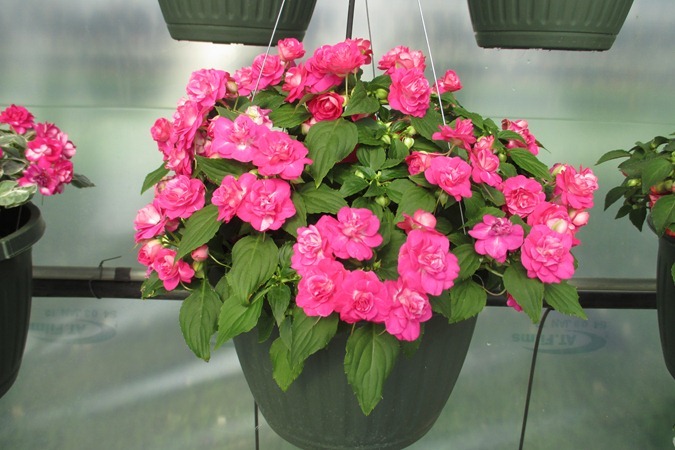 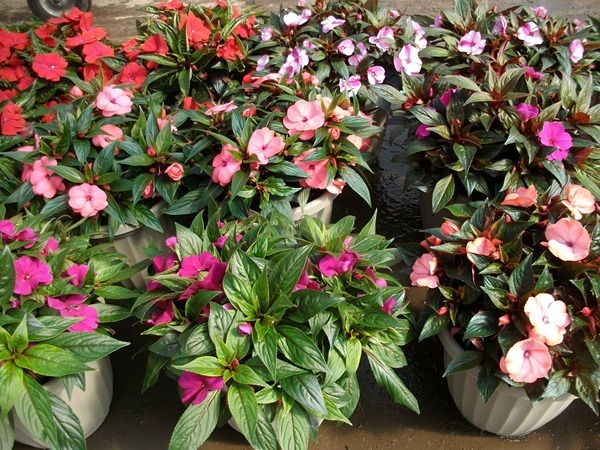 We will be finishing up one crop of 1 gallon Sunpatiens with good color and be getting into the next crop which is shorted and has less color as you can see. 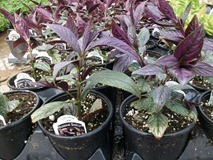 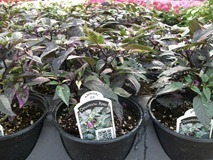 We are also getting some color out in our 1 gallon Tropical Hibiscus, but only in a few varieties. 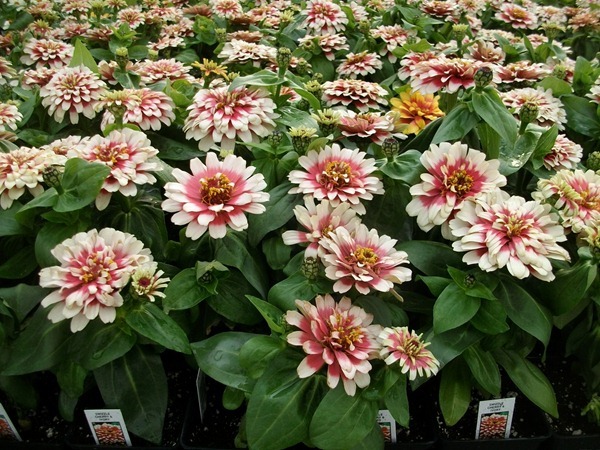 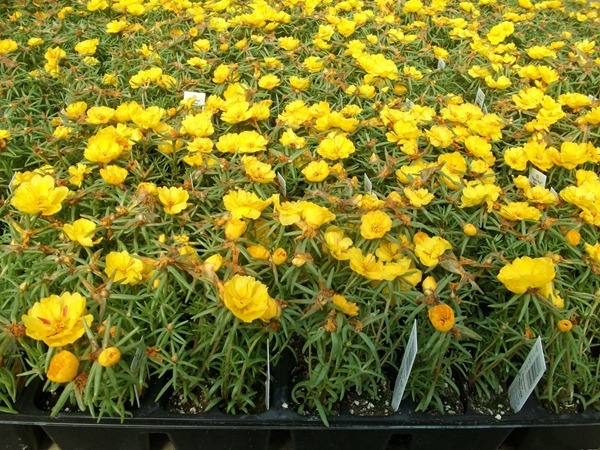 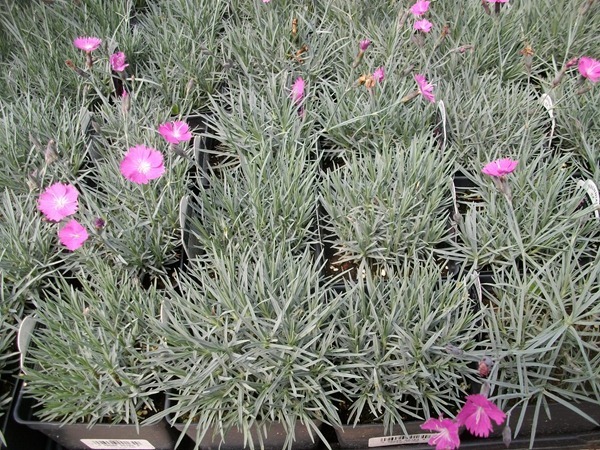 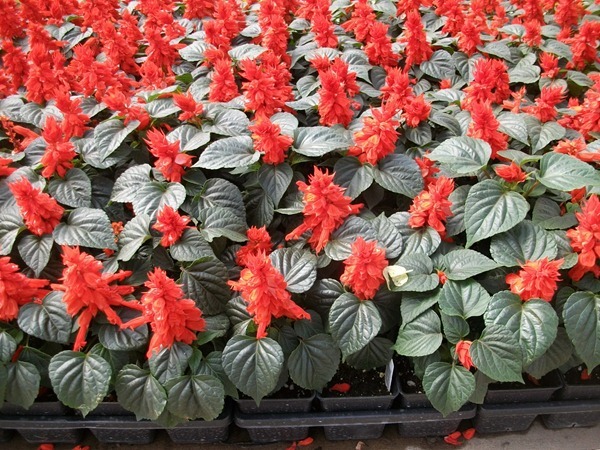 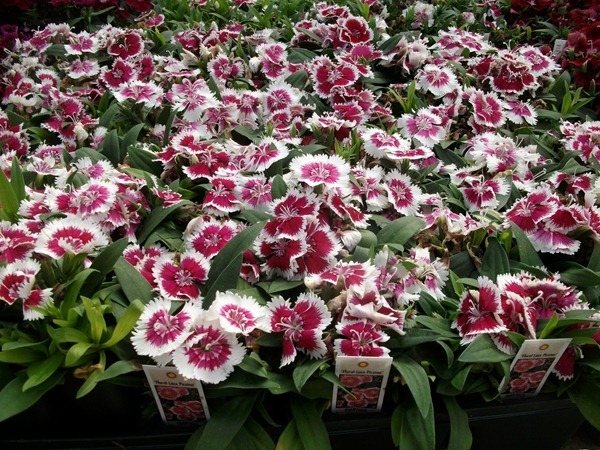 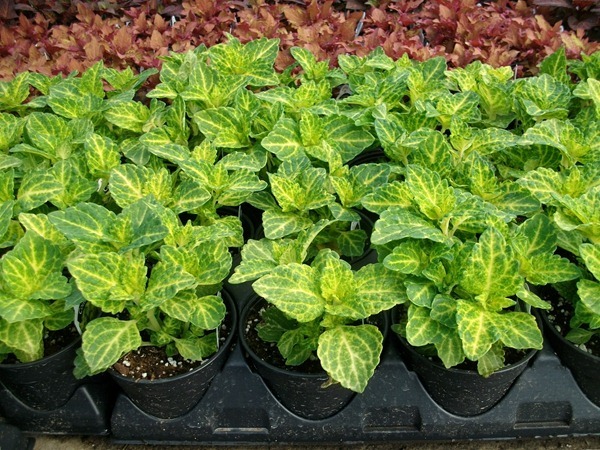 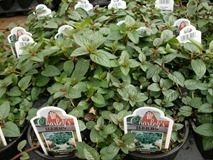 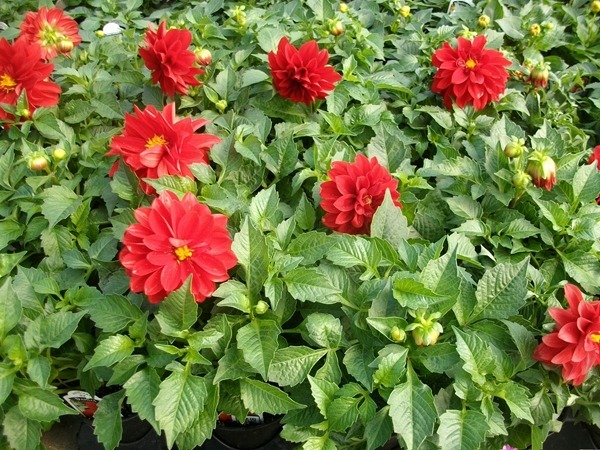 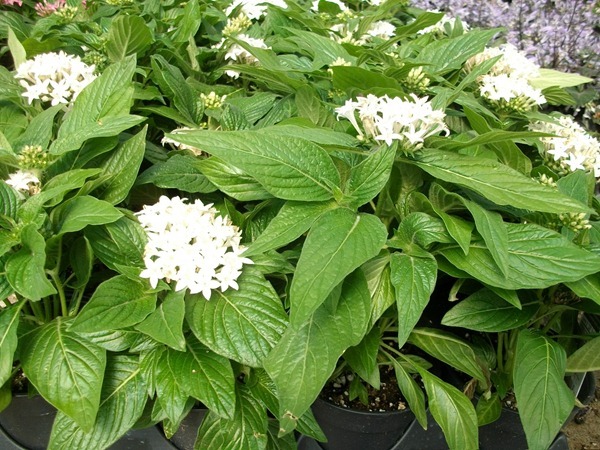 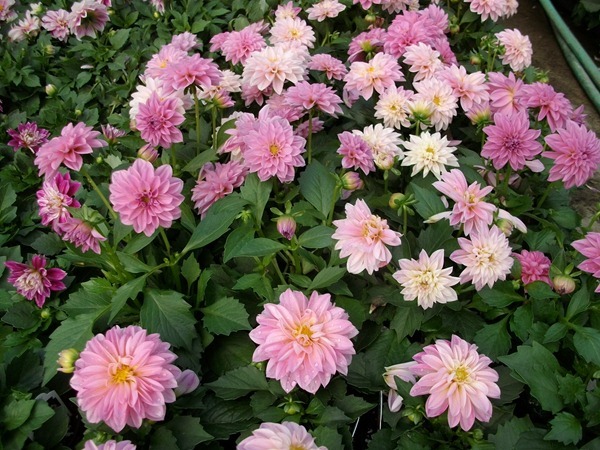 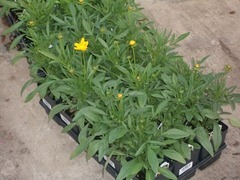 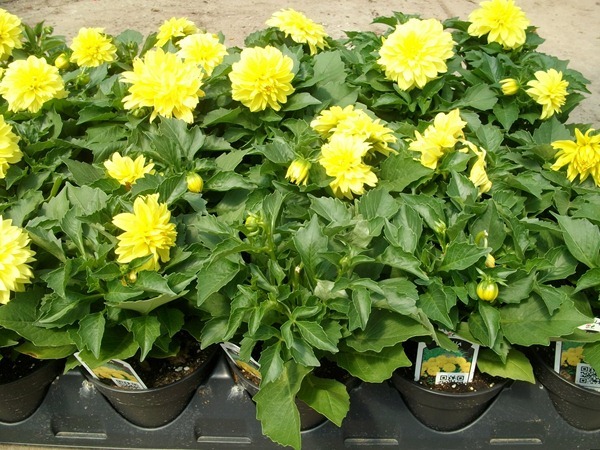 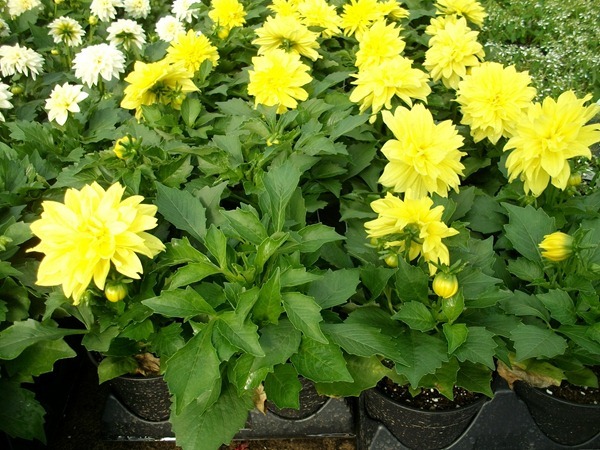 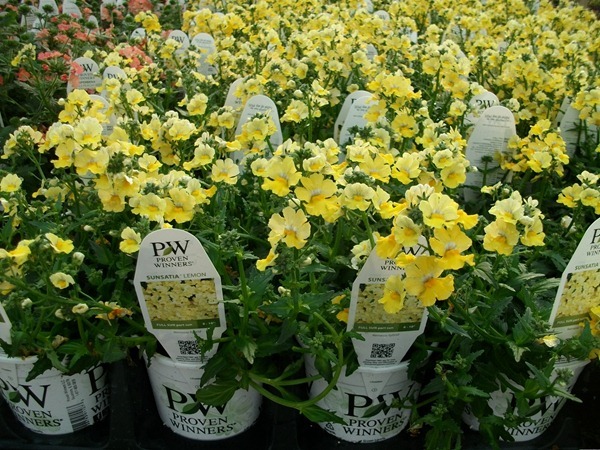 Our 1 QT Proven Winners are showing some color but some of them are really light on color so please pay attention to the comments on the availability. 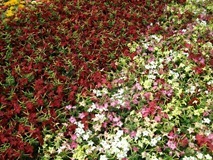 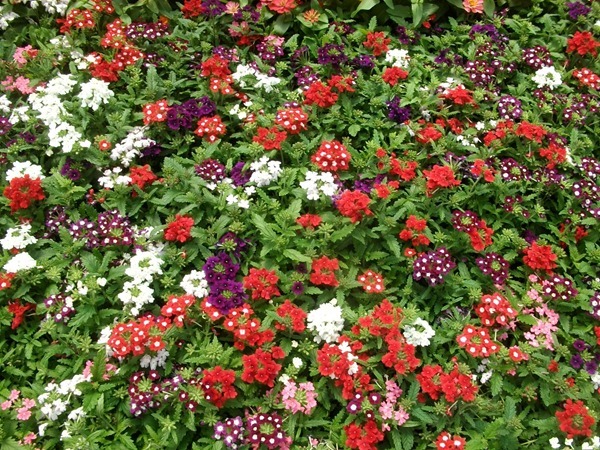 Lots of color out on our #4.5 Premium annuals. 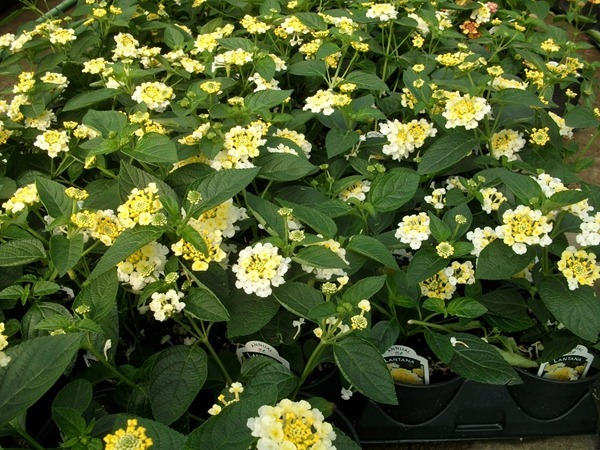 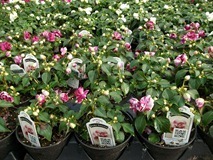 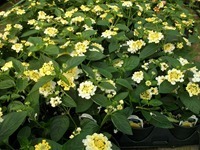 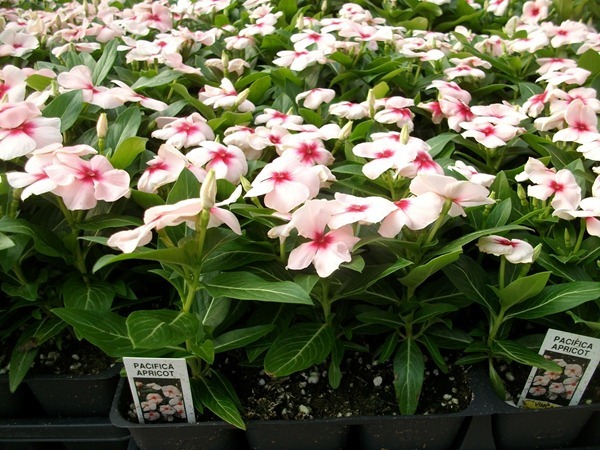 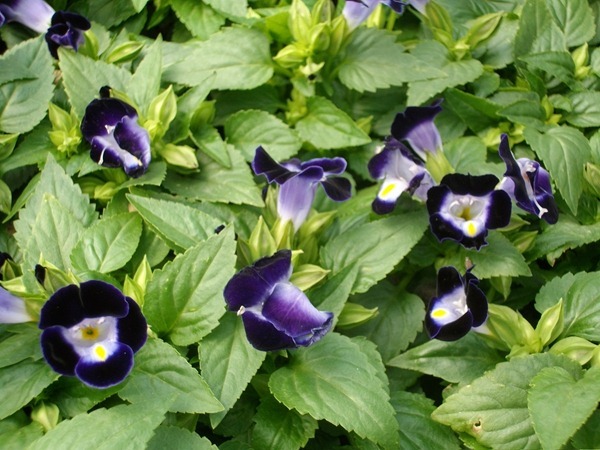 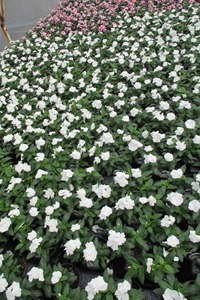 New to our #6’s are Cora Vinca. 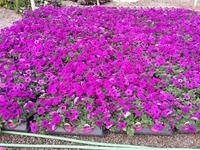 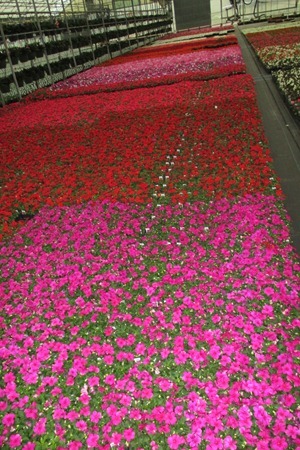 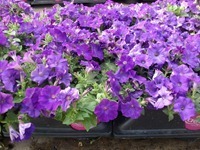 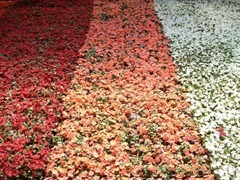 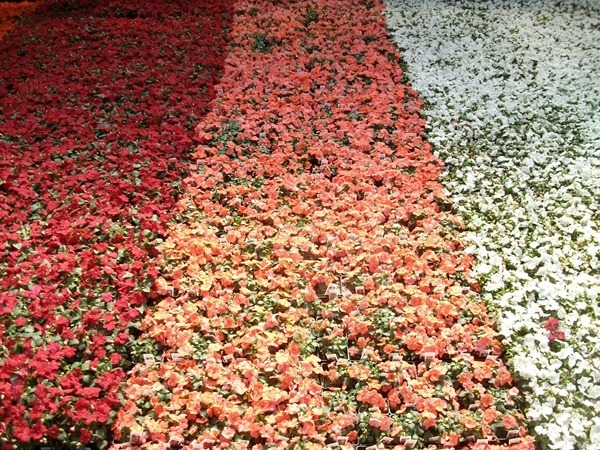 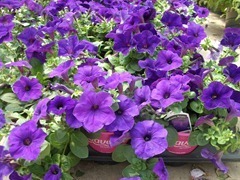 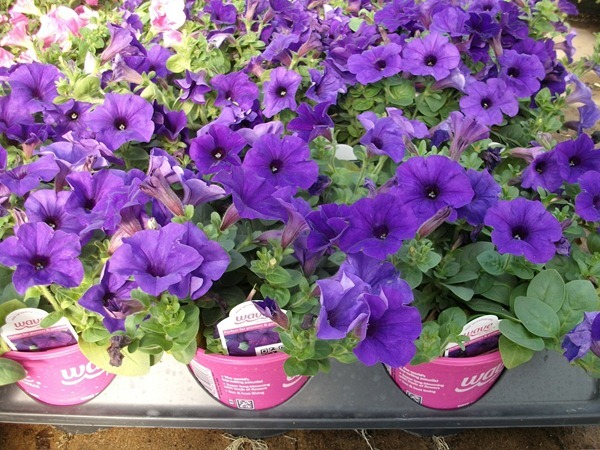 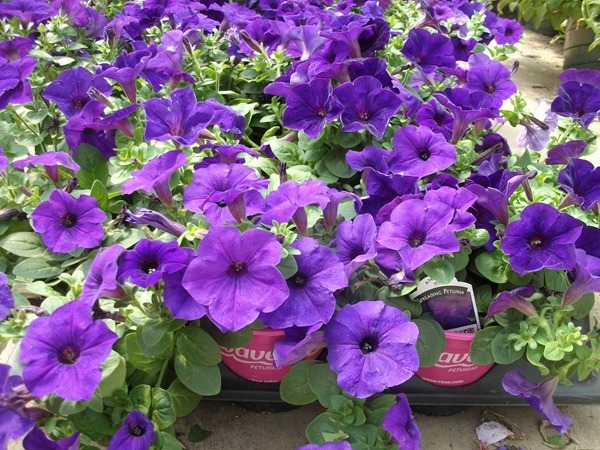 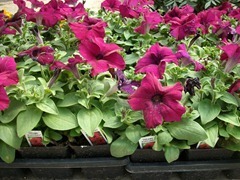 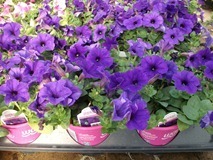 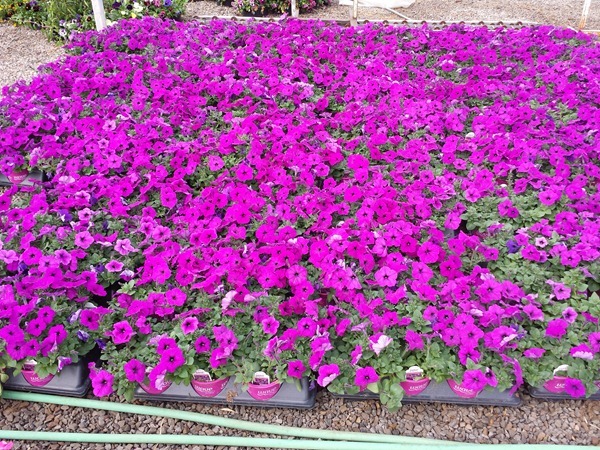 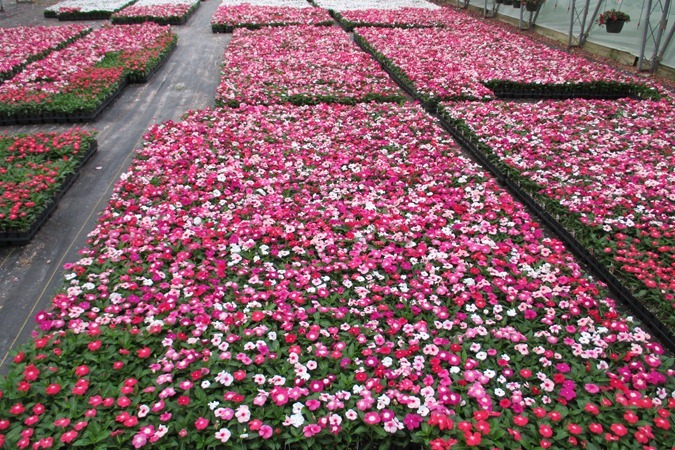 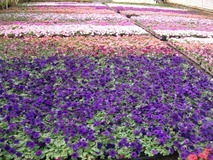 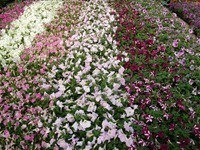 We also have a deep bench for Wave Petunias and very good color. 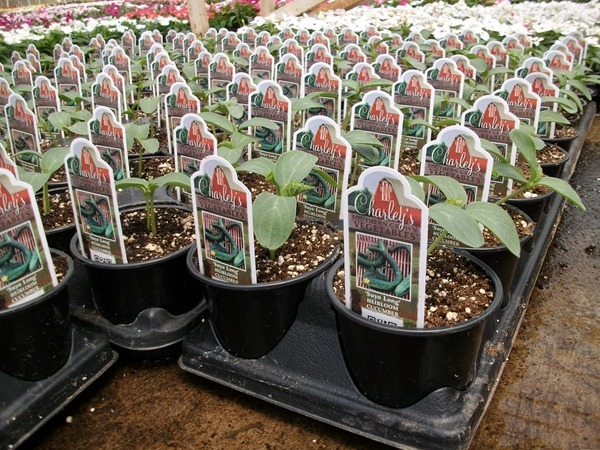 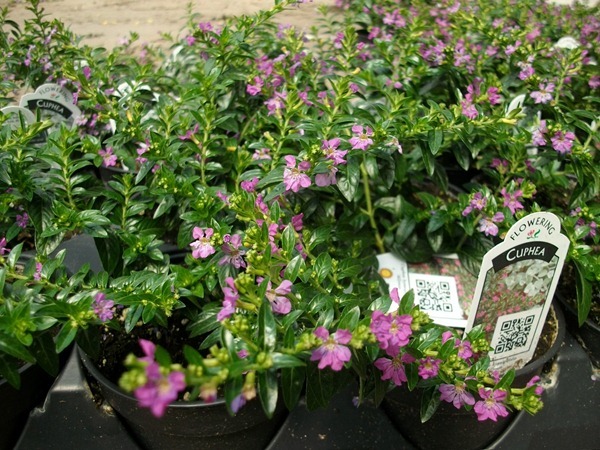 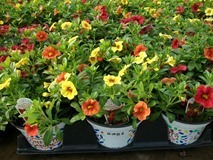 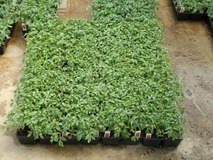 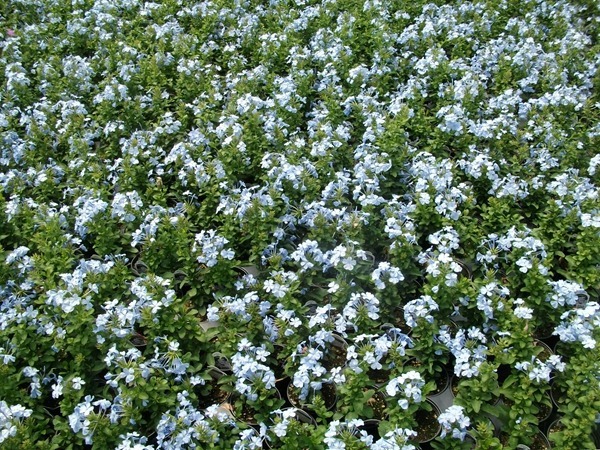 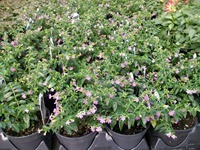 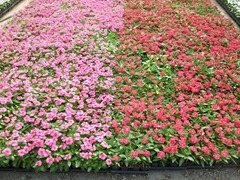 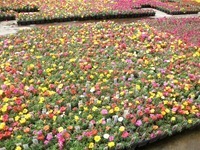 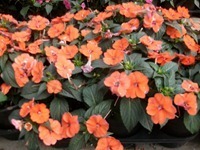 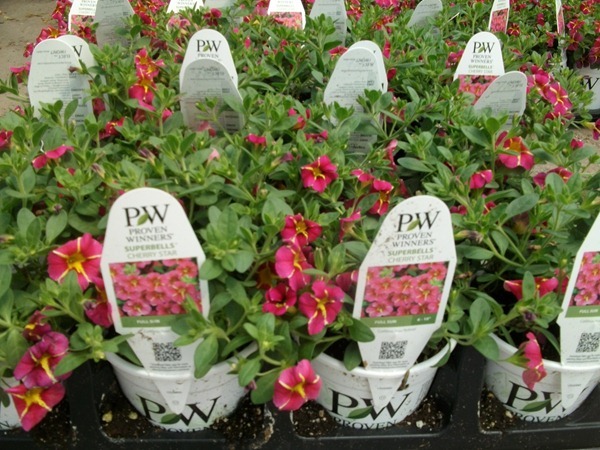 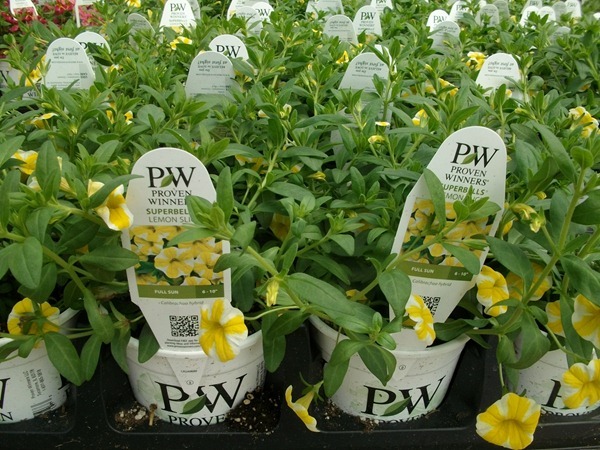 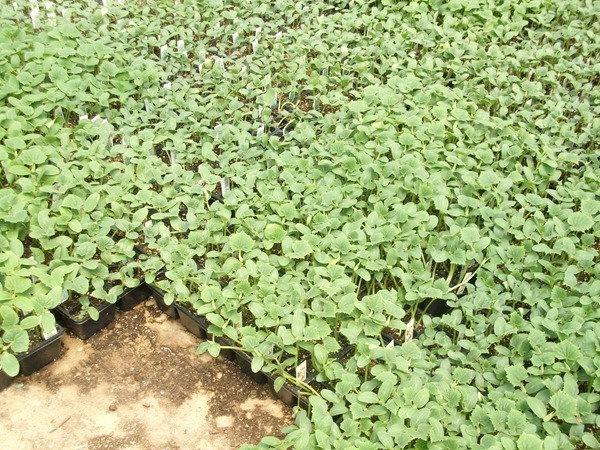 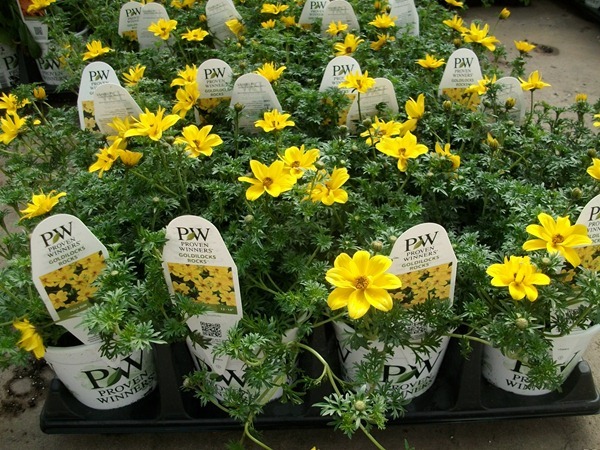 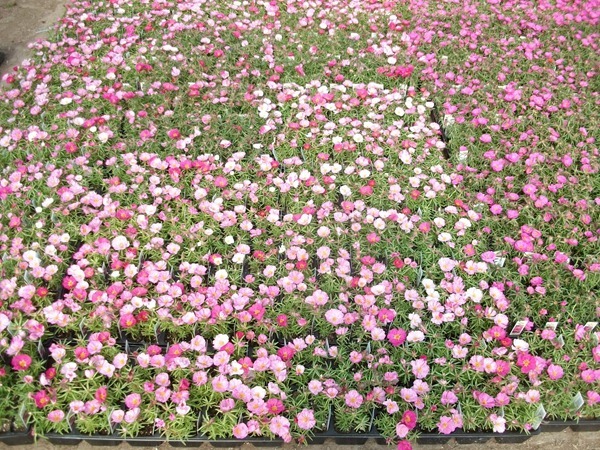 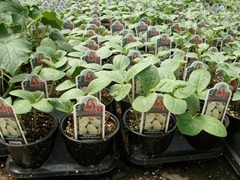 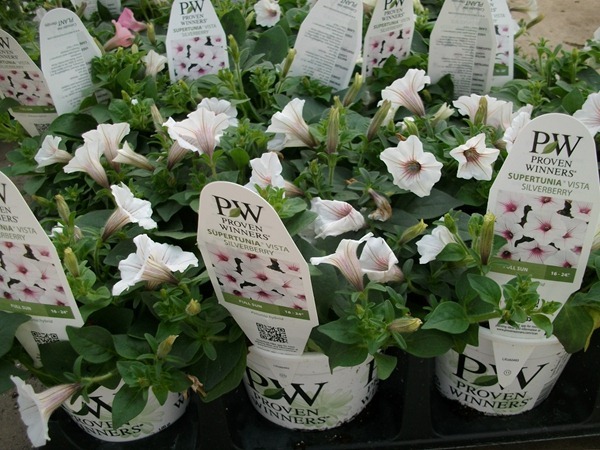 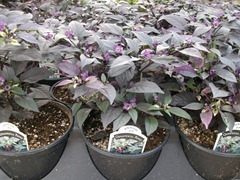 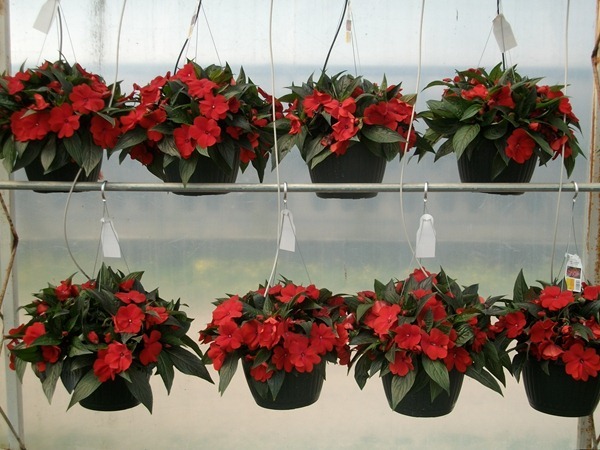 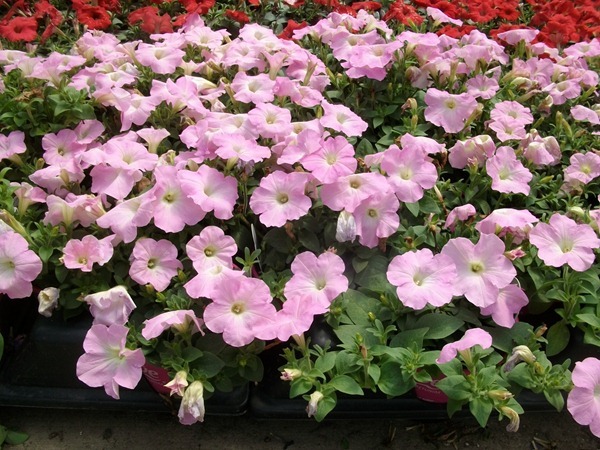 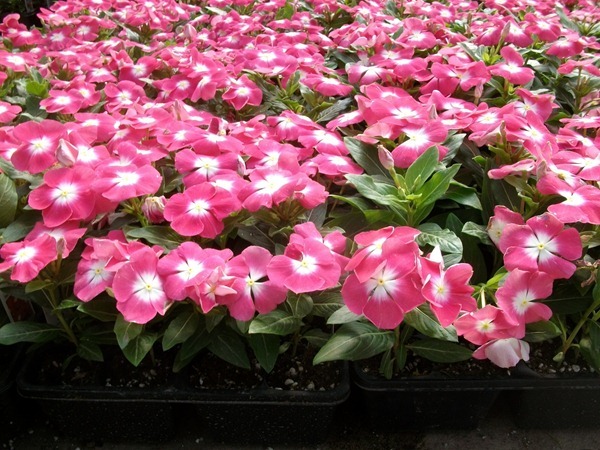 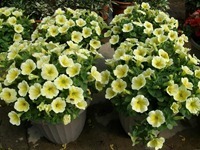 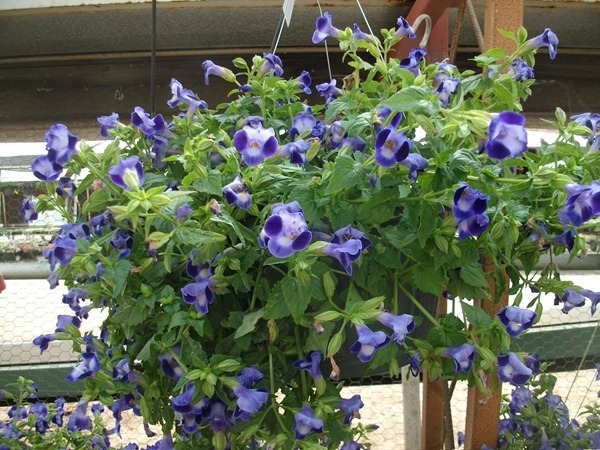 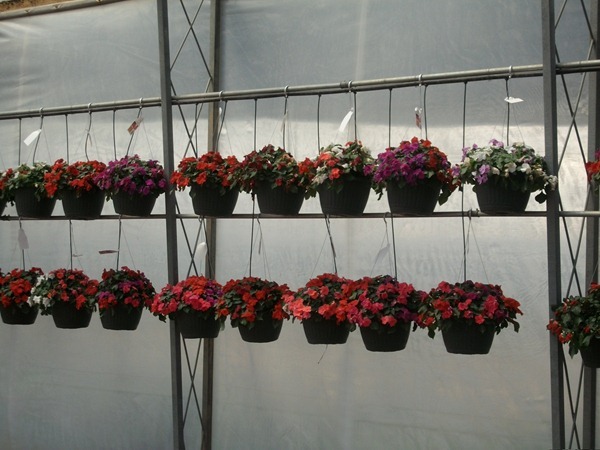 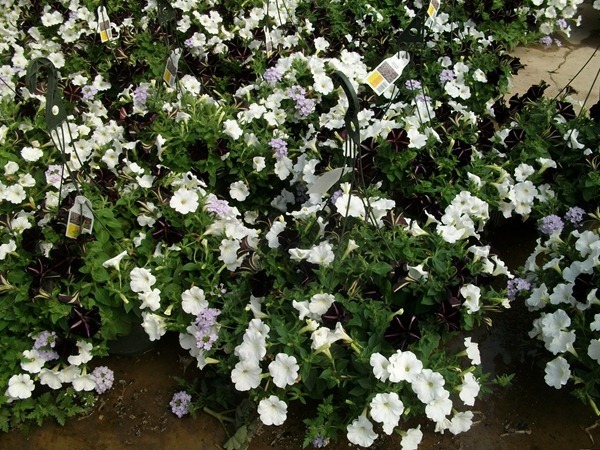 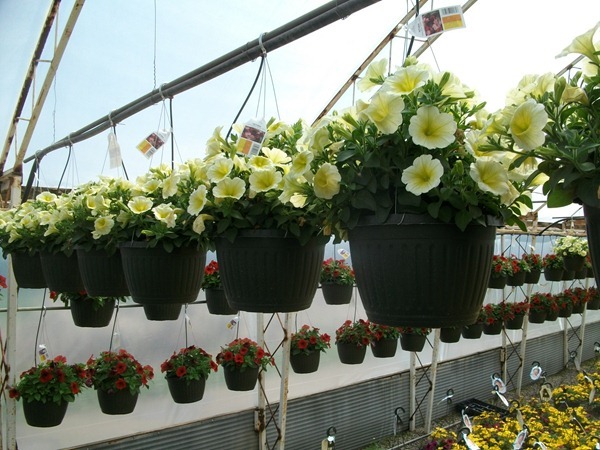 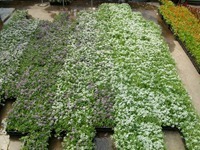 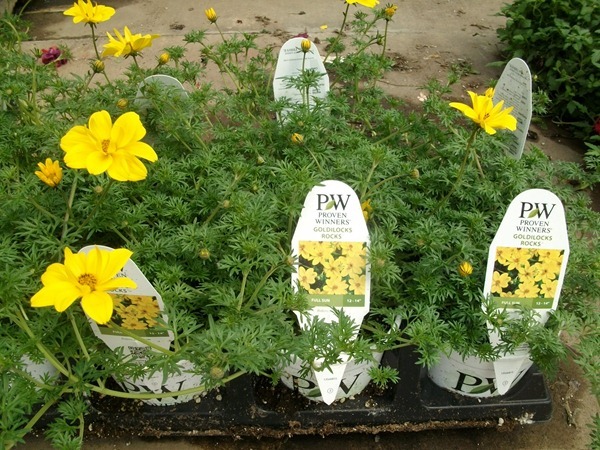 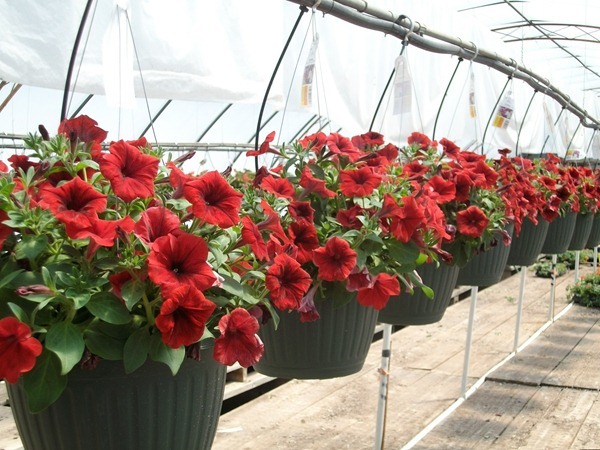 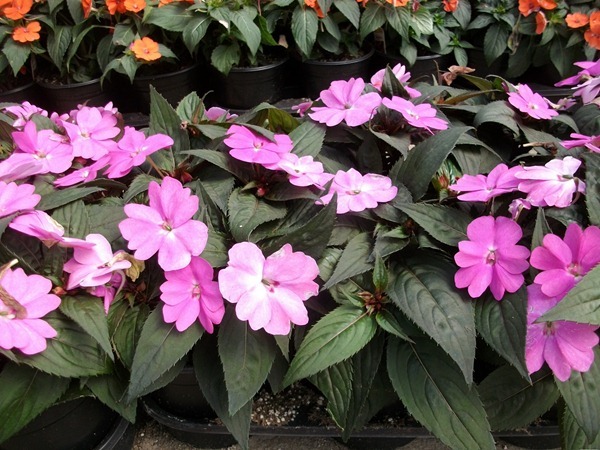 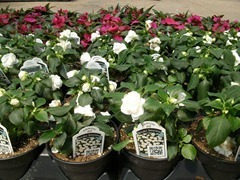 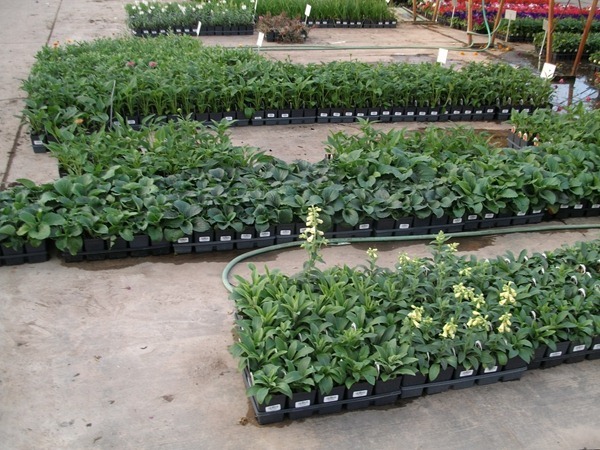 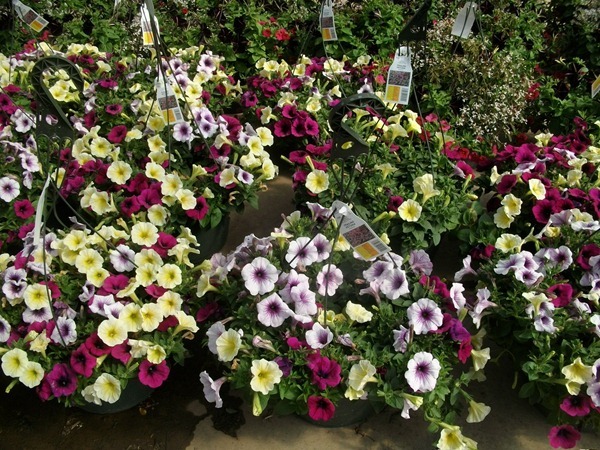 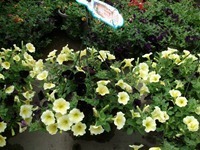 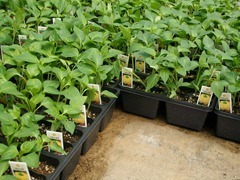 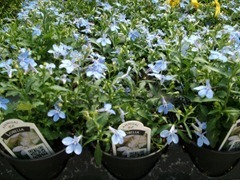 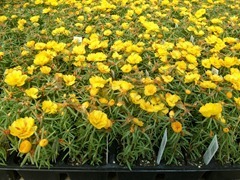 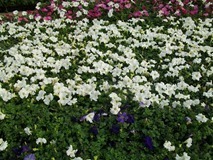 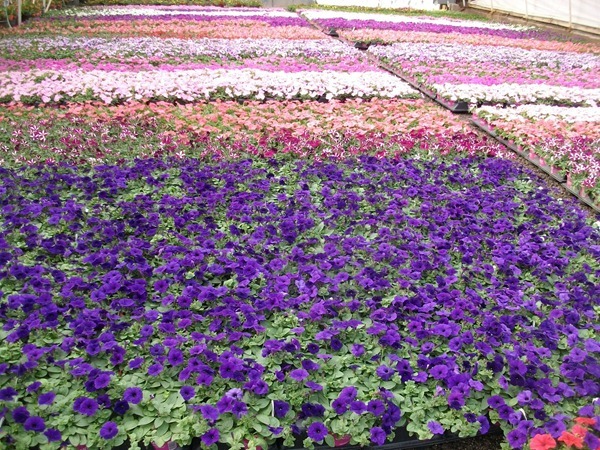 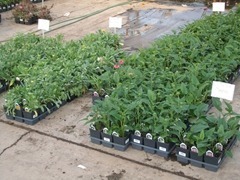 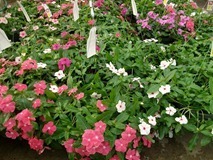 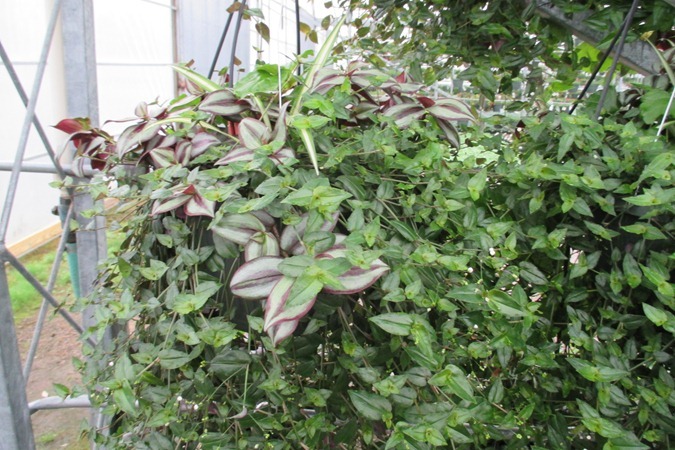 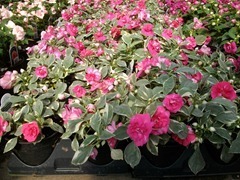 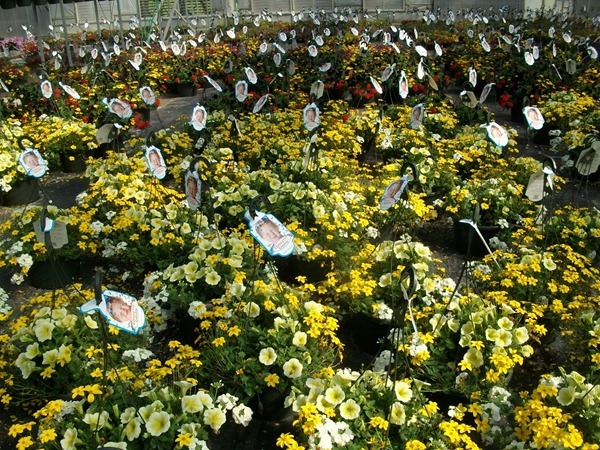 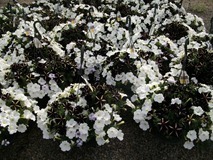 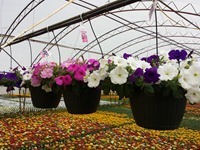 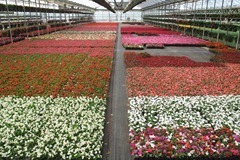 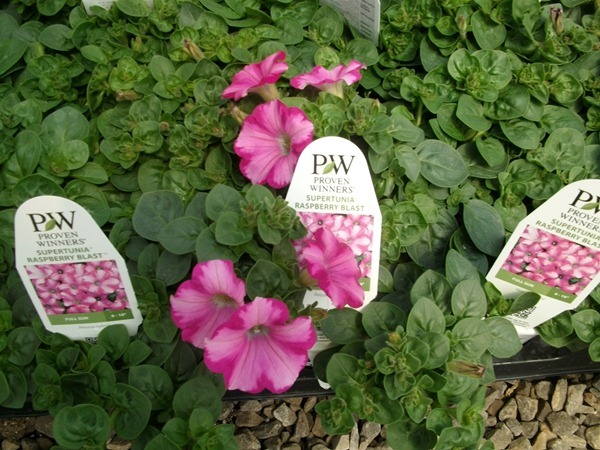 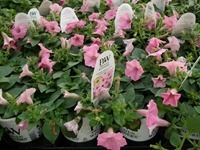 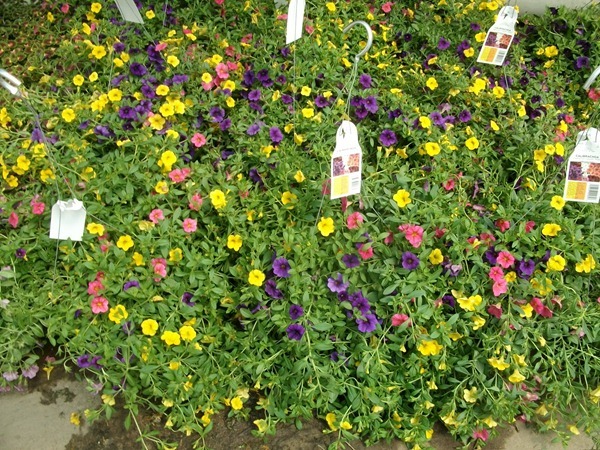 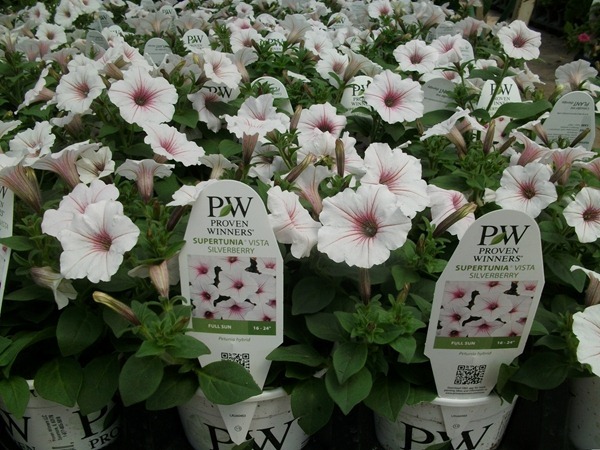 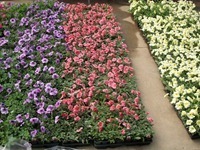 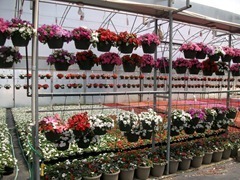 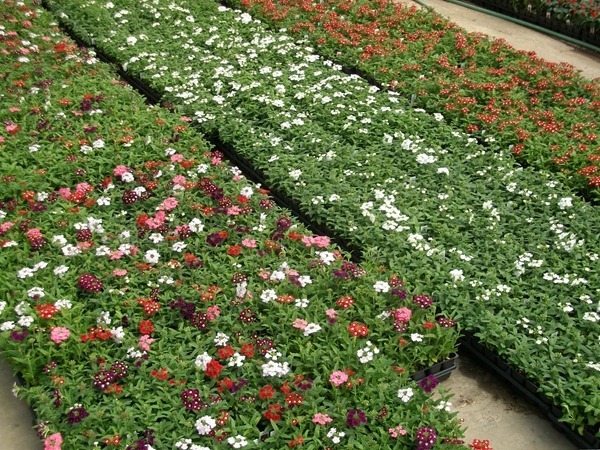 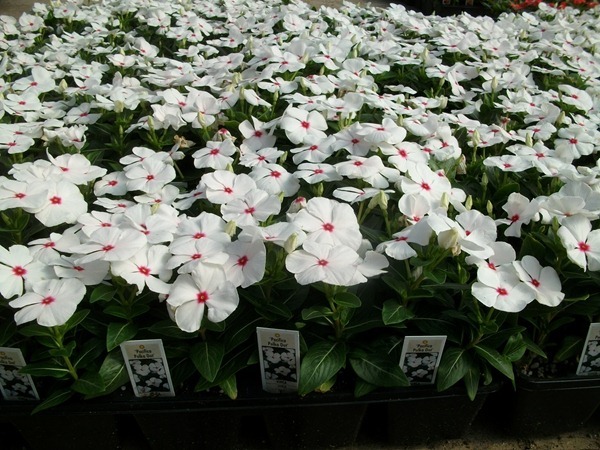 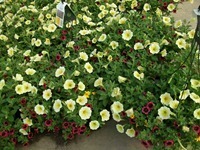 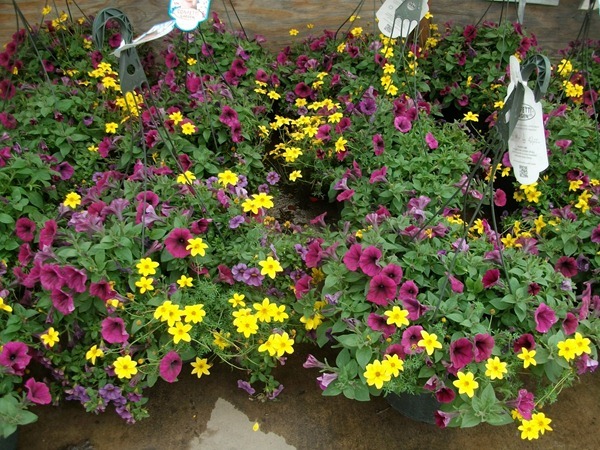 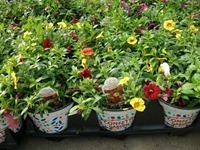 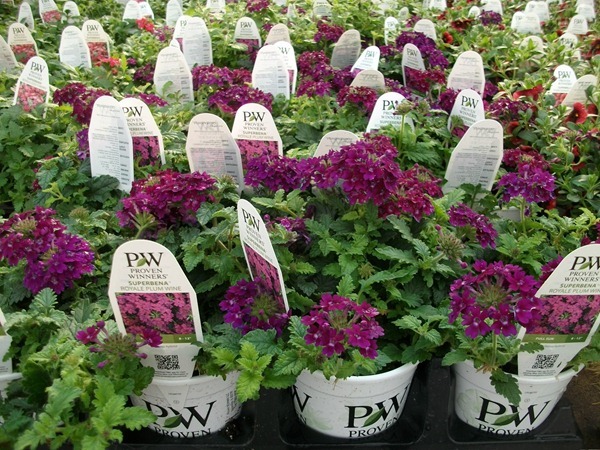 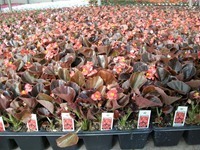 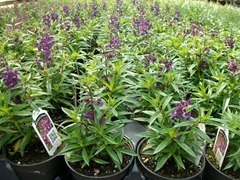 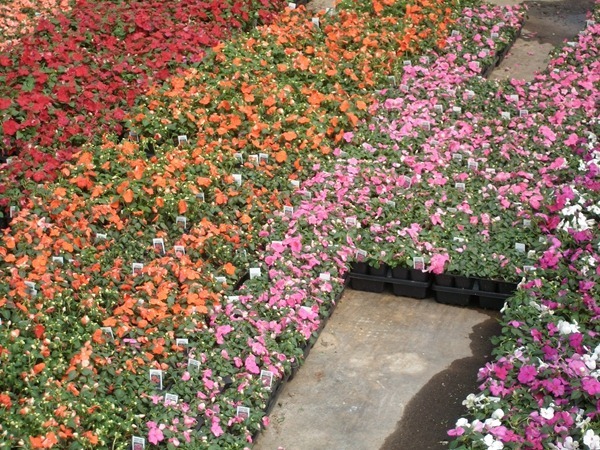 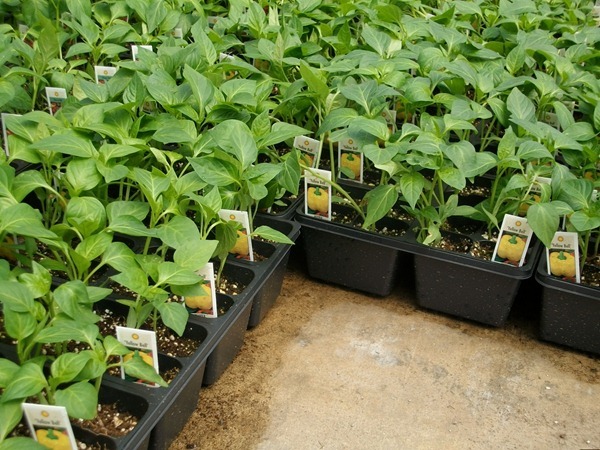 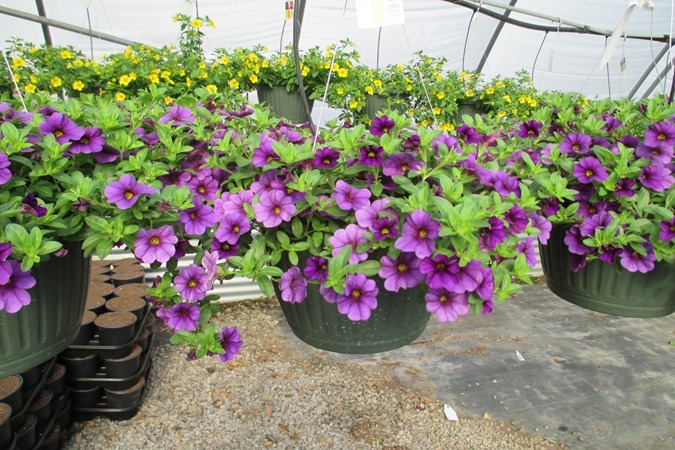 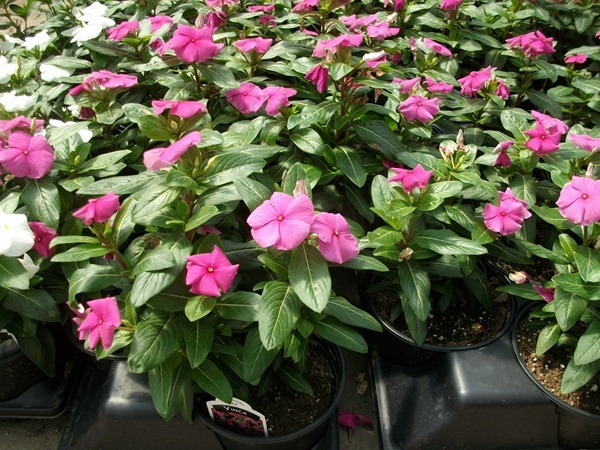 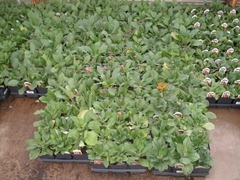 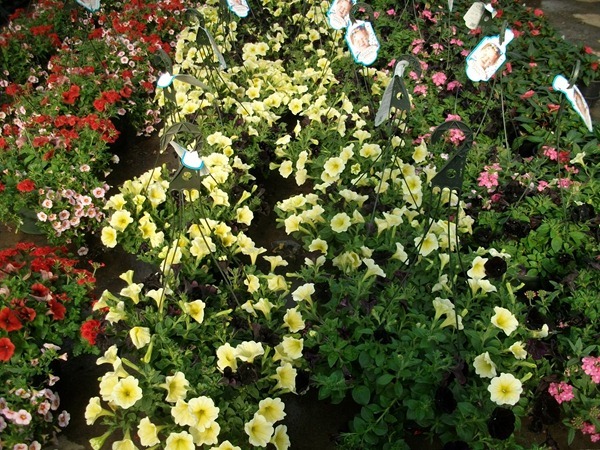 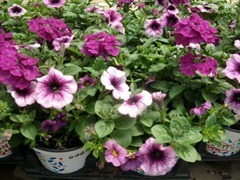 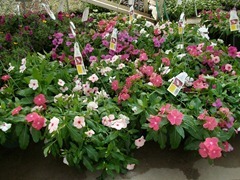 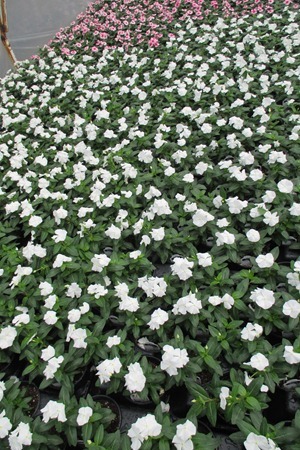 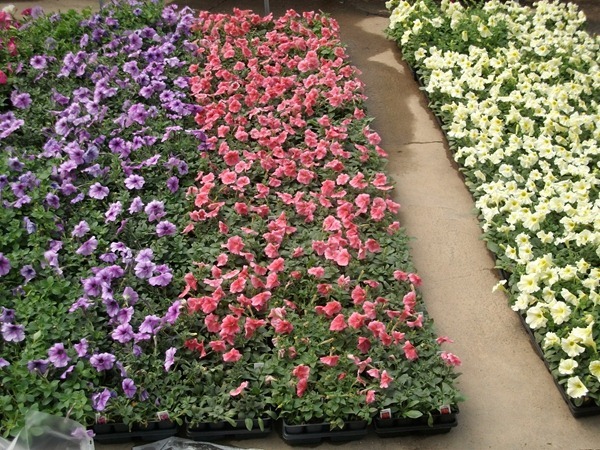 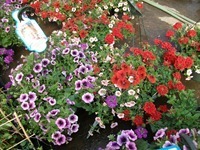 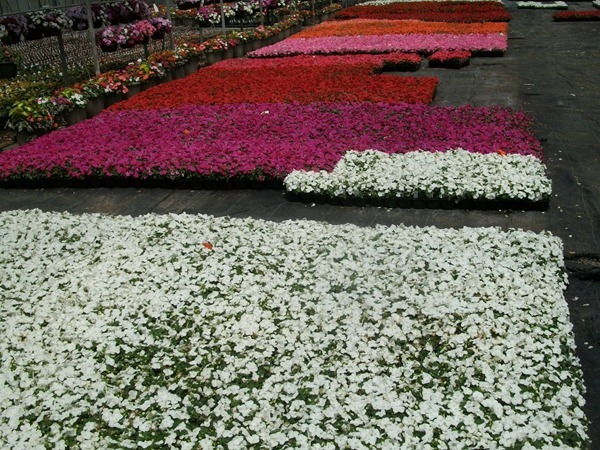 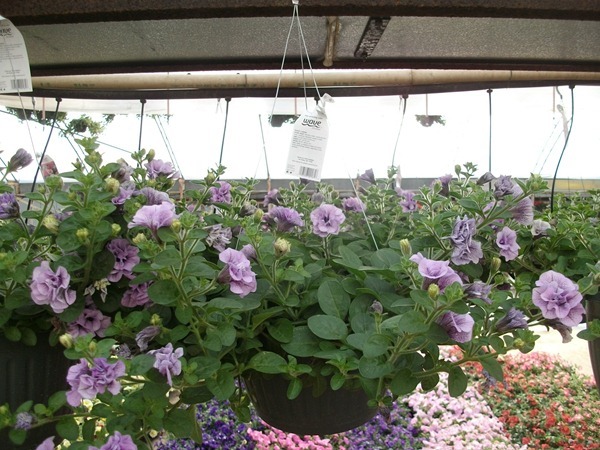 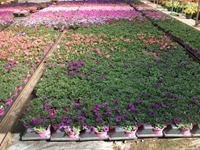 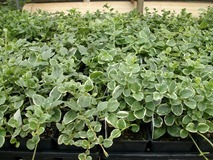 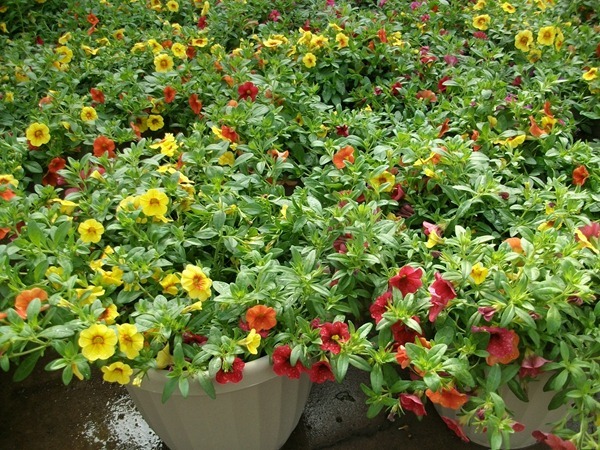 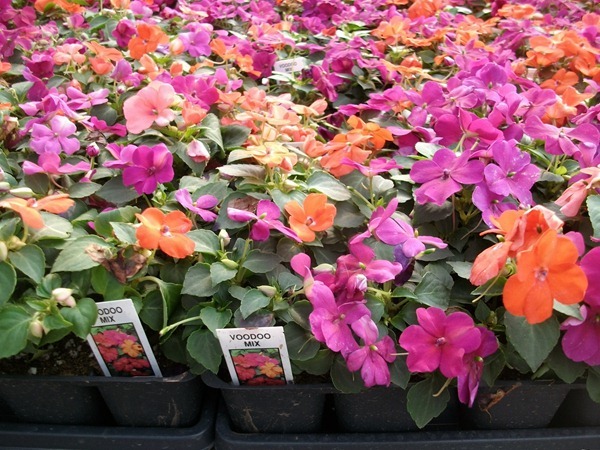 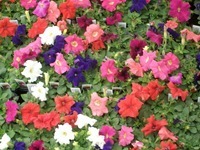 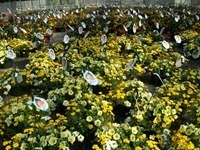 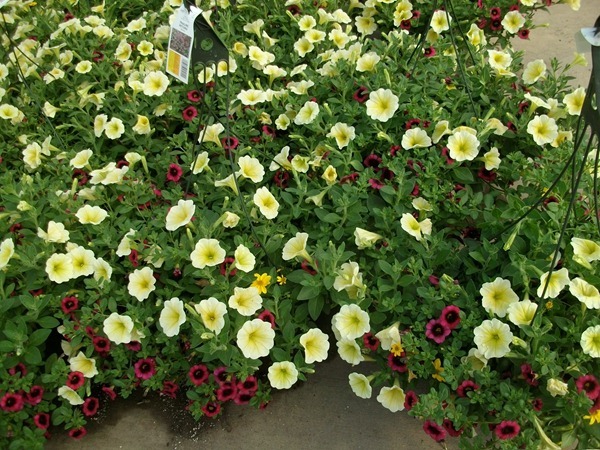 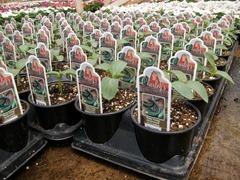 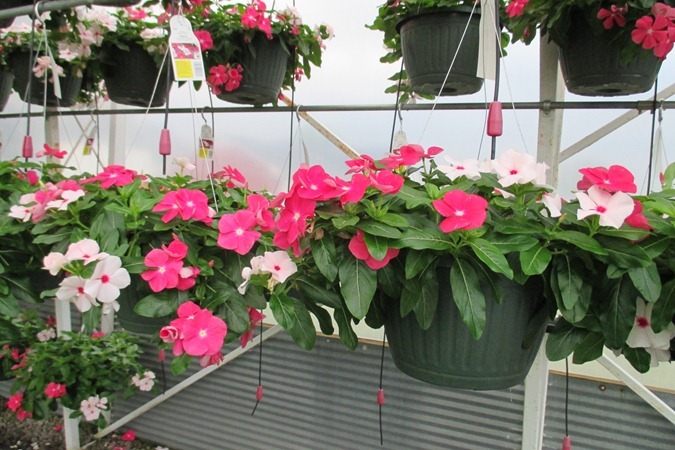 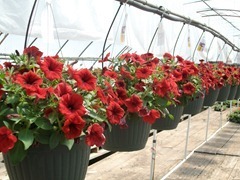 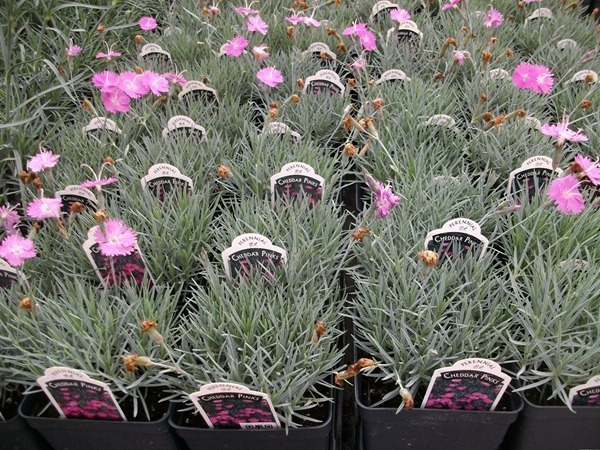 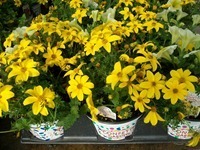 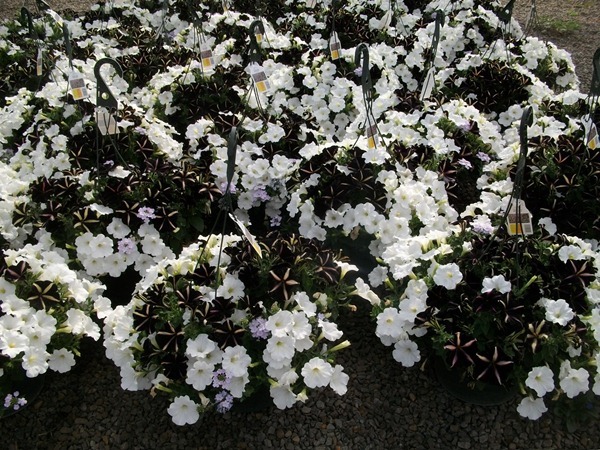 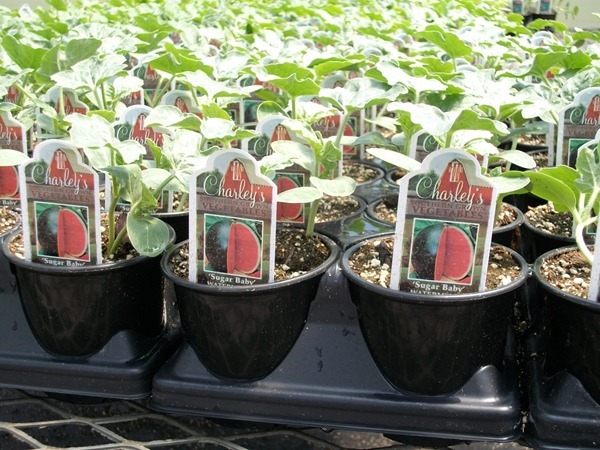 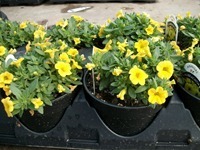 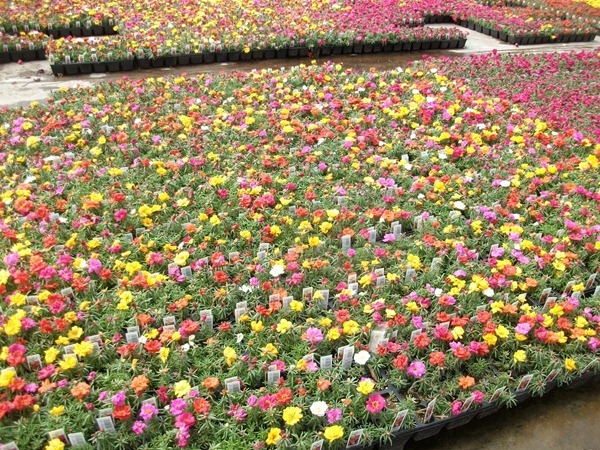 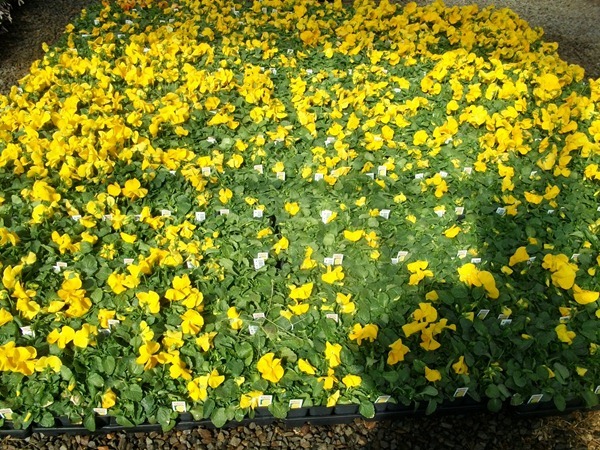 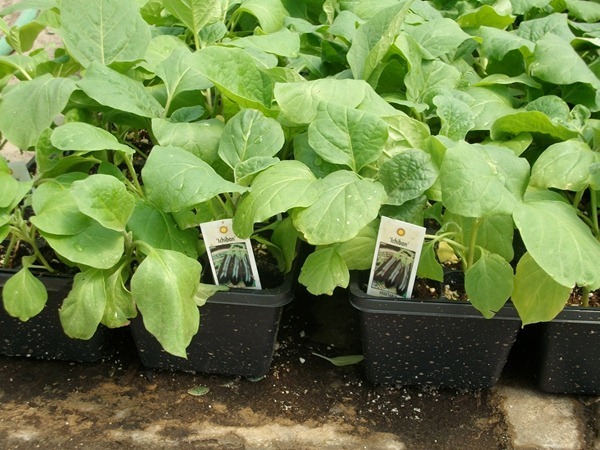 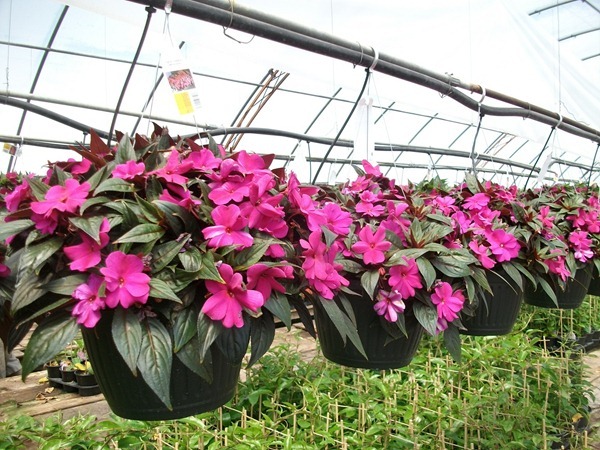 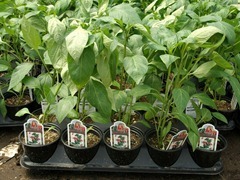 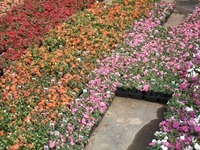 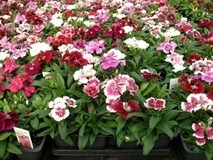 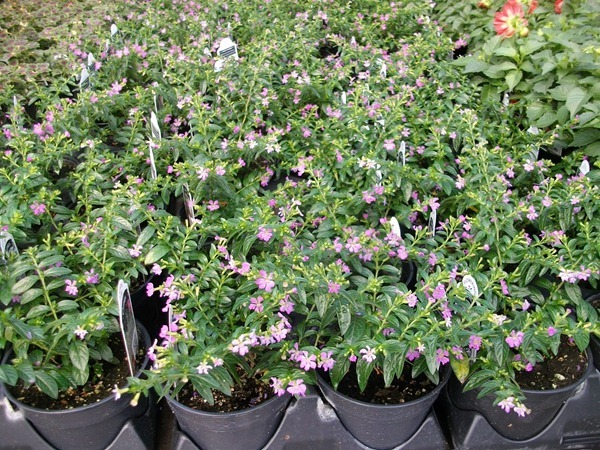 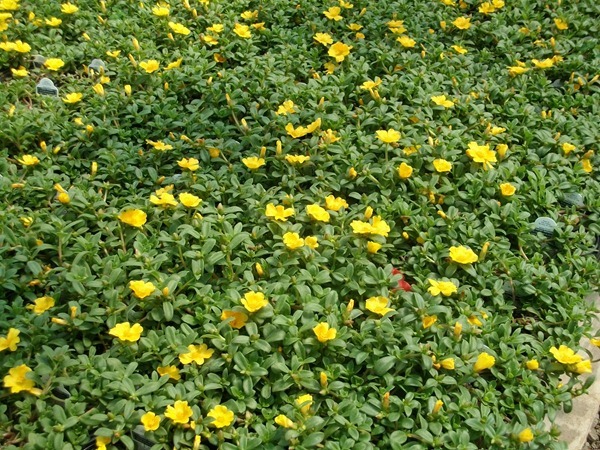 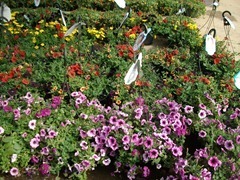 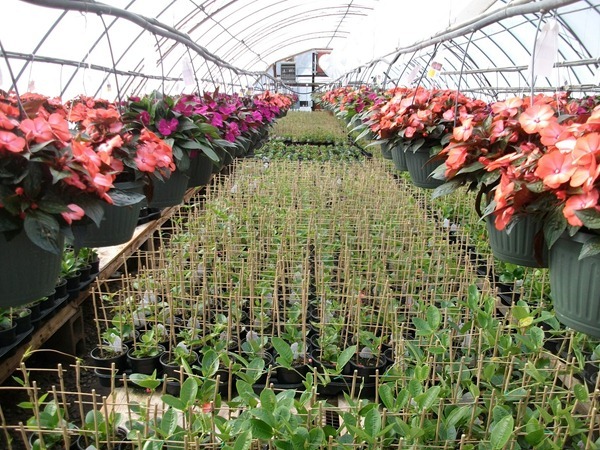 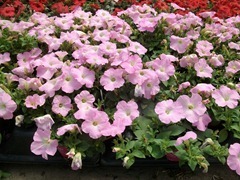 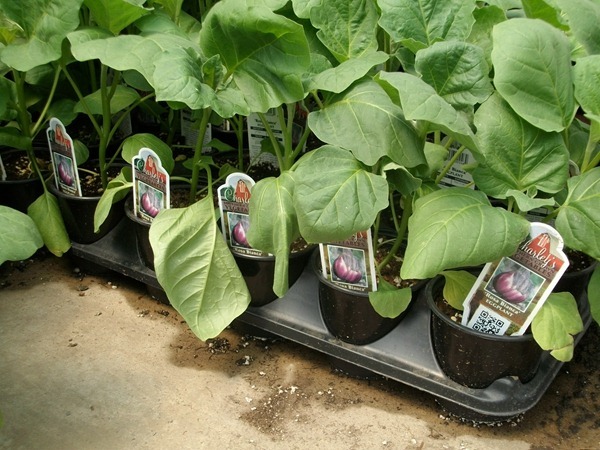 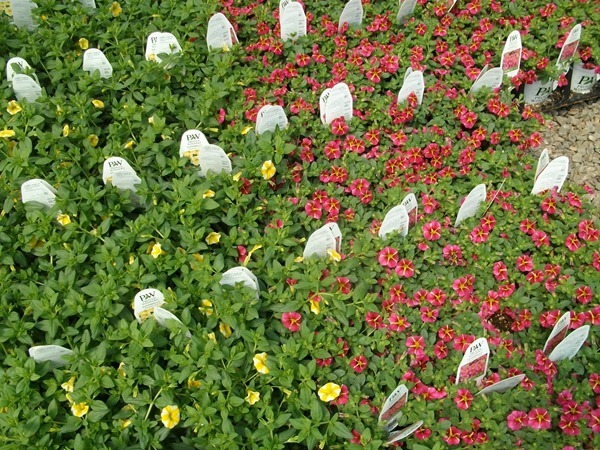 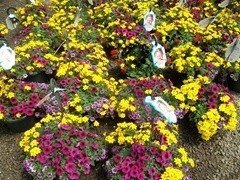 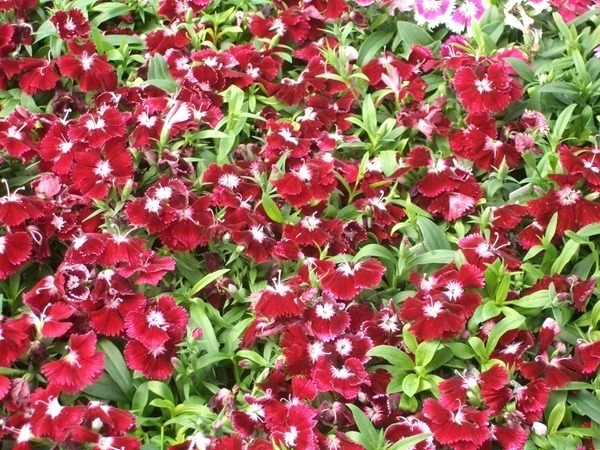 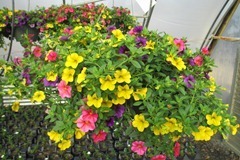 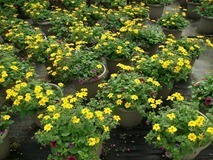 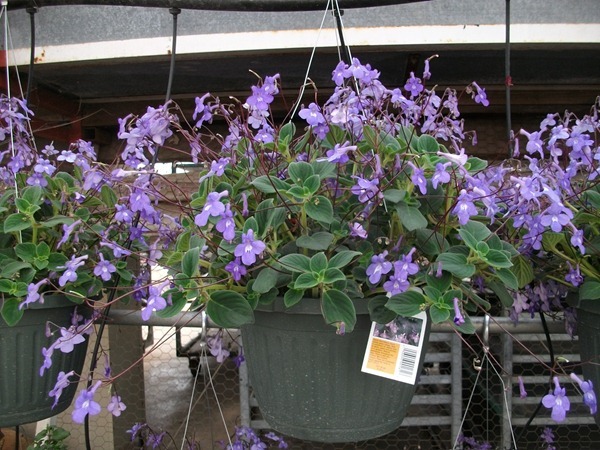 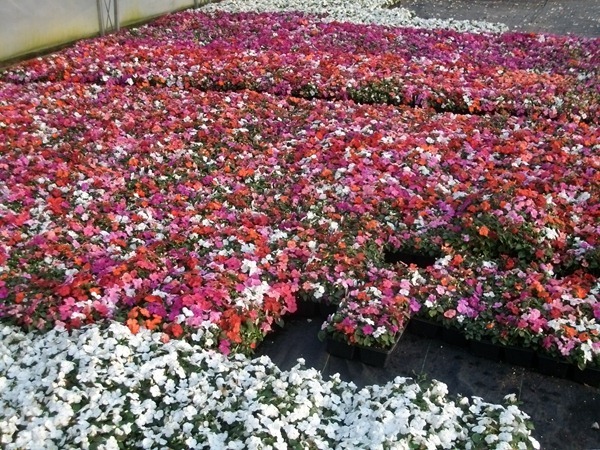 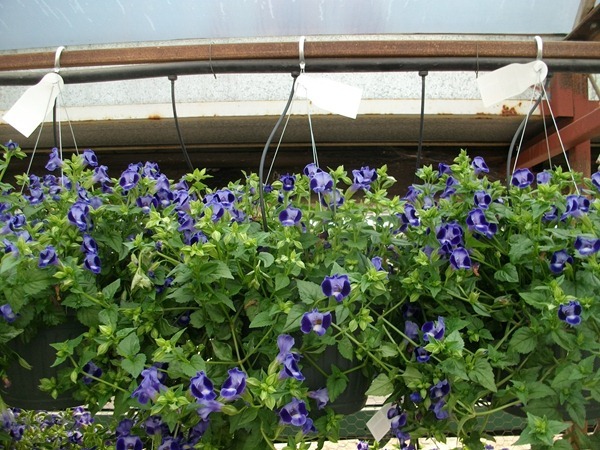 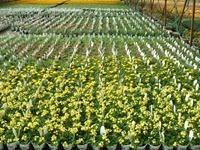 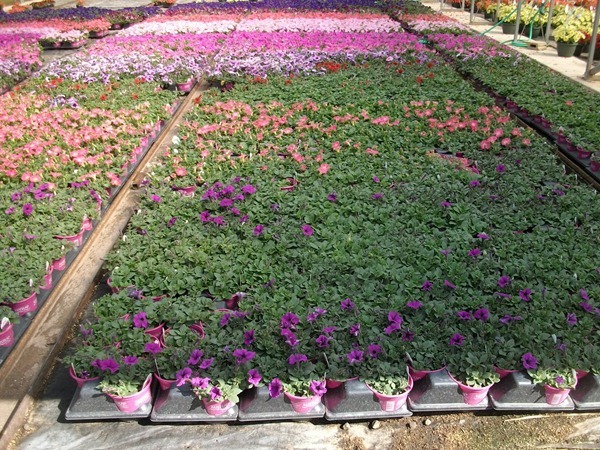 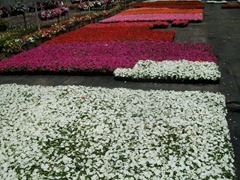 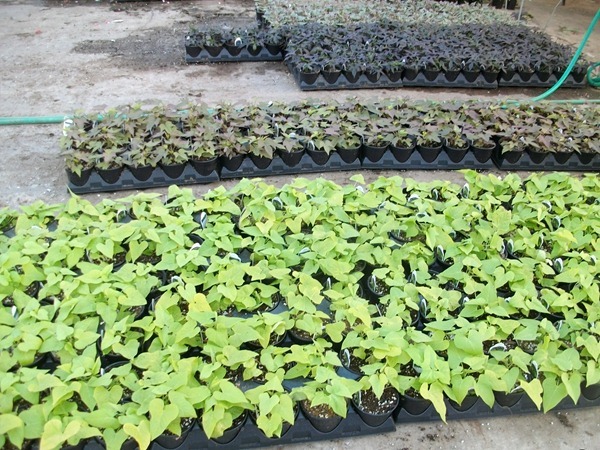 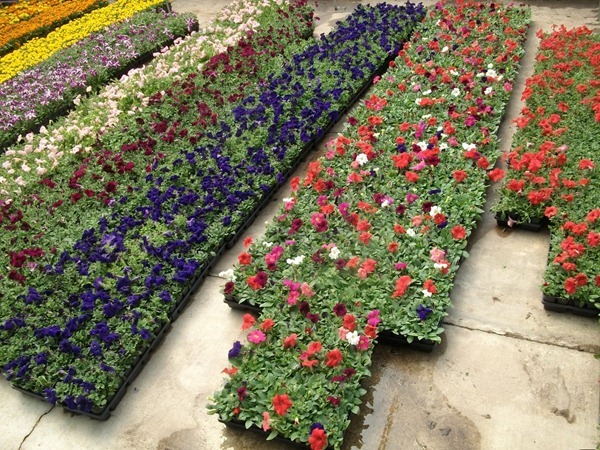 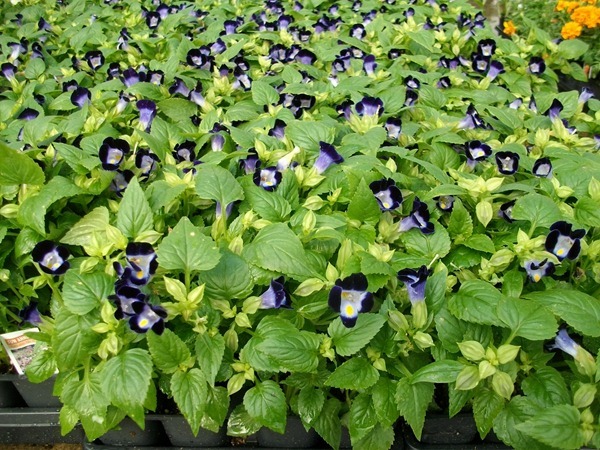 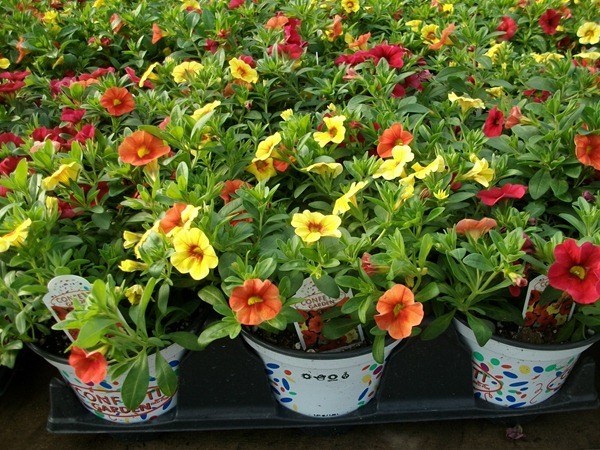 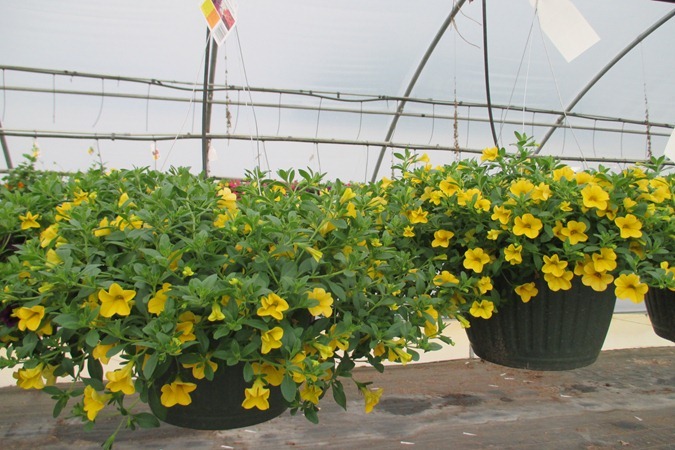 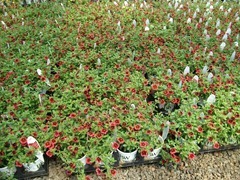 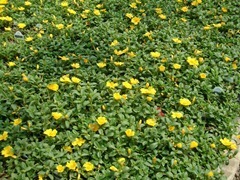 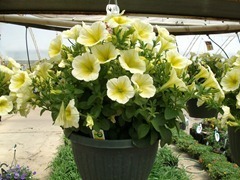 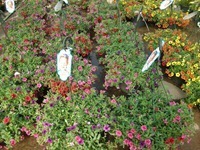 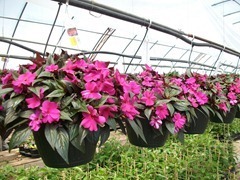 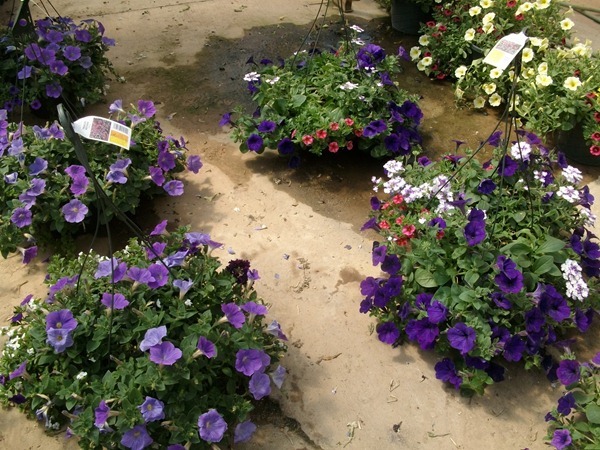 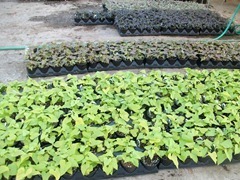 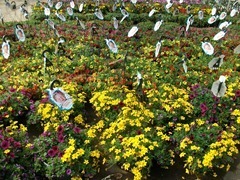 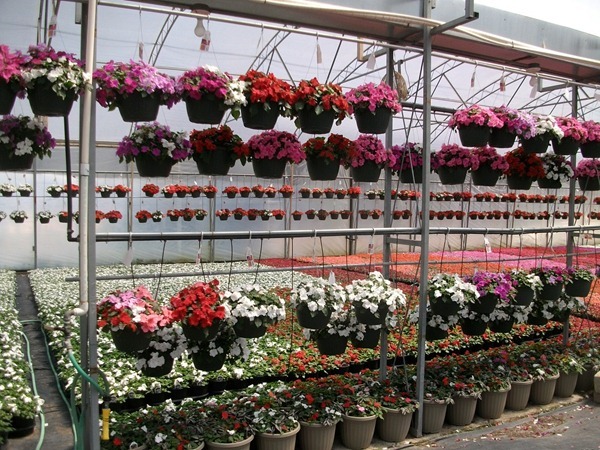 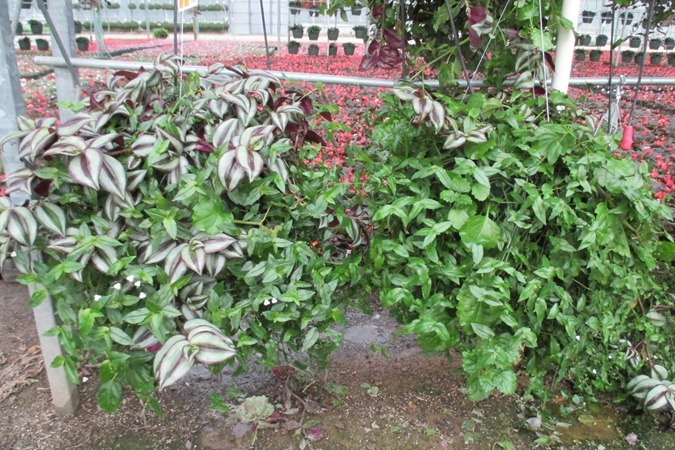 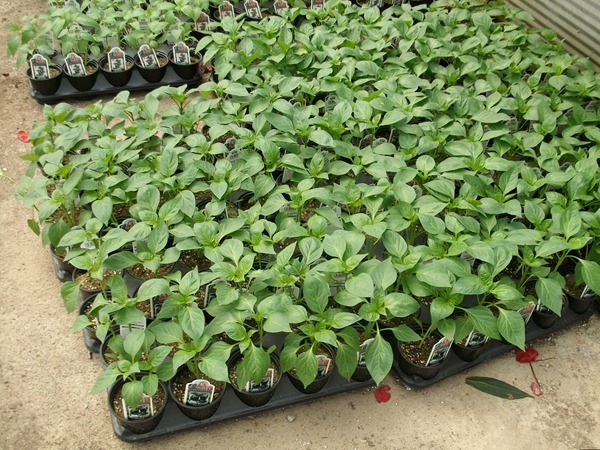 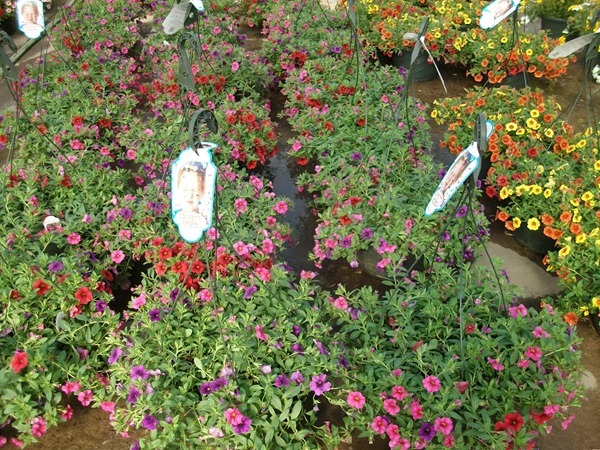 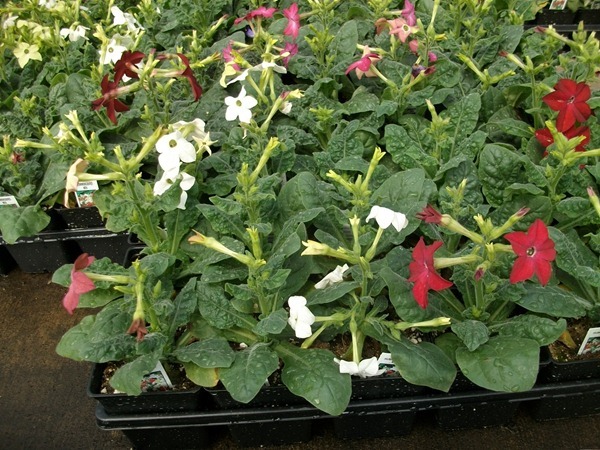 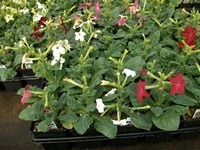 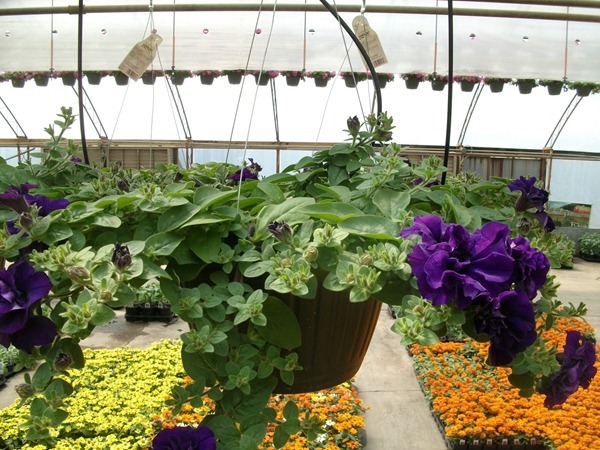 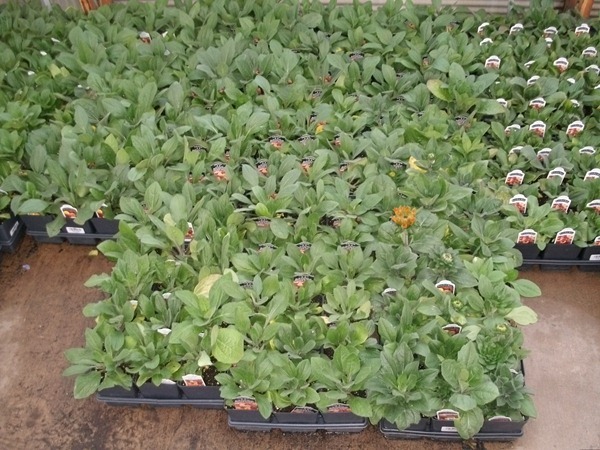 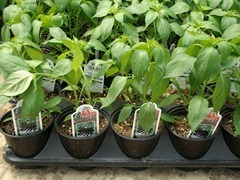 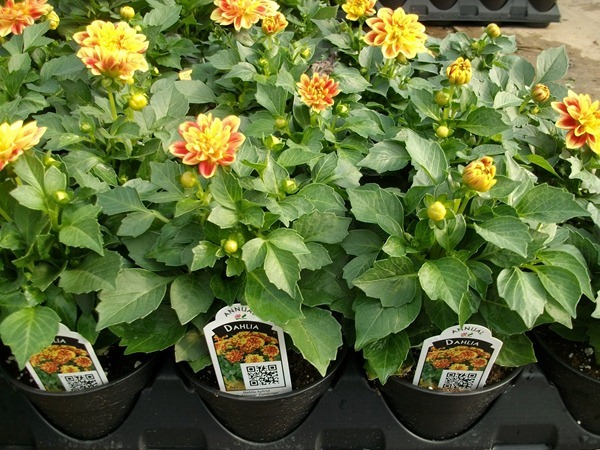 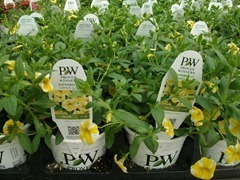 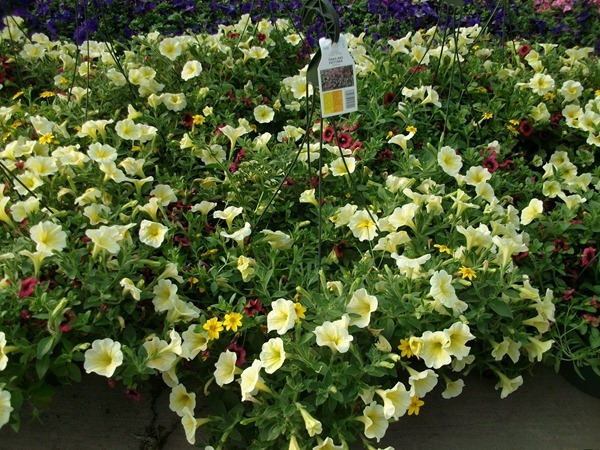 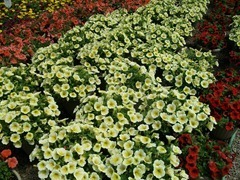 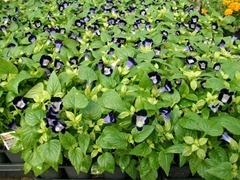 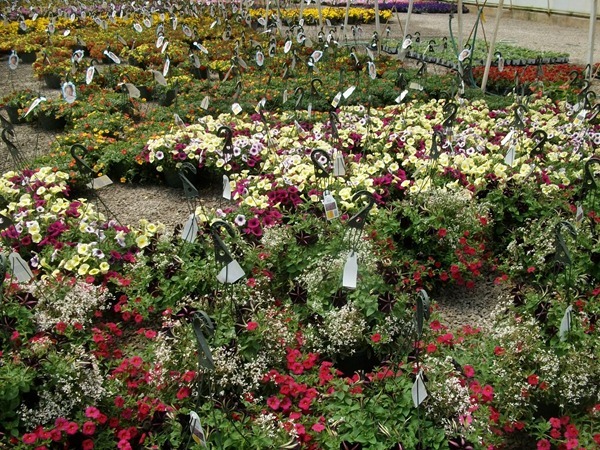 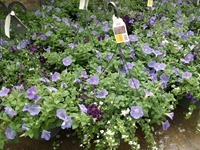 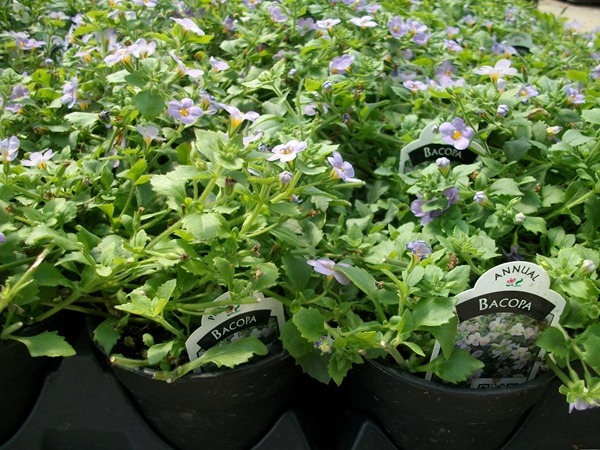 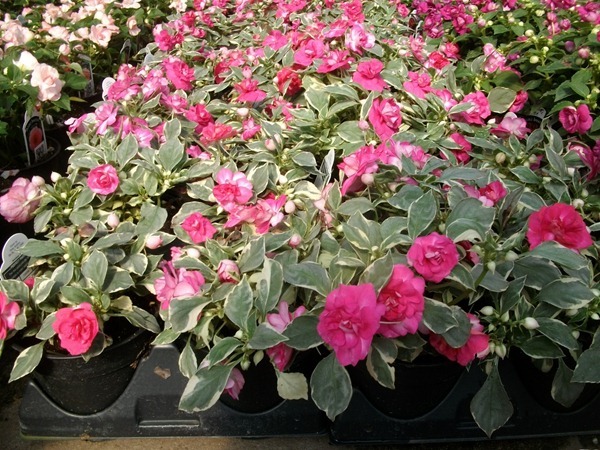 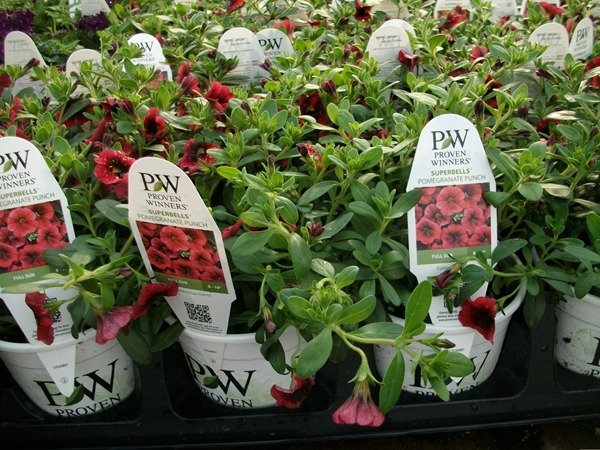 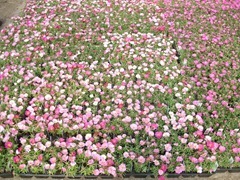 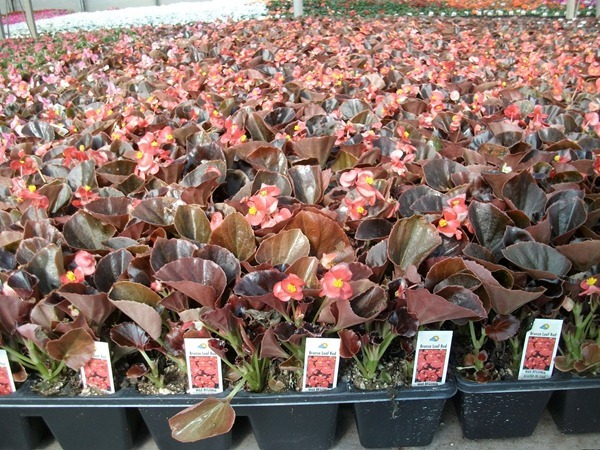 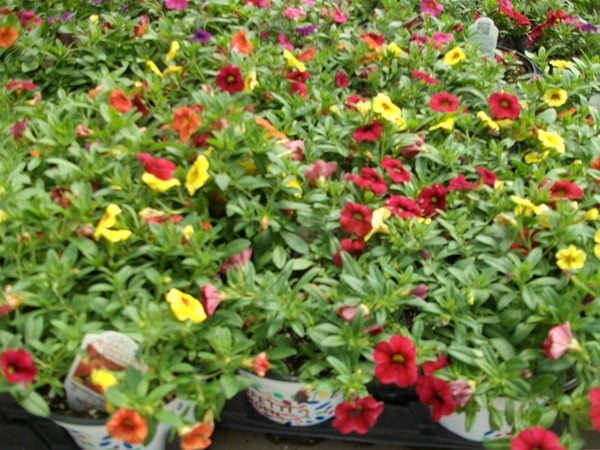 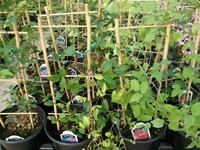 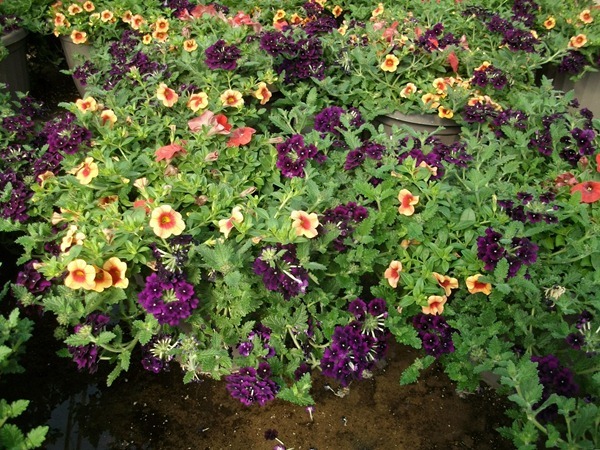 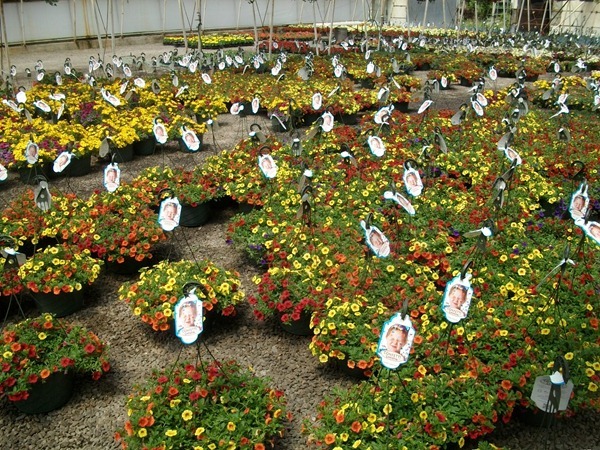 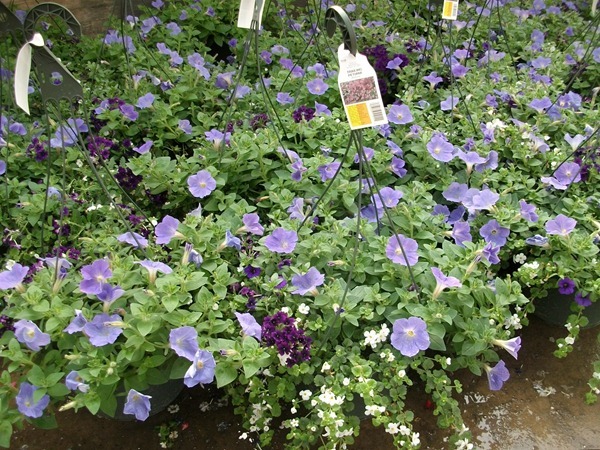 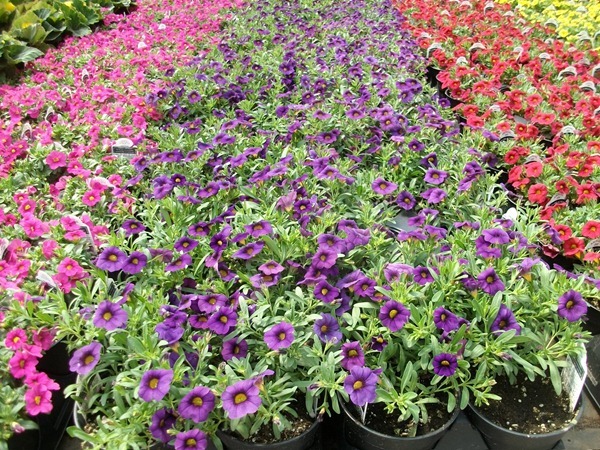 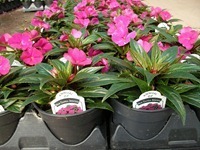 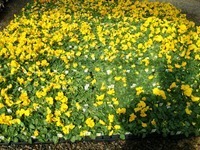 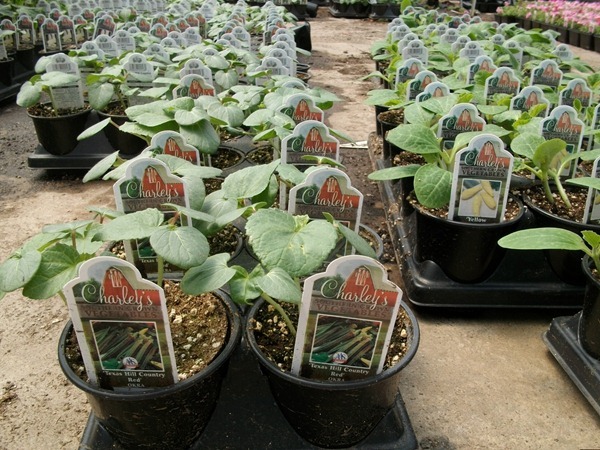 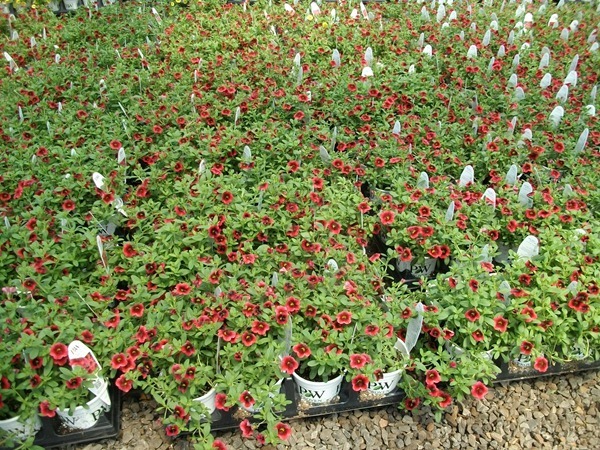 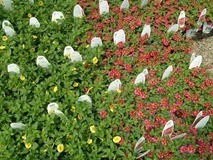 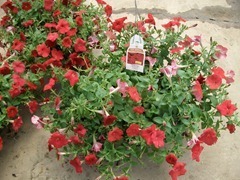 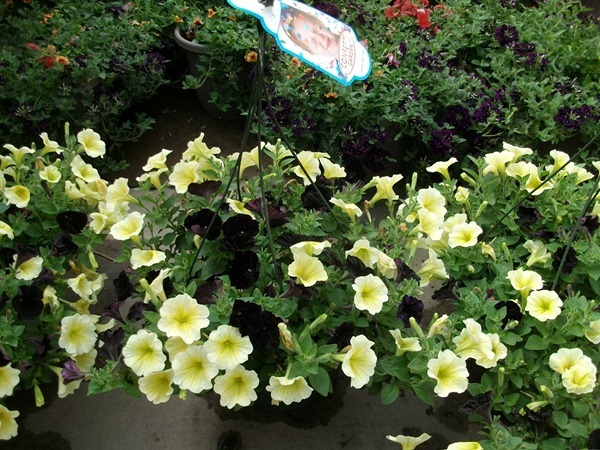 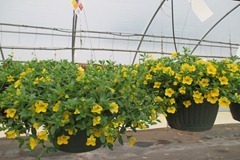 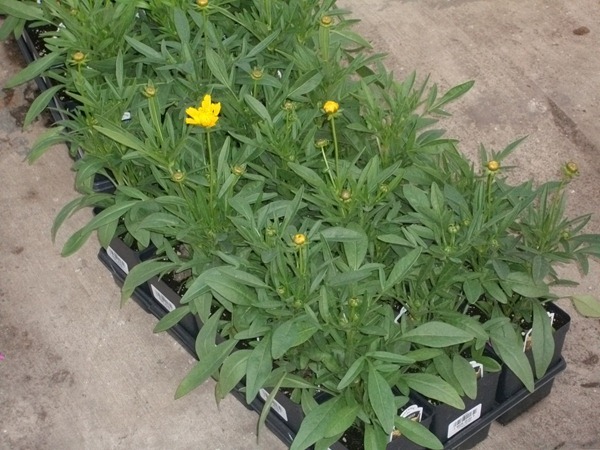 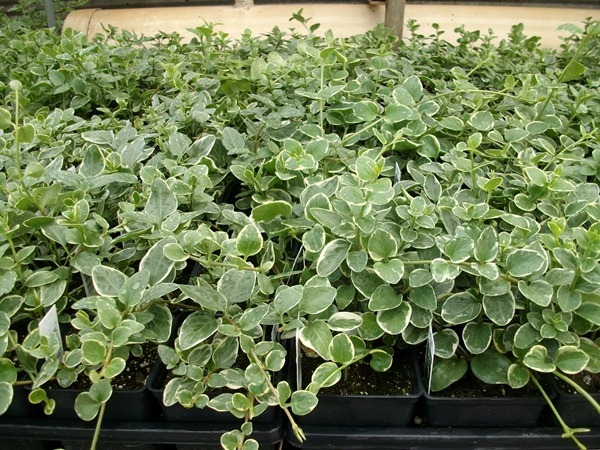 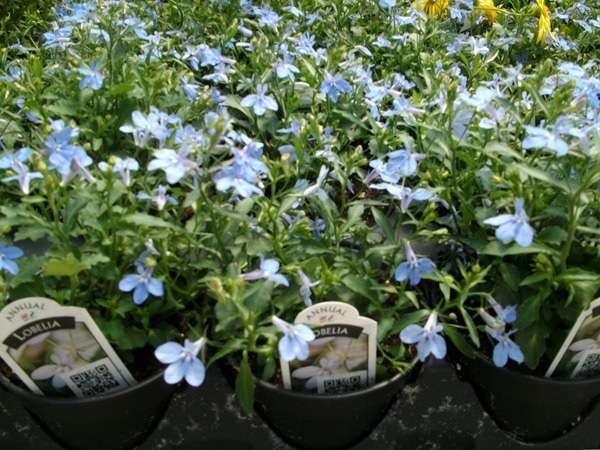 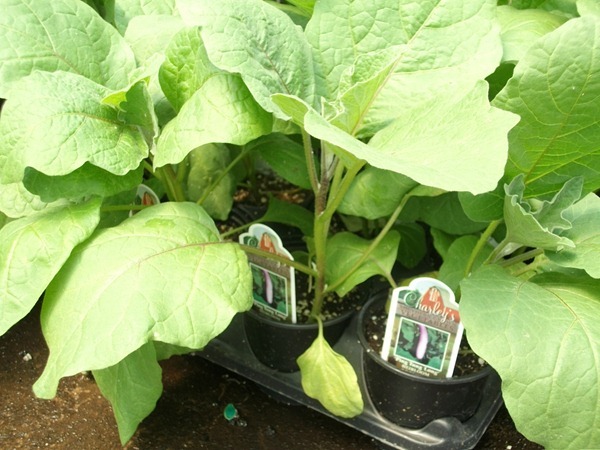 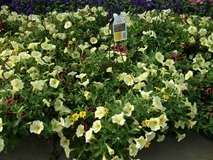 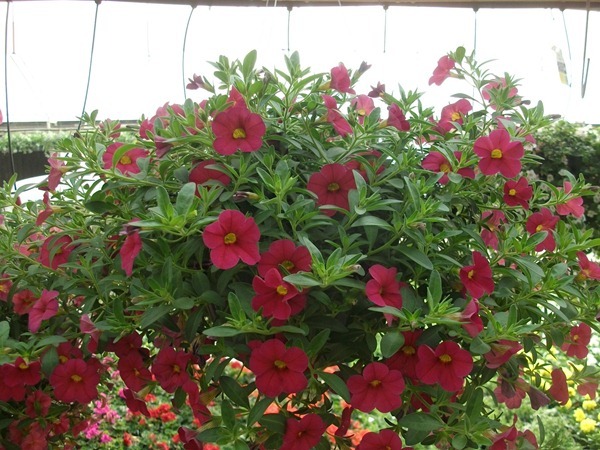 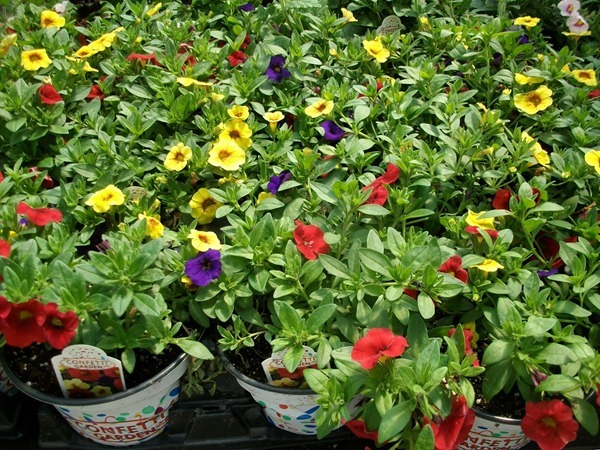 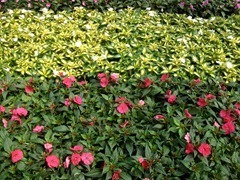 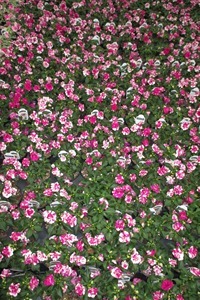 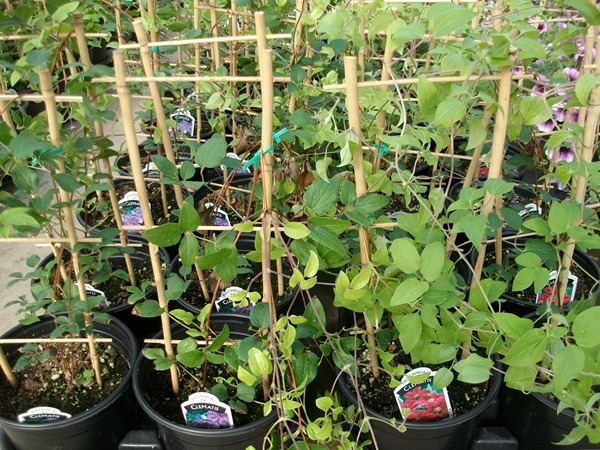 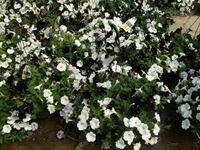 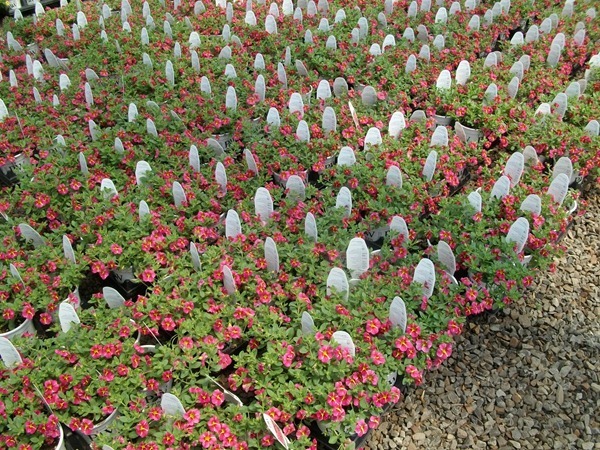 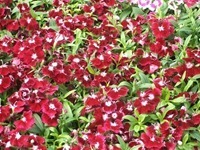 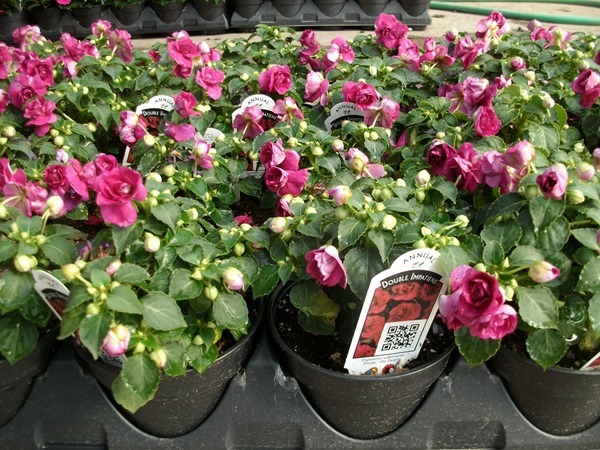 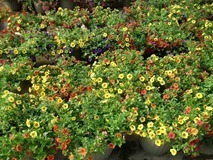 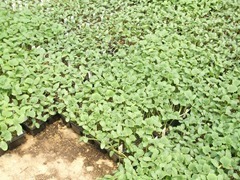 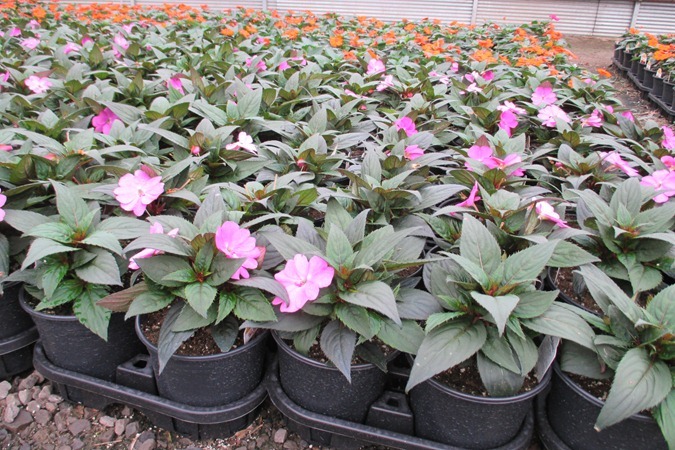 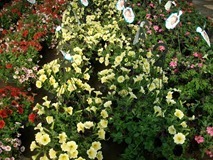 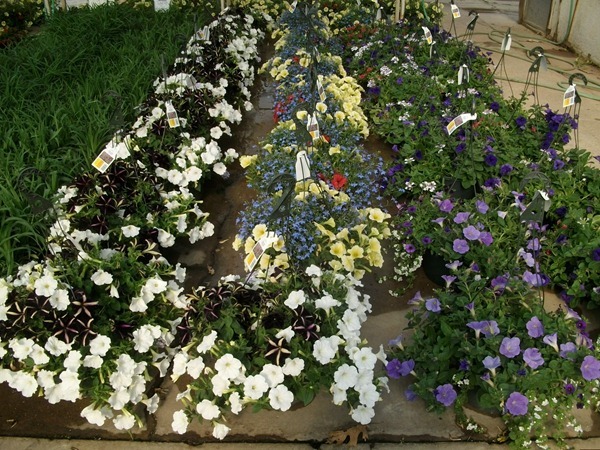 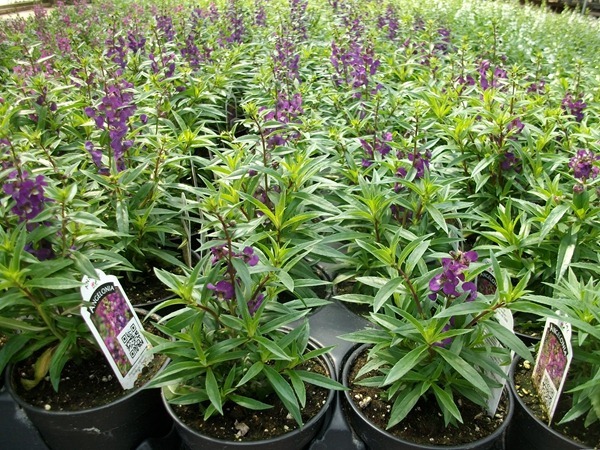 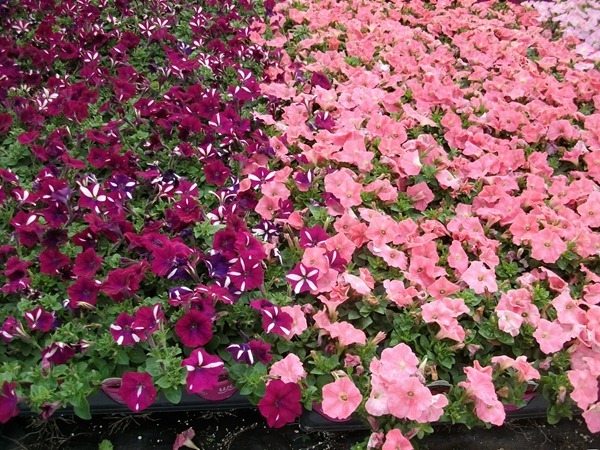 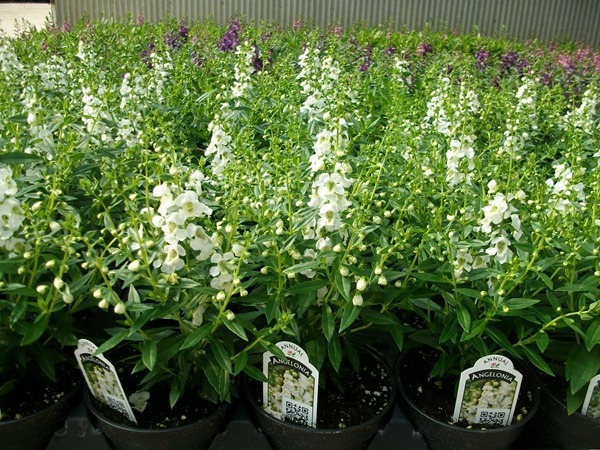 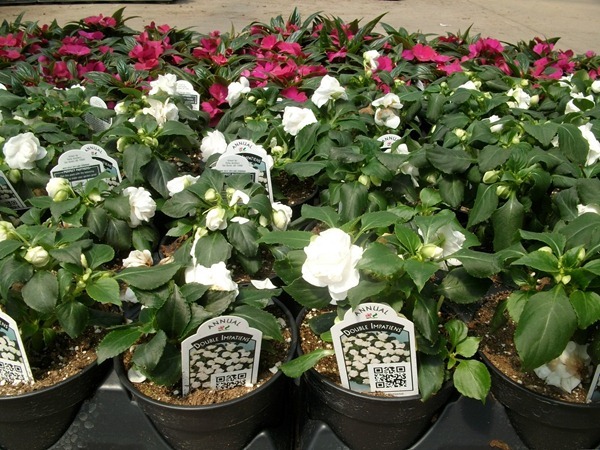 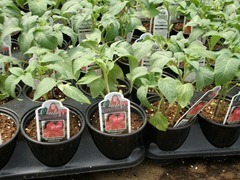 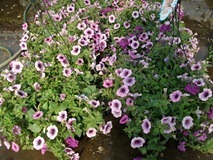 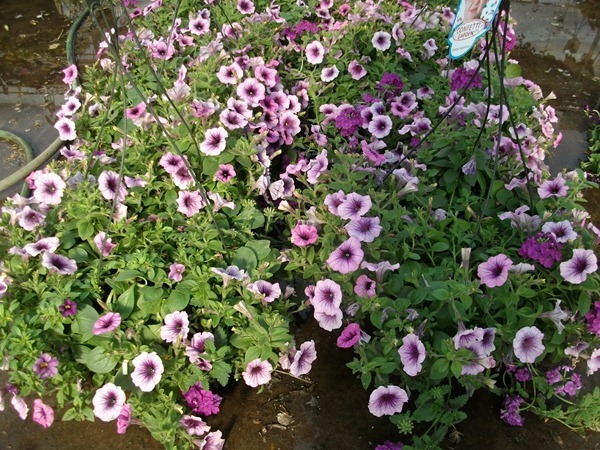 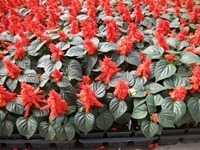 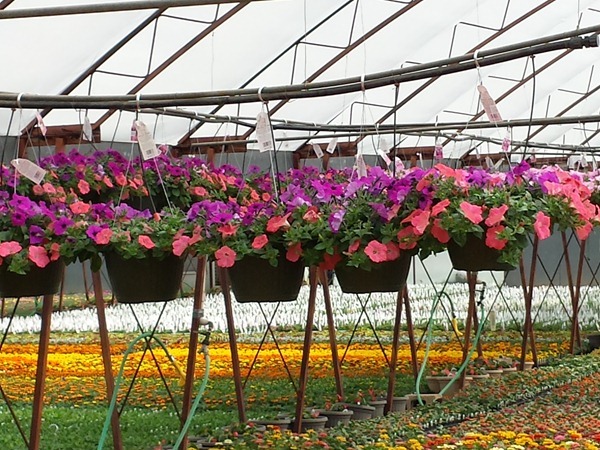 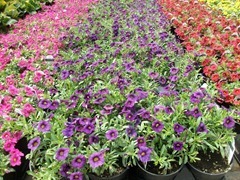 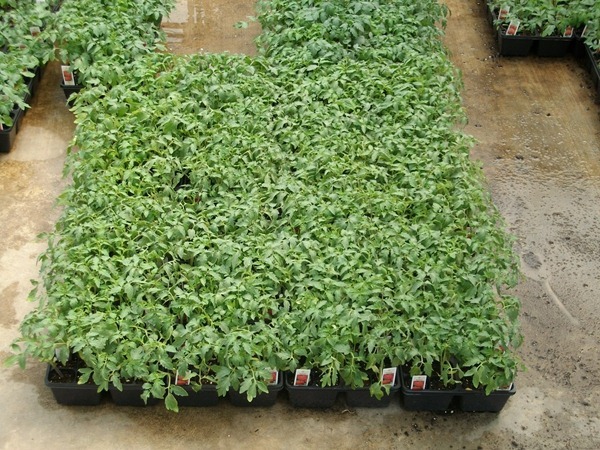 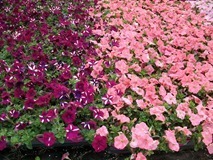 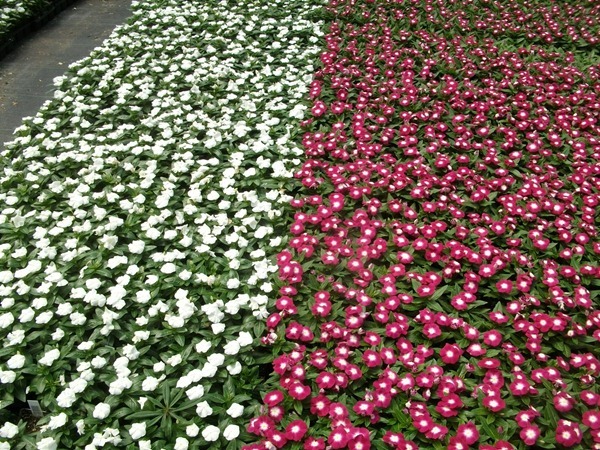 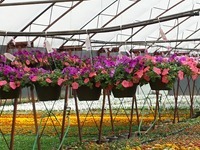 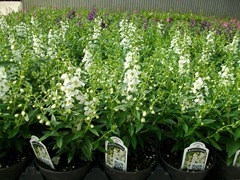 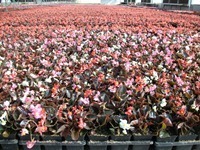 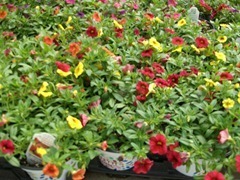 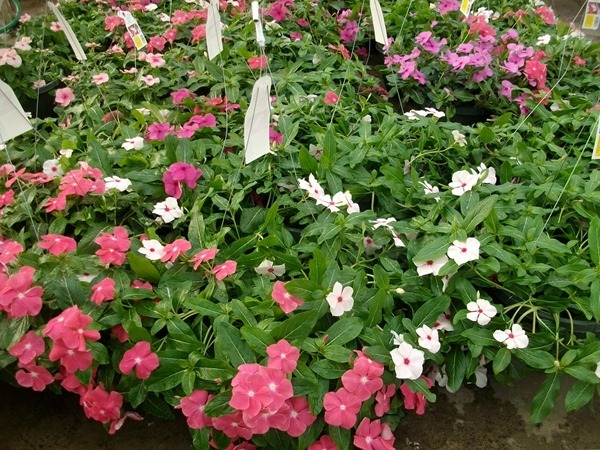 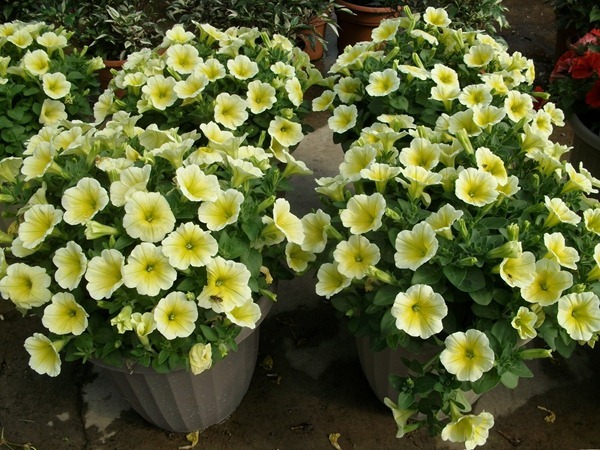 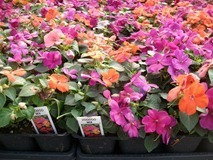 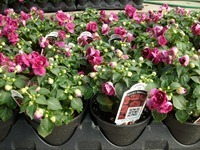 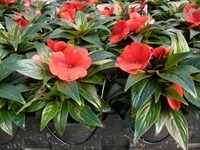 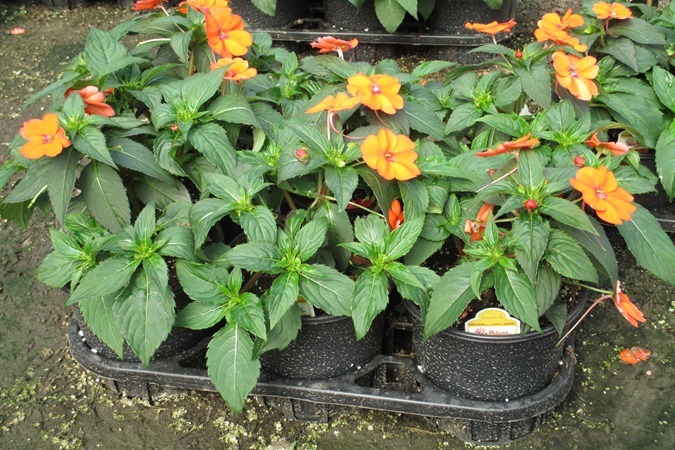 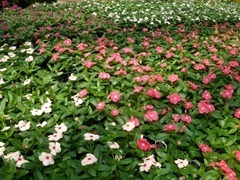 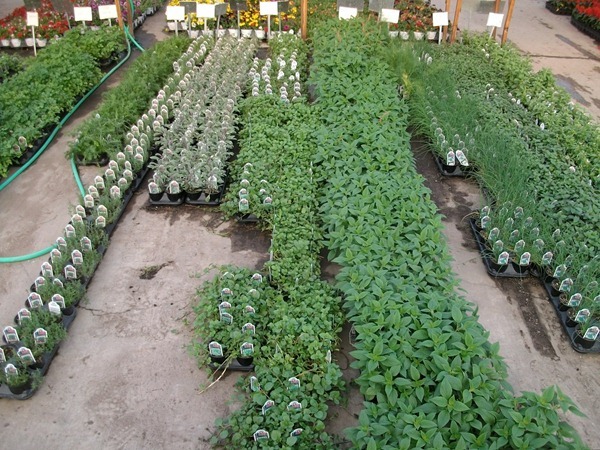 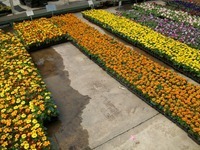 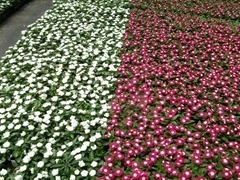 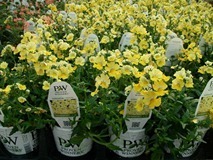 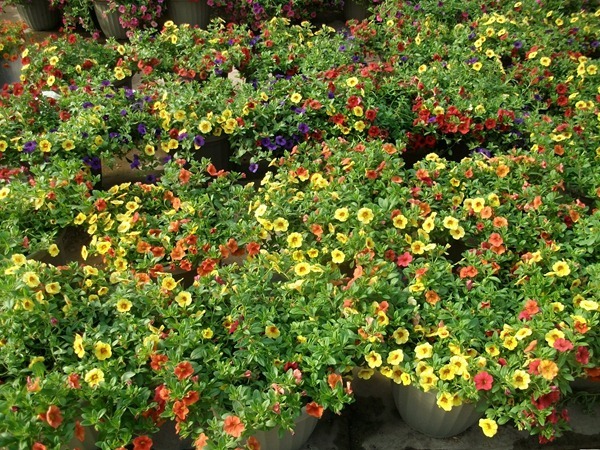 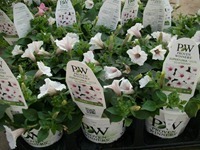 The last picture in this section is the newest planting of Wave Petunias we have available. 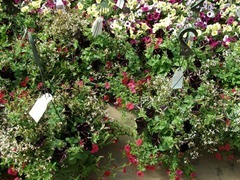 #10 Baskets – they are moving fast so be sure to get your orders in as soon as you can. 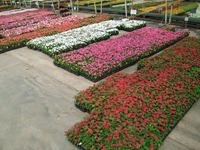 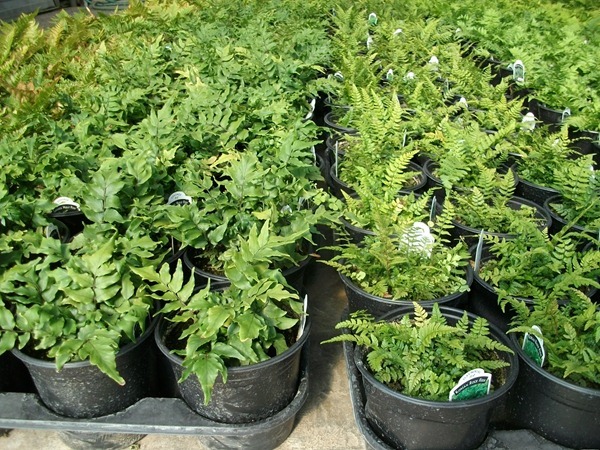 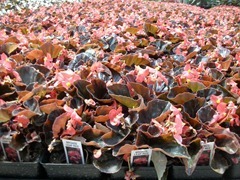 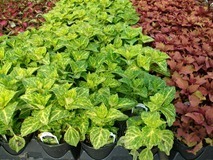 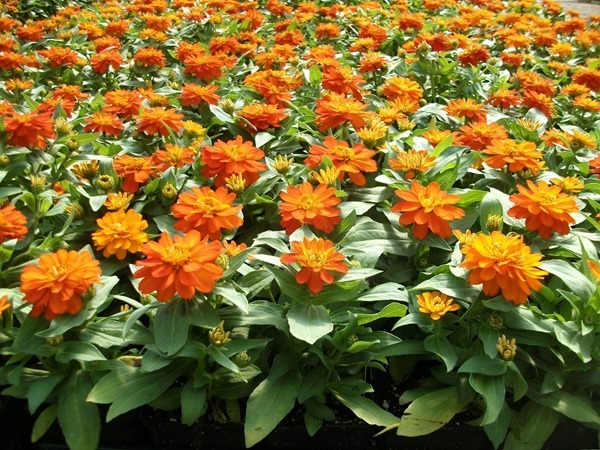 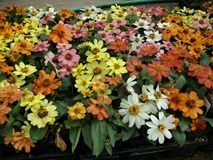 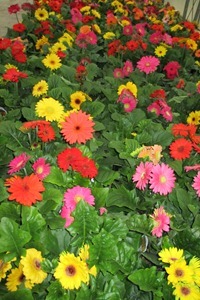 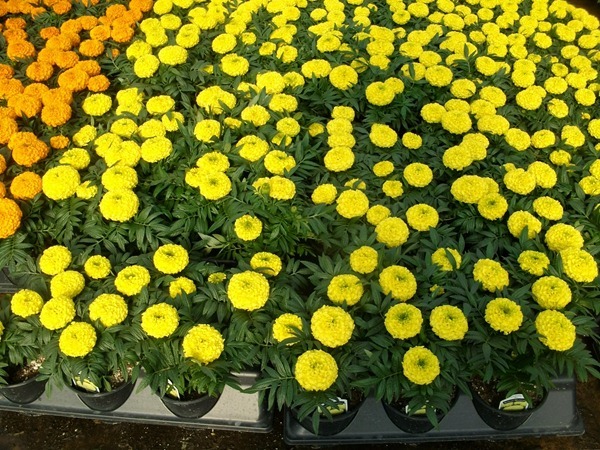 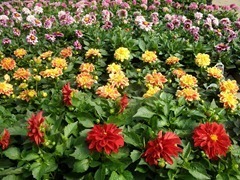 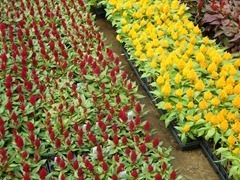 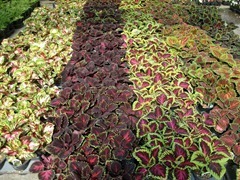 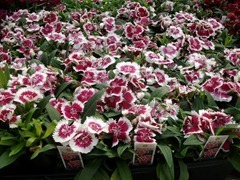 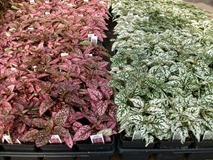 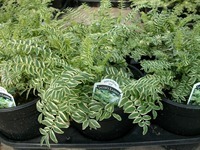 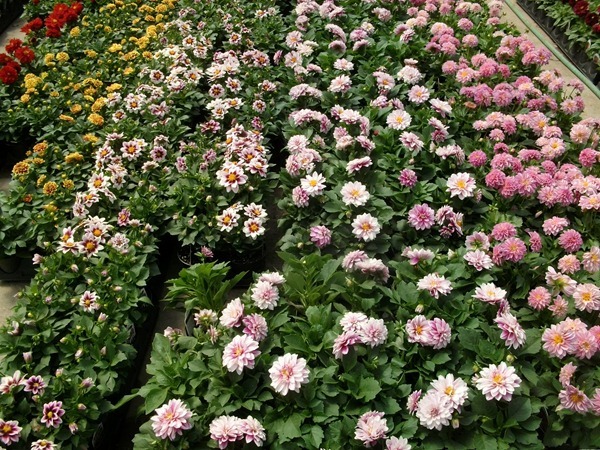 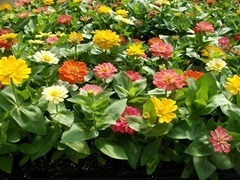 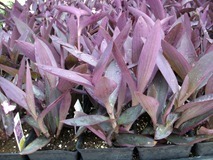 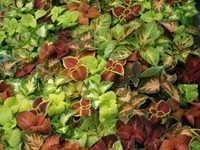 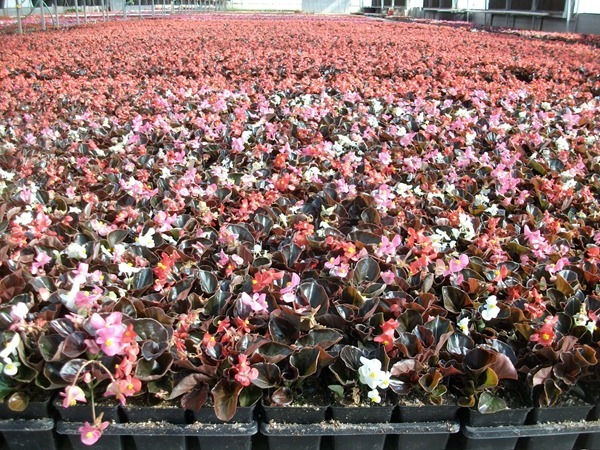 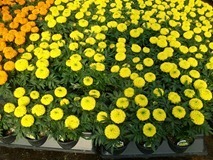 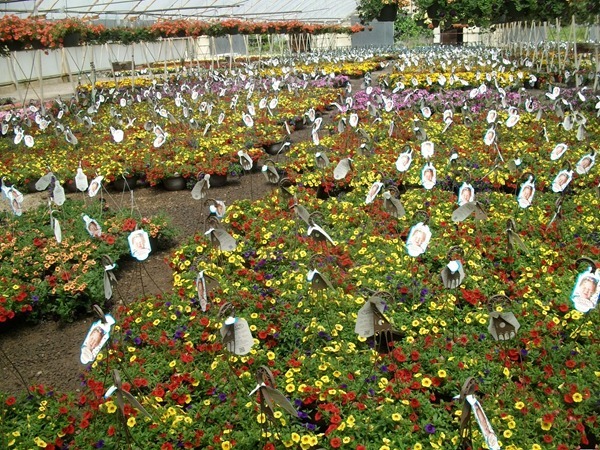 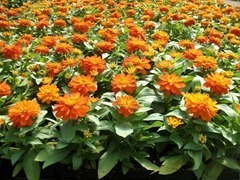 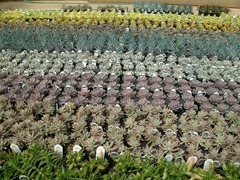 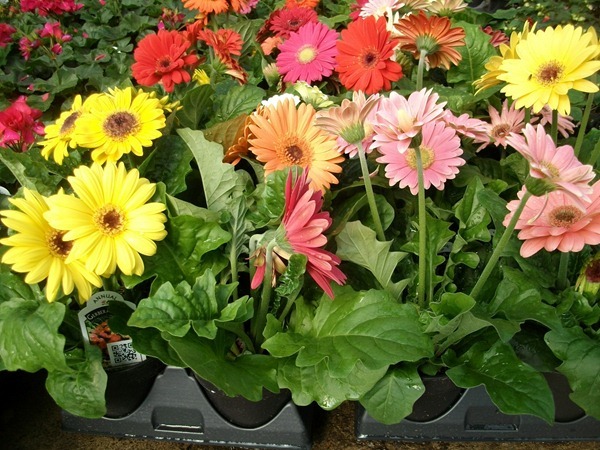 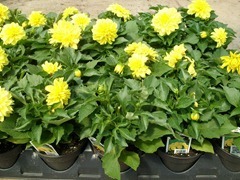 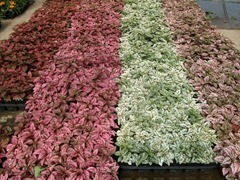 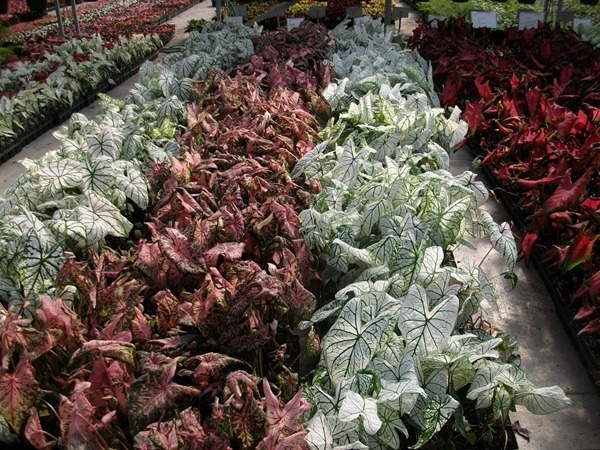 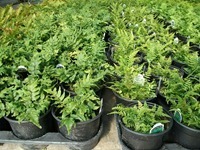 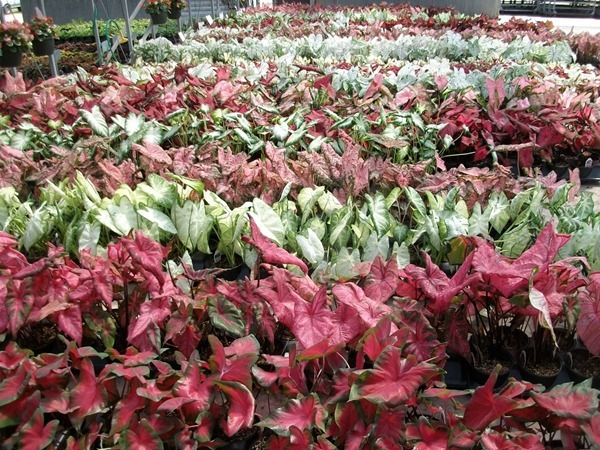 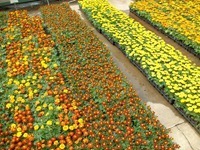 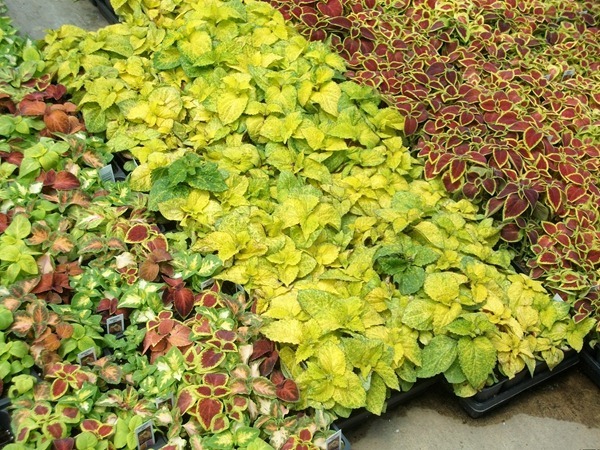 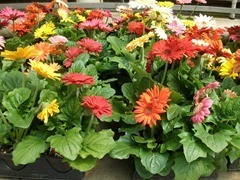 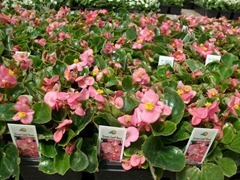 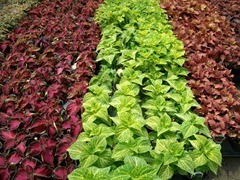 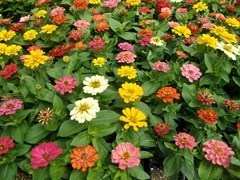 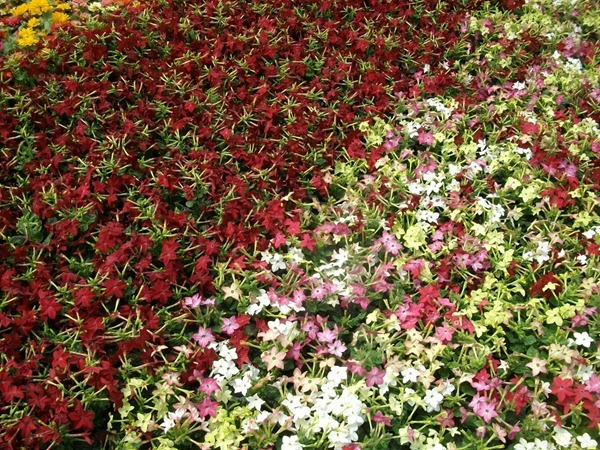 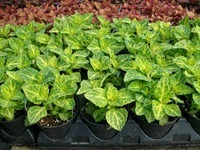 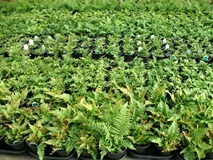 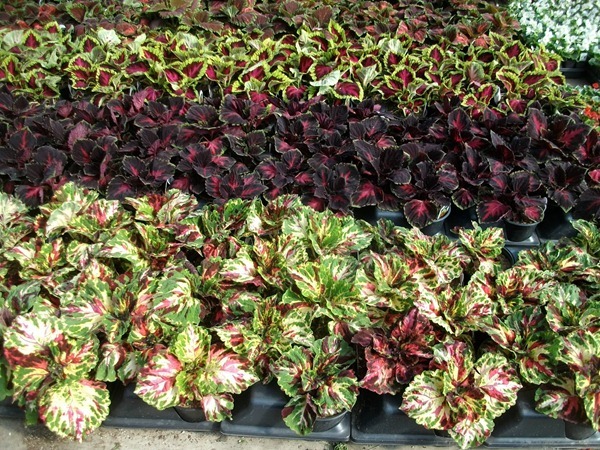 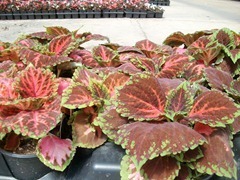 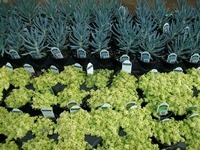 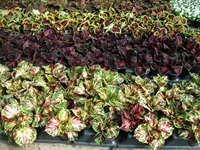 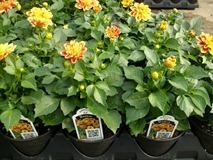 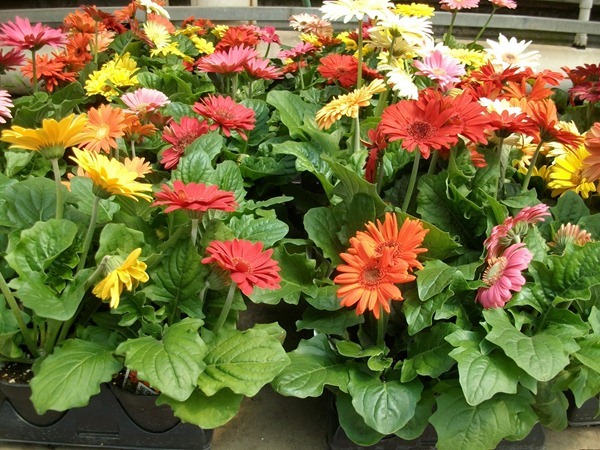 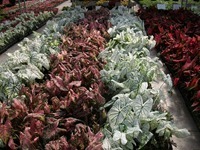 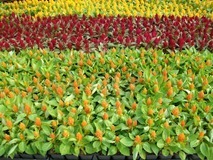 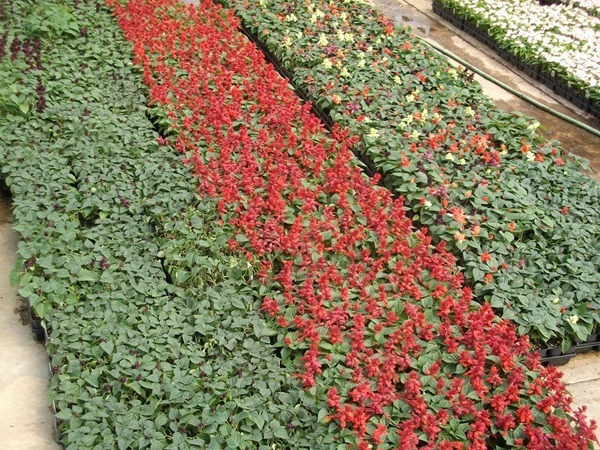 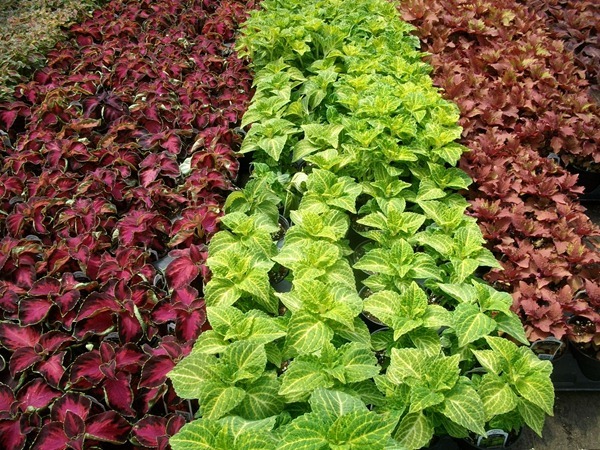 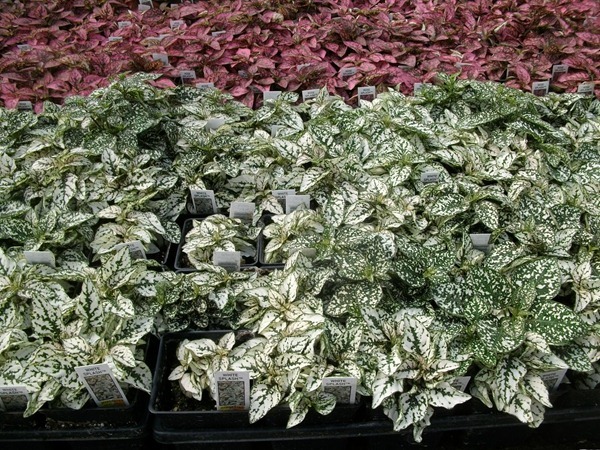 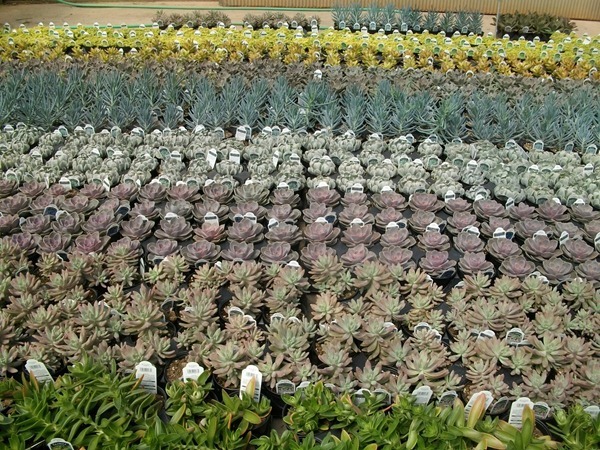 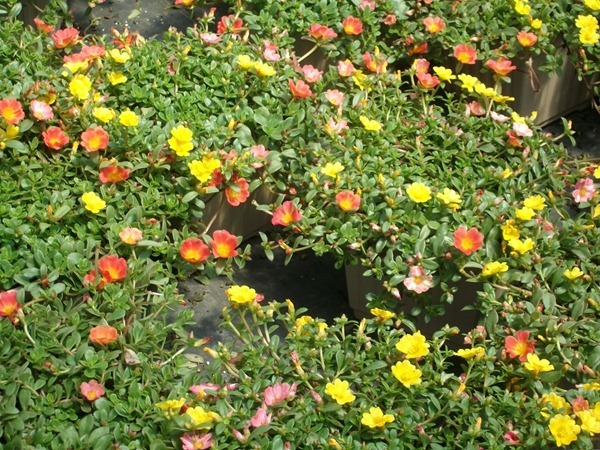 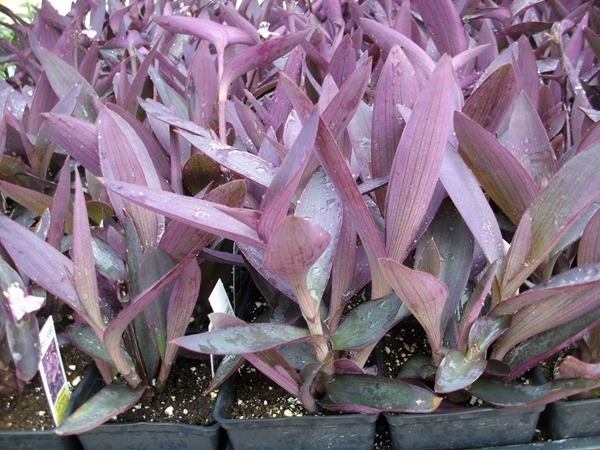 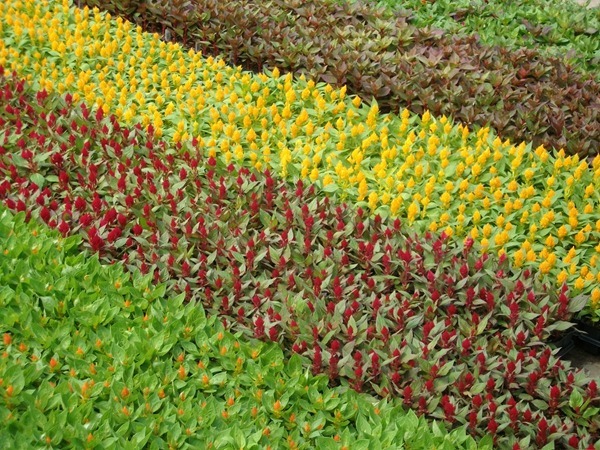 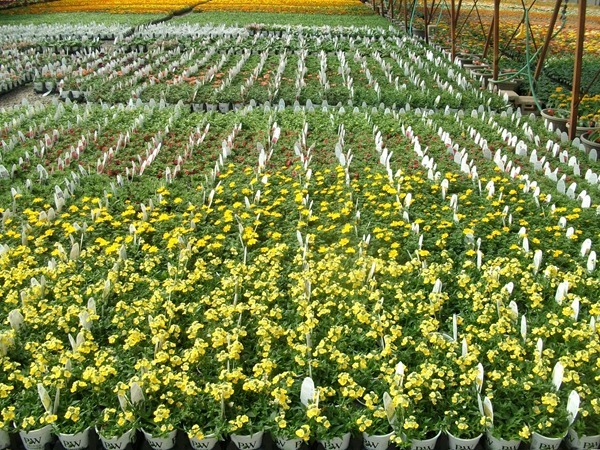 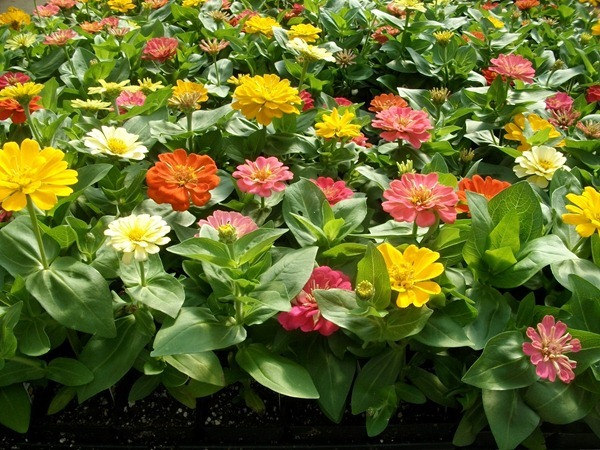 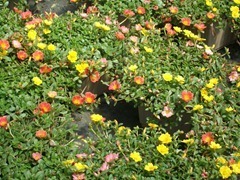 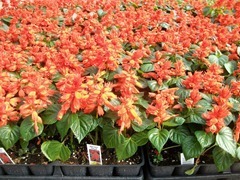 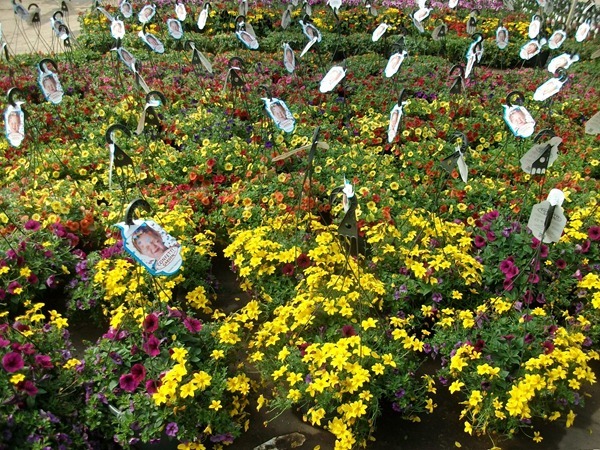 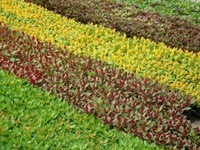 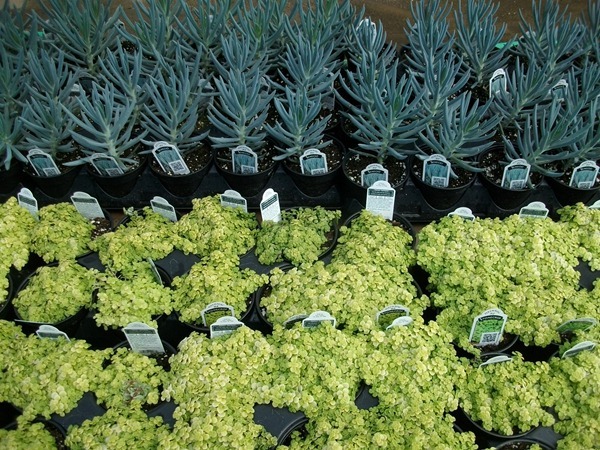 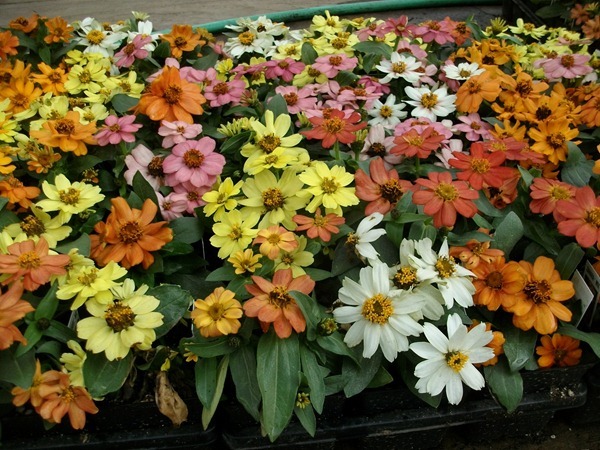 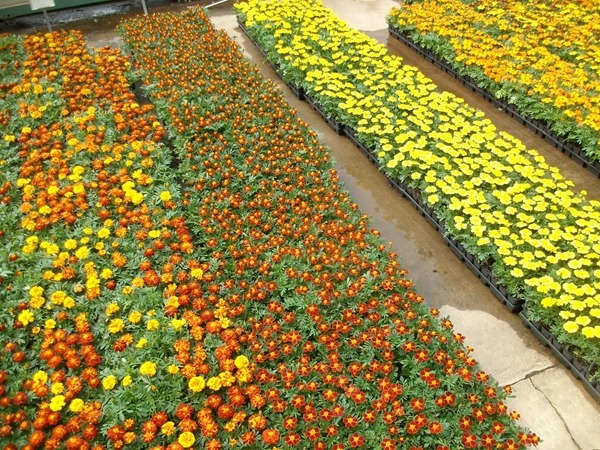 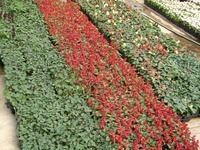 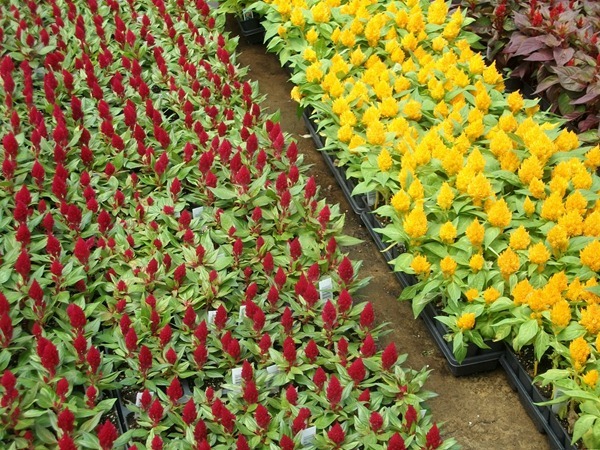 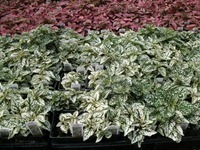 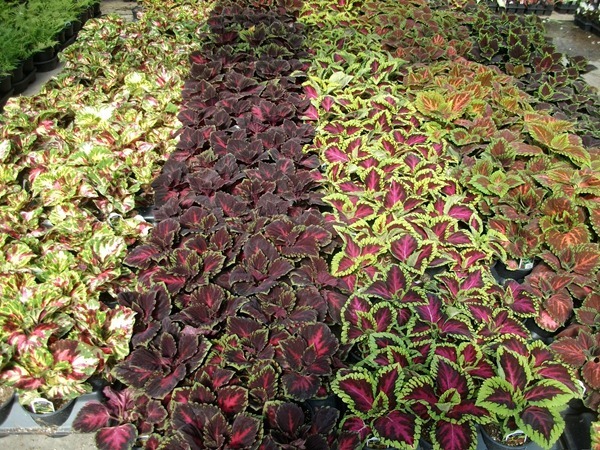 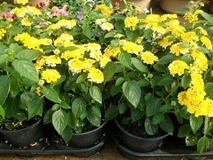 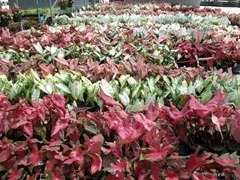 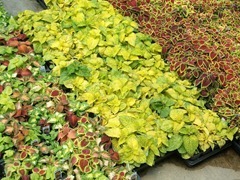 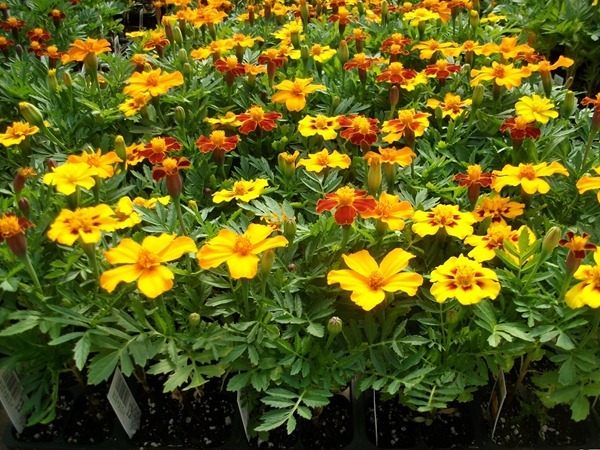 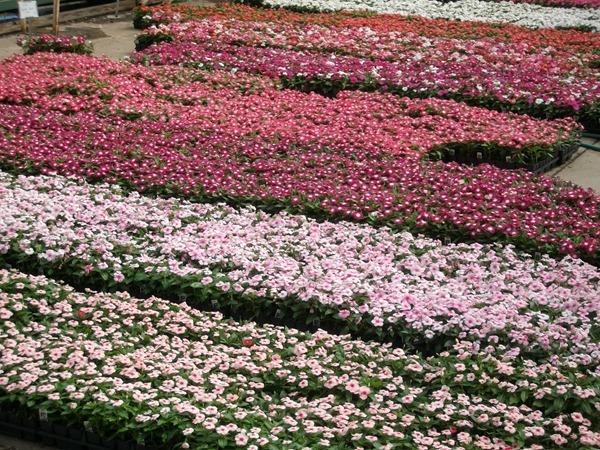 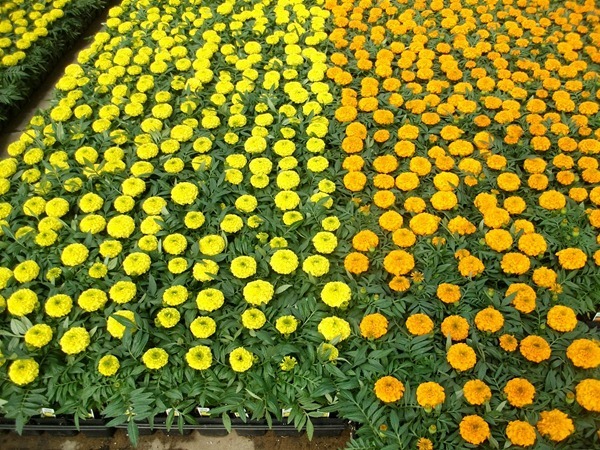 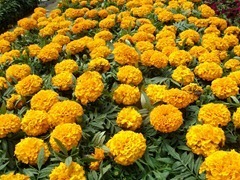 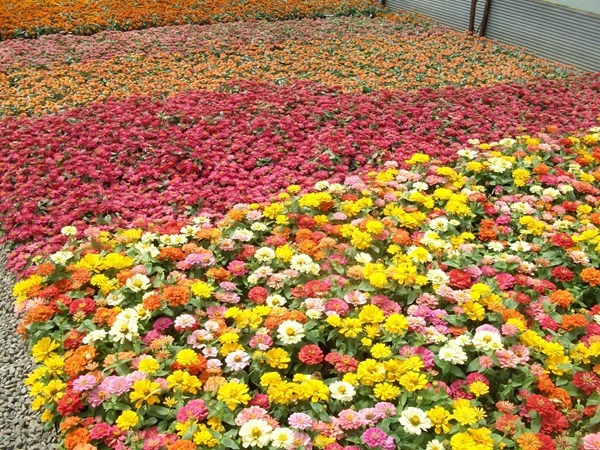 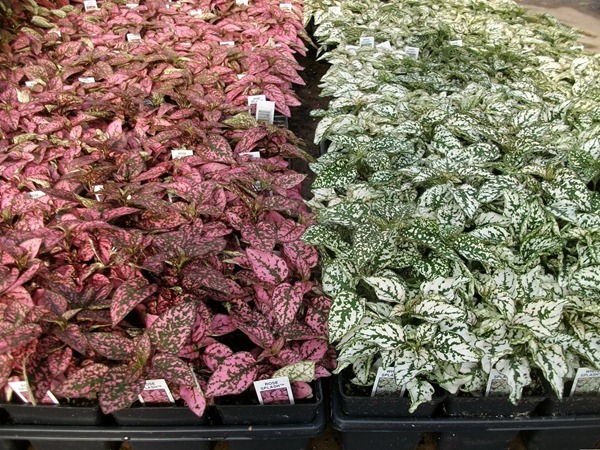 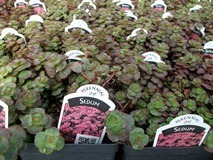 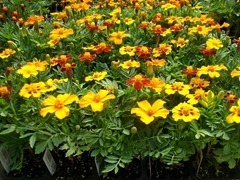 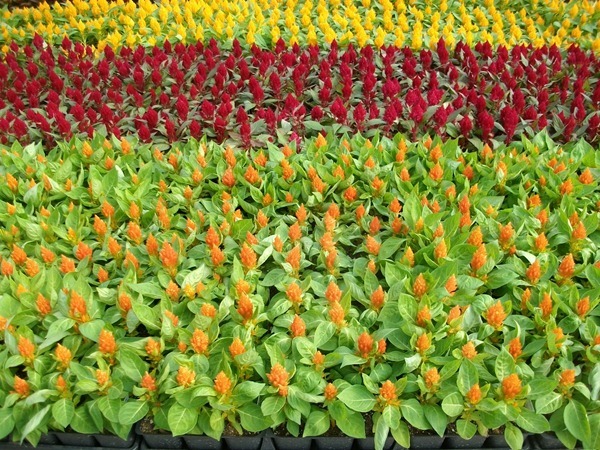 This is just a few of the varieties and colors we have available. 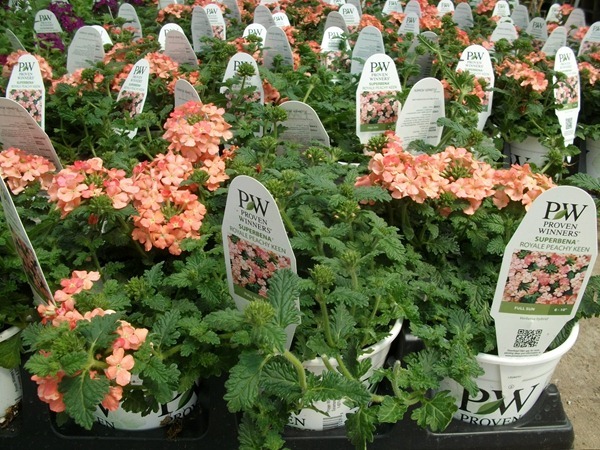 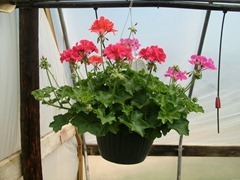 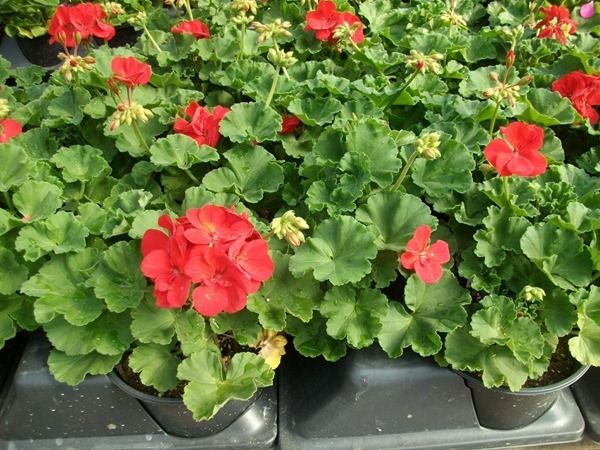 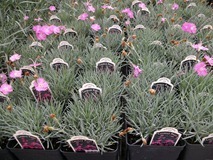 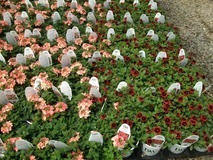 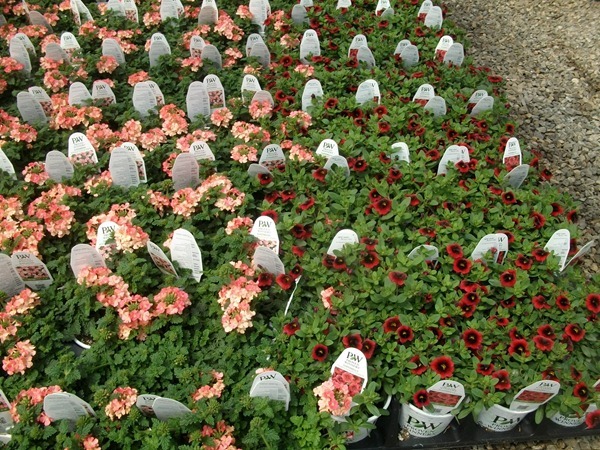 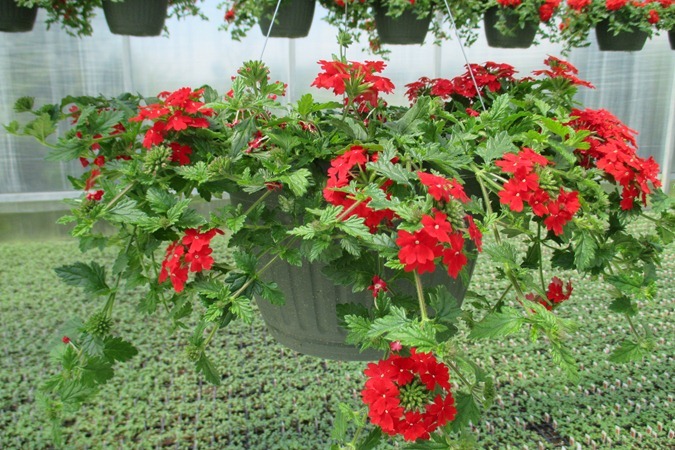 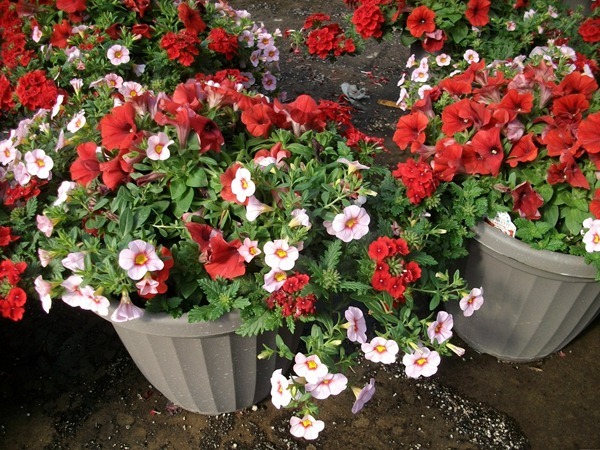 I think the Caliente Geranium Mix basket (mix of coral, rose and lavender) will be a popular items. 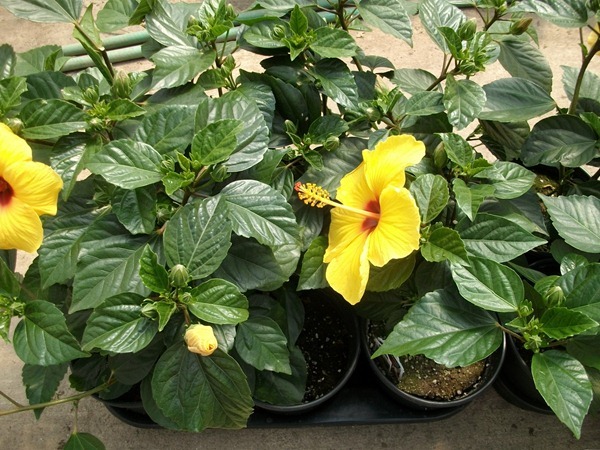 It has such a tropical look that I think will appeal to consumers. 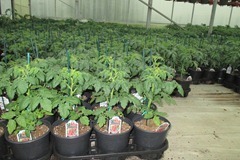 Our #12 Baskets and Deco pots are looking fantastic! 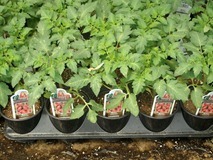 Last up is an assortment of out 1204, 1801 and J6 Annuals. 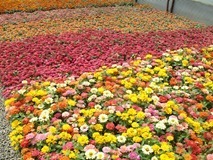 Lots of good color is available. We are into some new crops of 1204 and #4 Charley’s Vegetables too so be sure to check those items out on the availability. 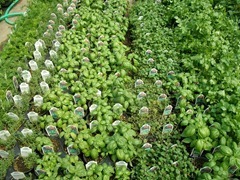 I will get around this weekend and get some more pictures to post on Monday and will be sure to get pics of the vegetables.